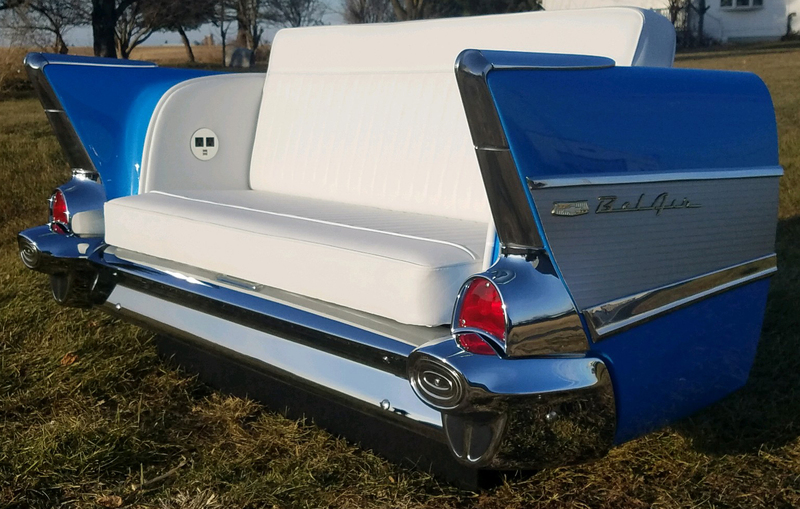 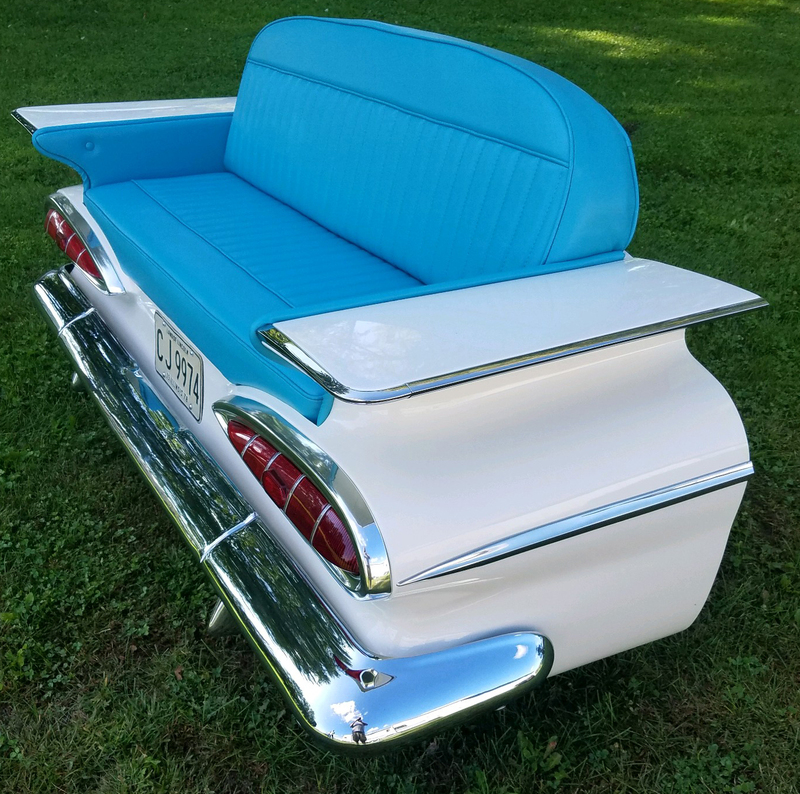 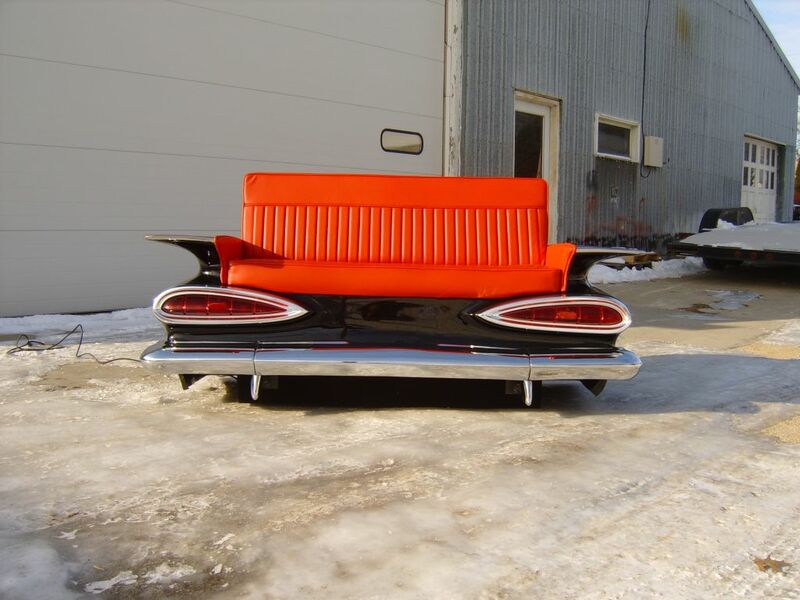 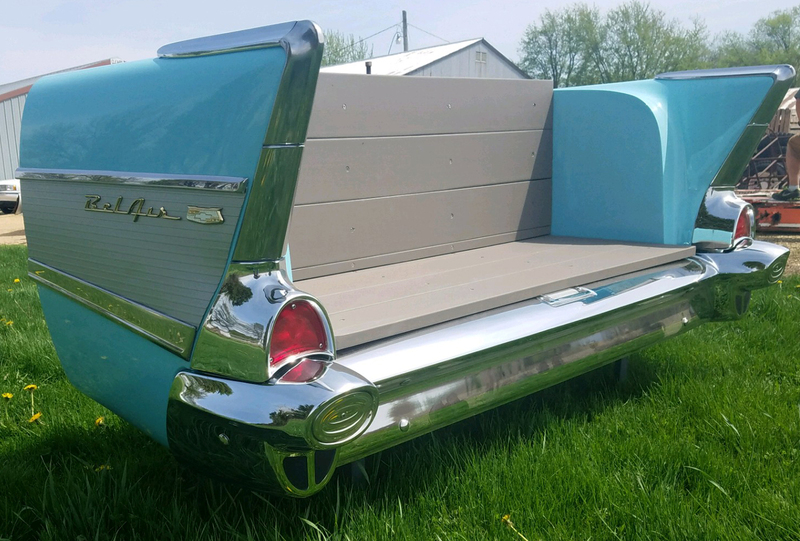 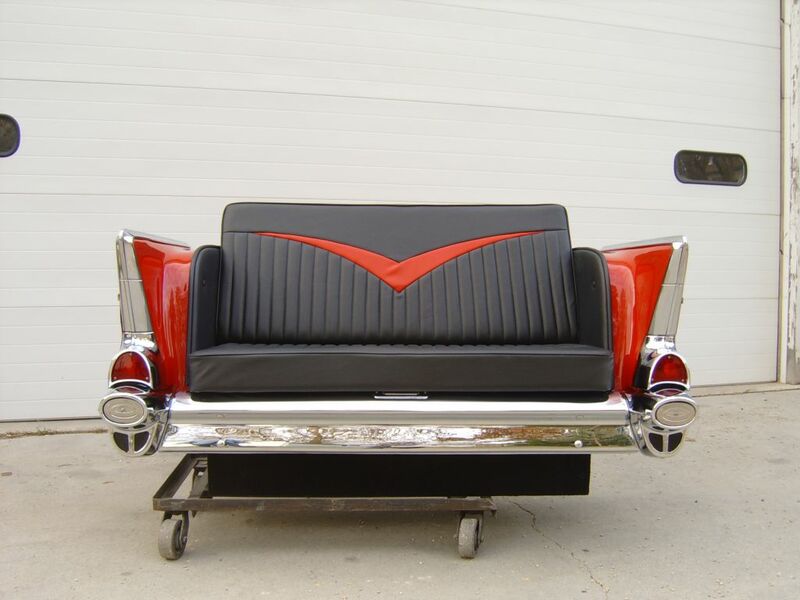 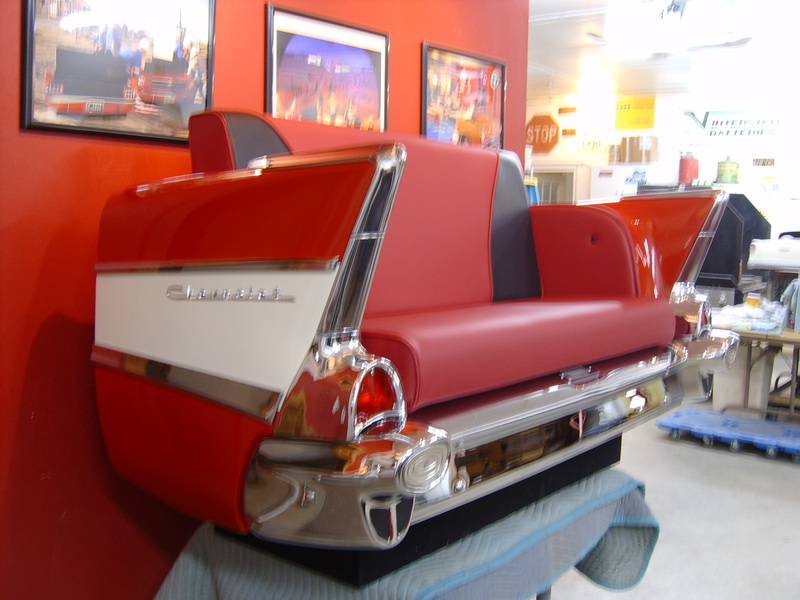 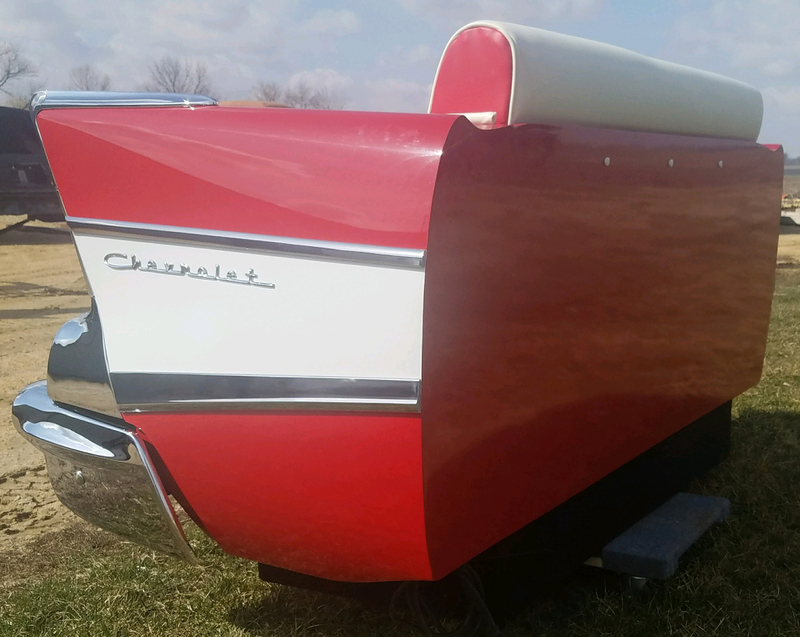 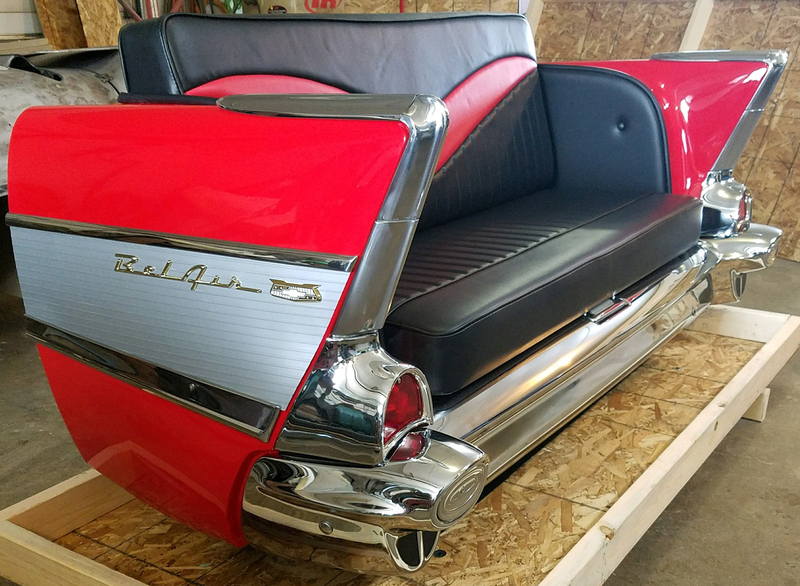 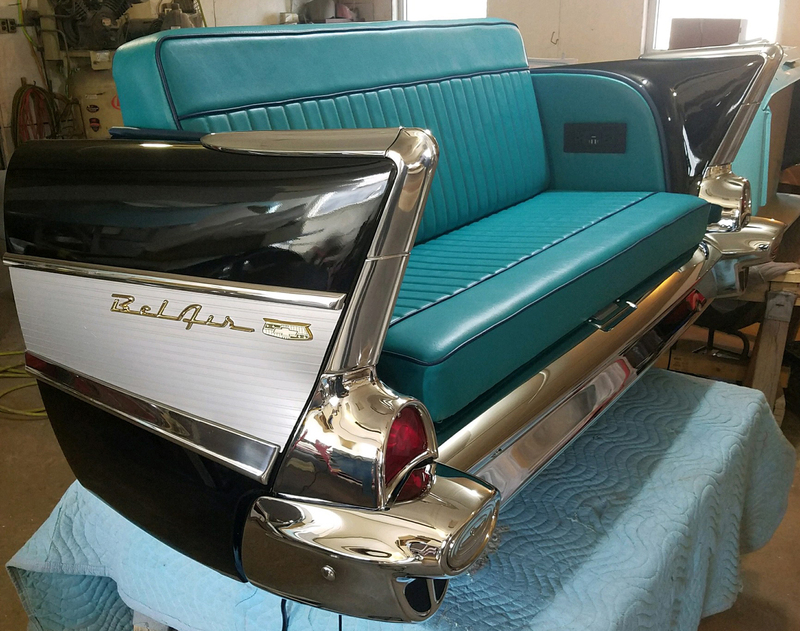 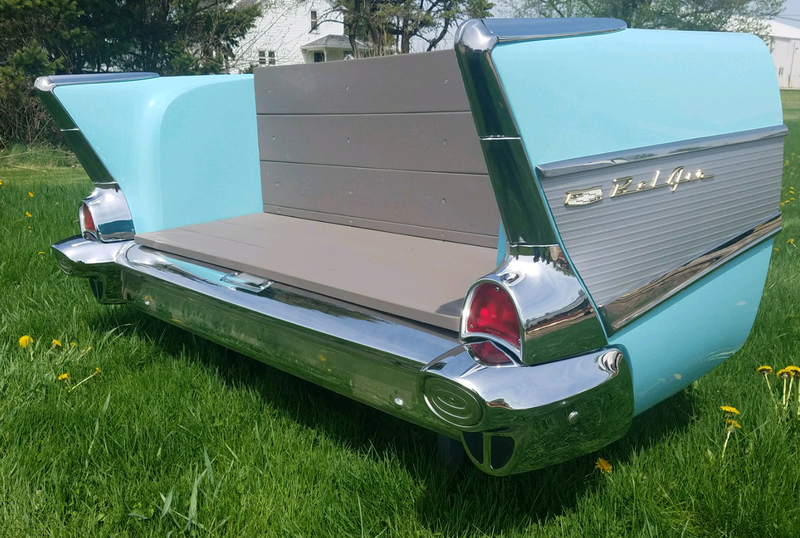 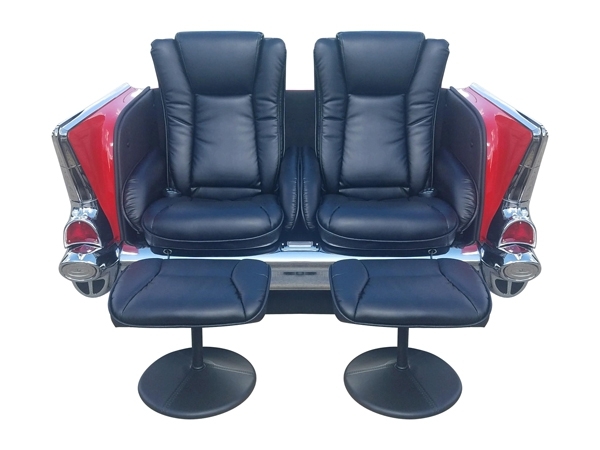 THE ULTIMATE MAN CAVE SPECIAL: This 1957 Chevy Bel Air Rear End Couch has upgraded reclining bucket seats that are heated with full body massage control. 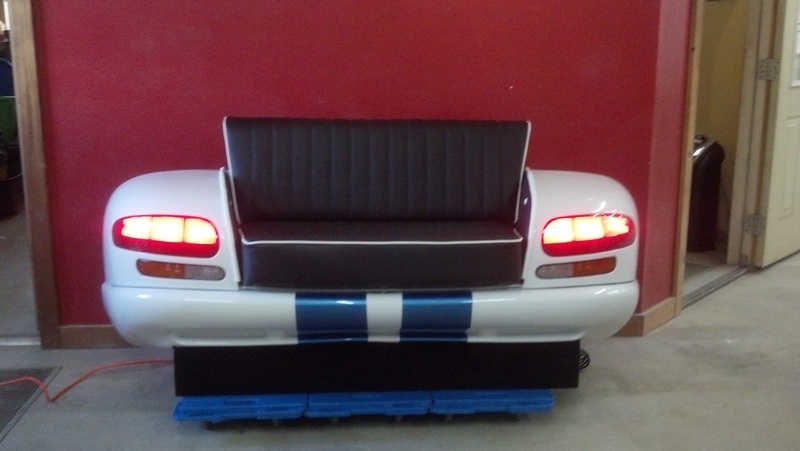 This comes with ambiance lighting underneath and working tail lights. 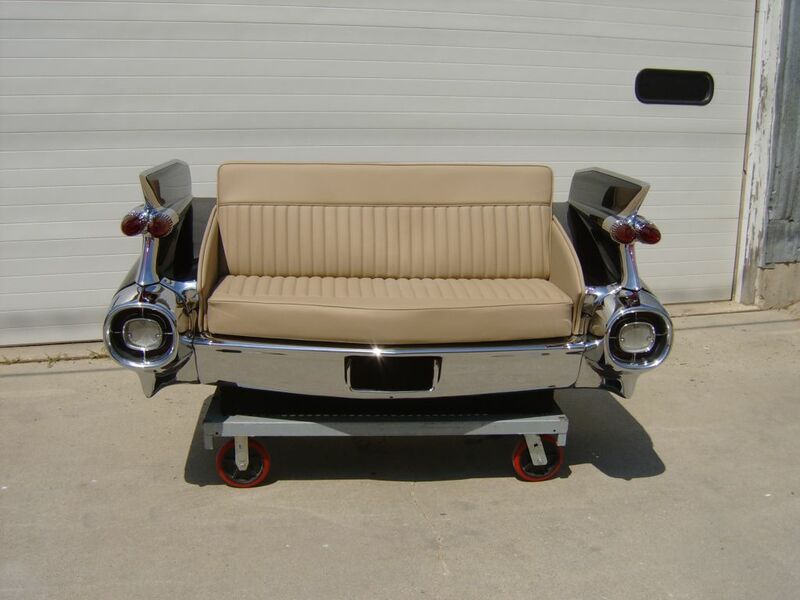 Also, this car couch comes with two foot rests. 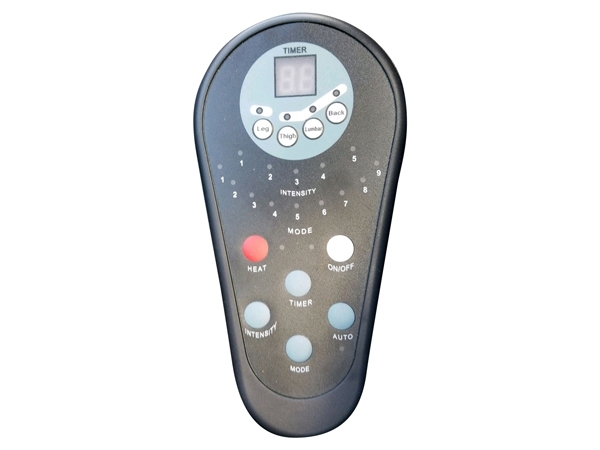 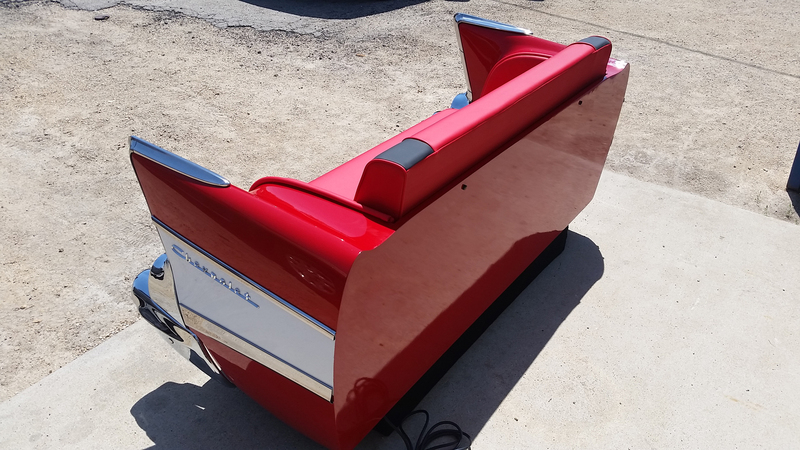 This unit is available for immediate shipping while supplies last. 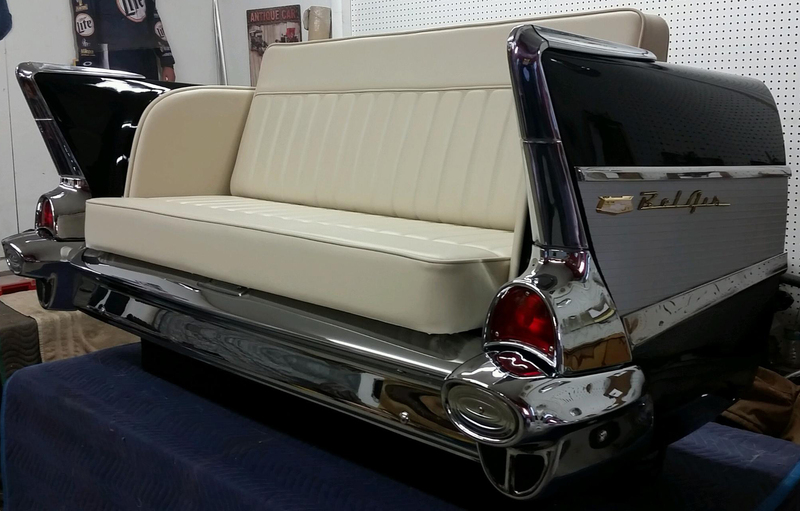 The chrome work is perfect. 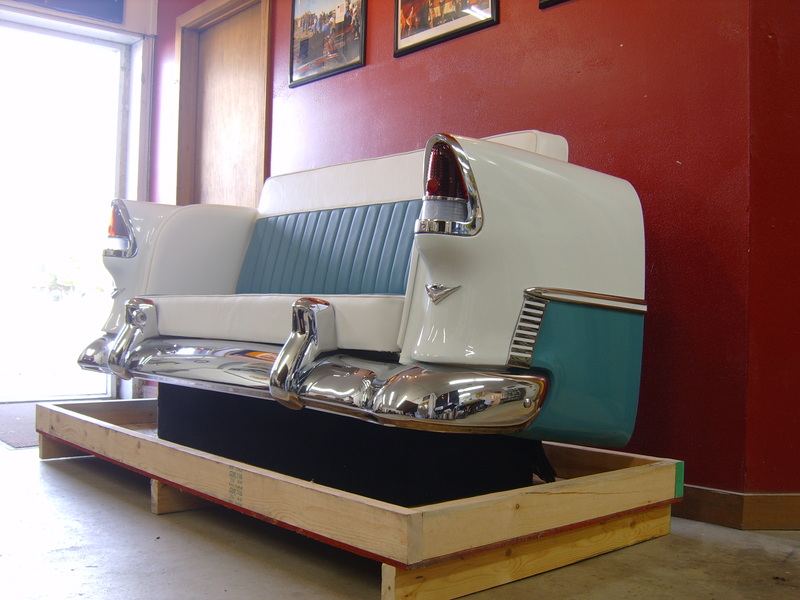 This can be yours for only $9,500.00 USD EA with free crating and free shipping in the CONUS. 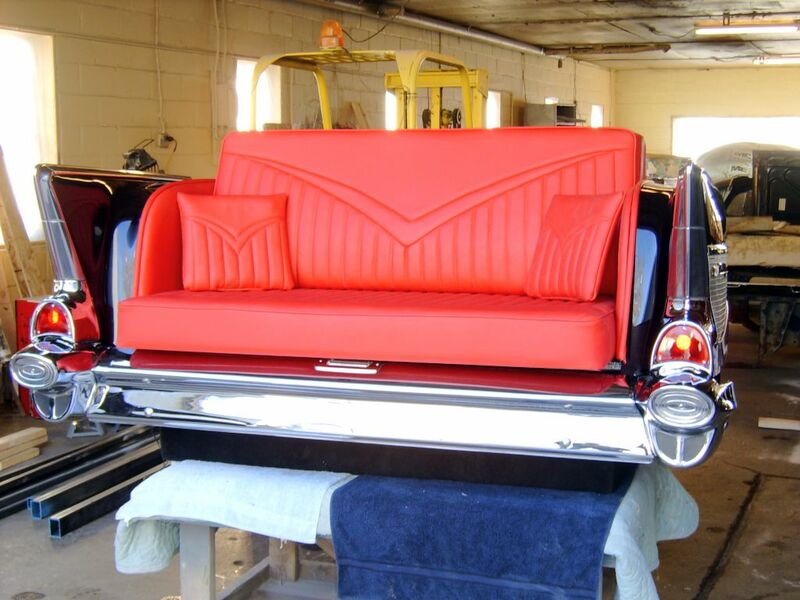 This makes a perfect Holiday gift! 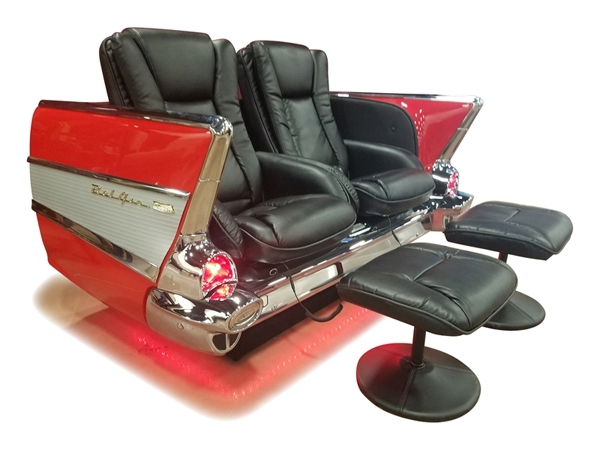 Please CLICK HERE to buy this on AMAZON or to give us a call anytime to order this couch for your own ultimate man cave or movie theater. 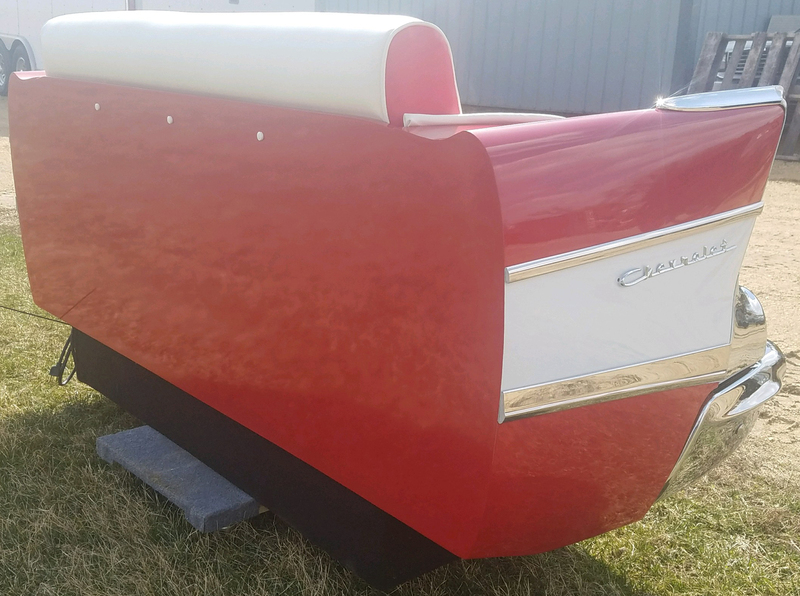 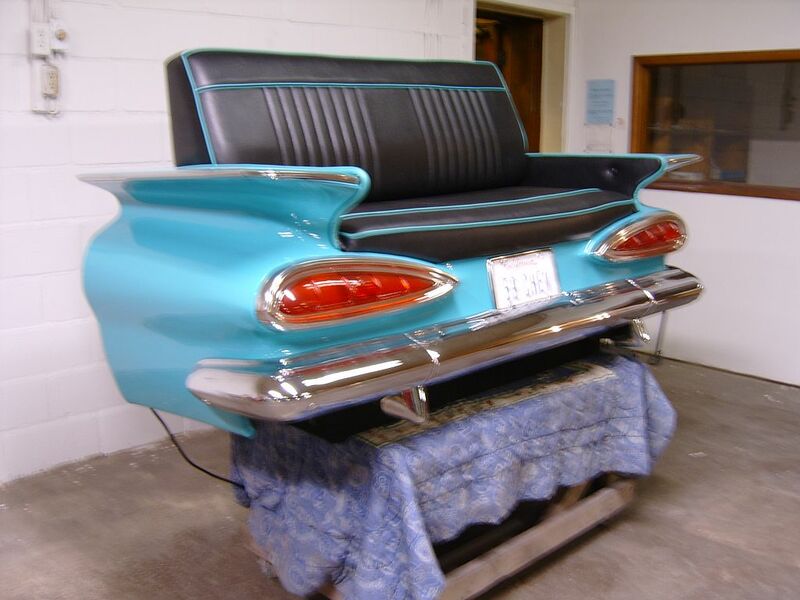 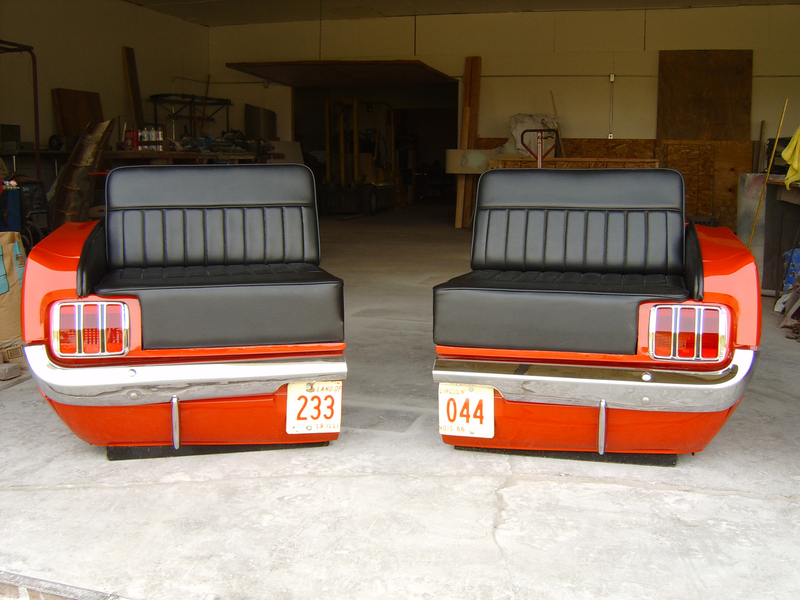 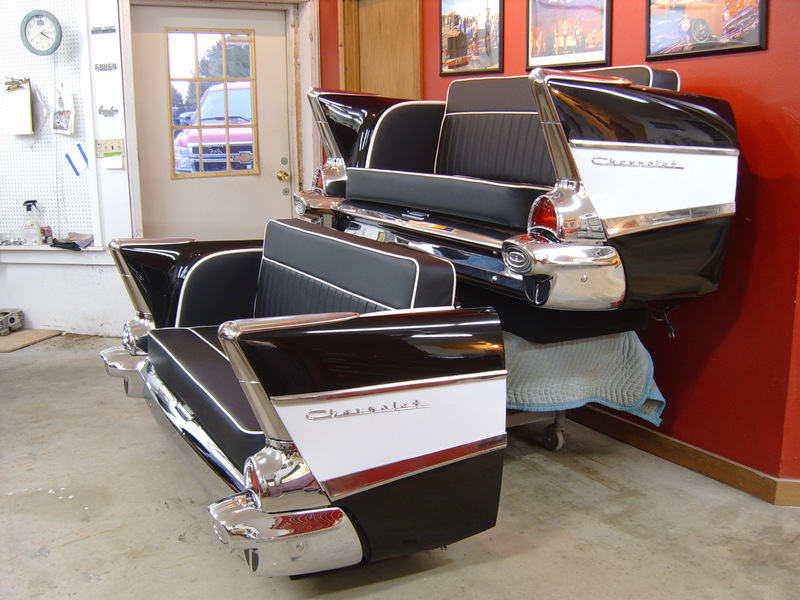 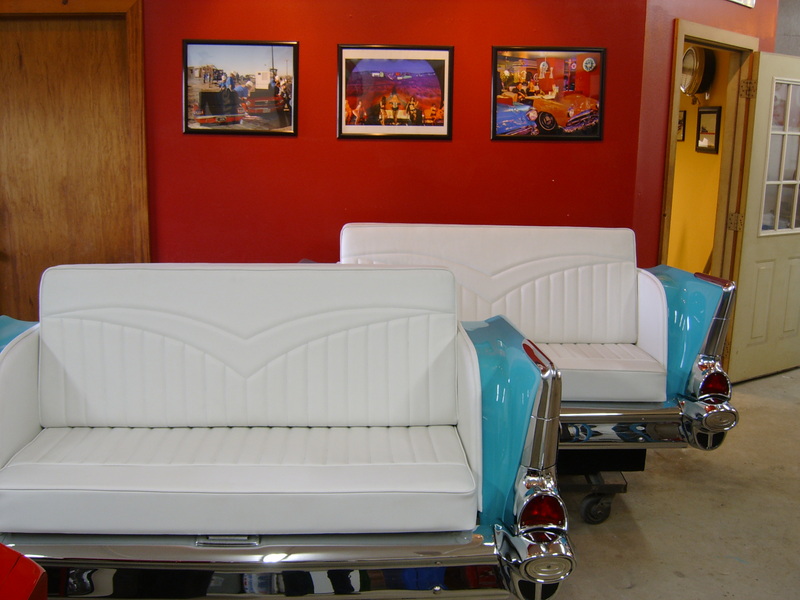 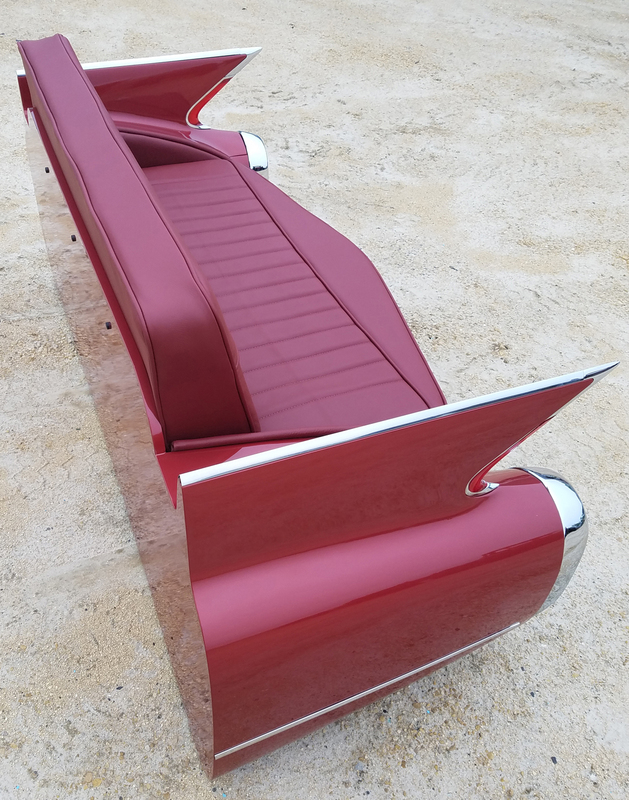 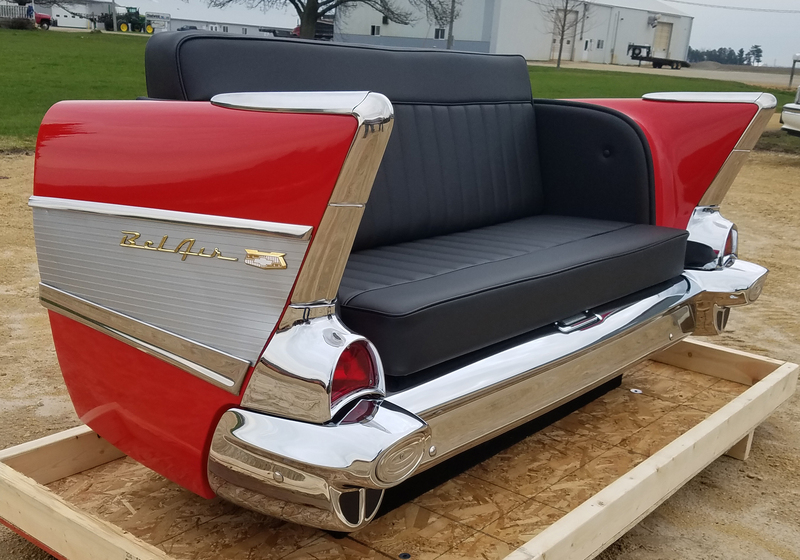 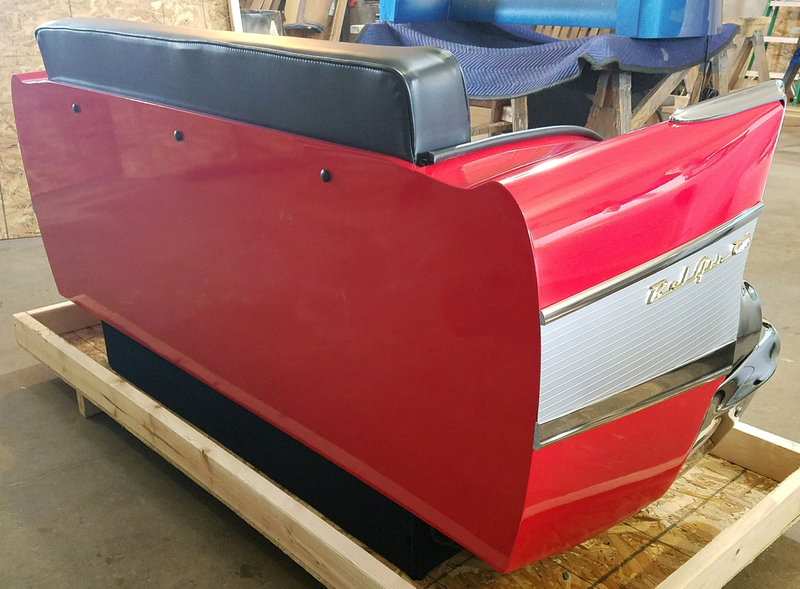 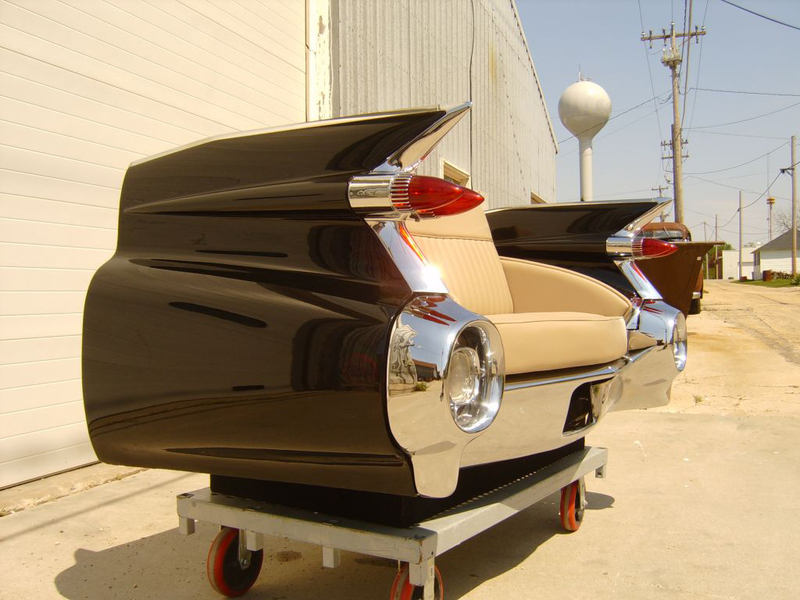 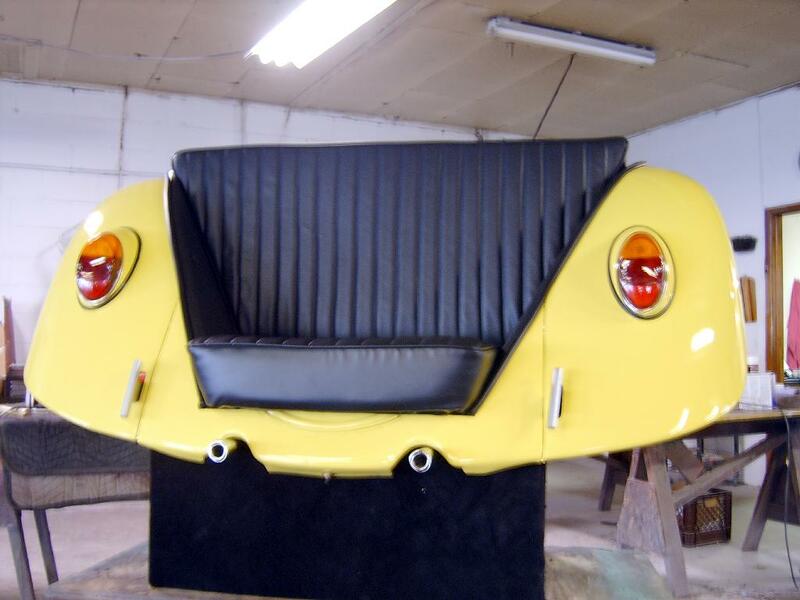 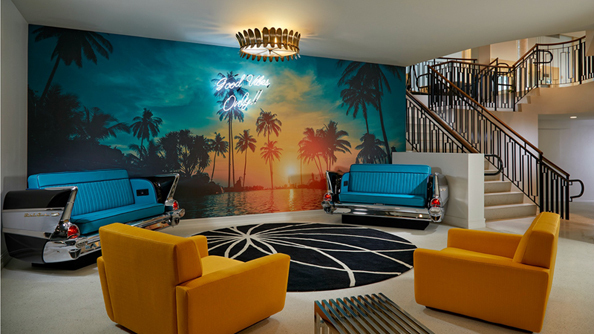 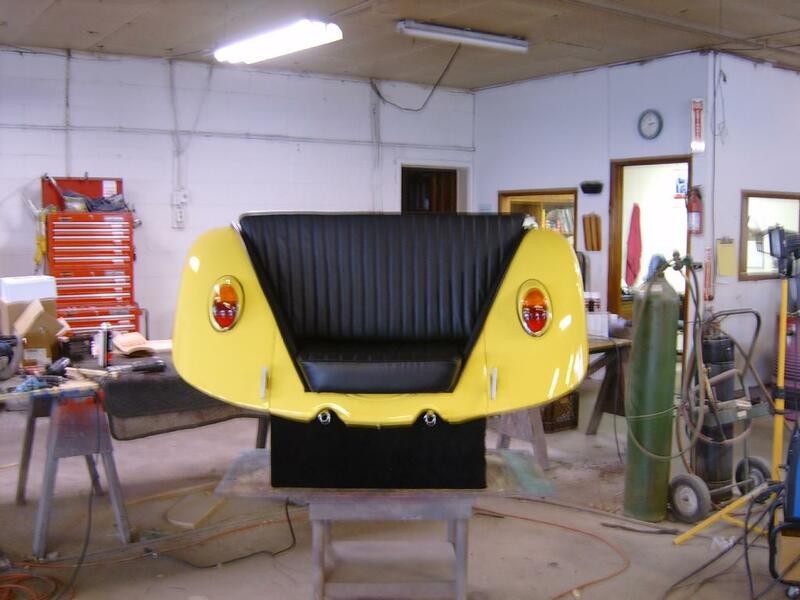 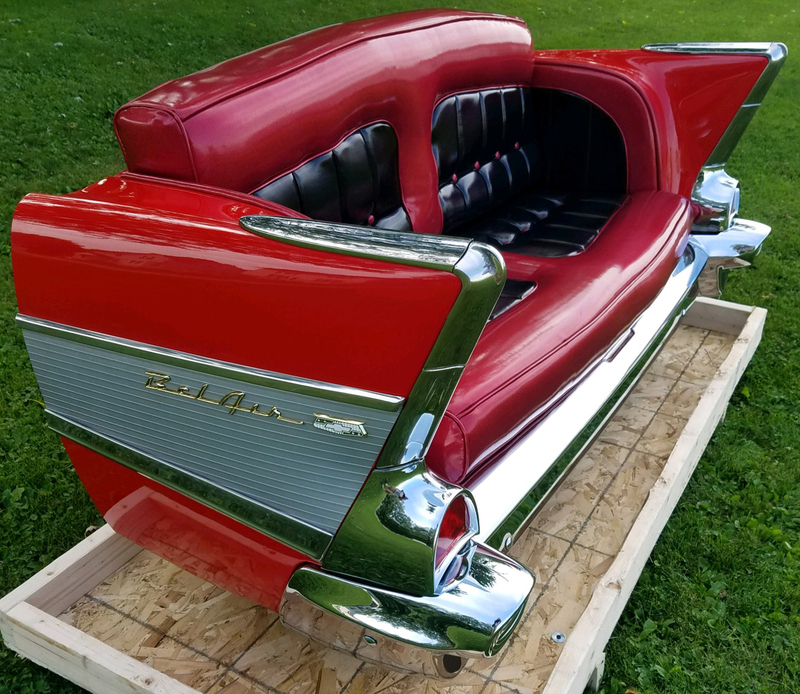 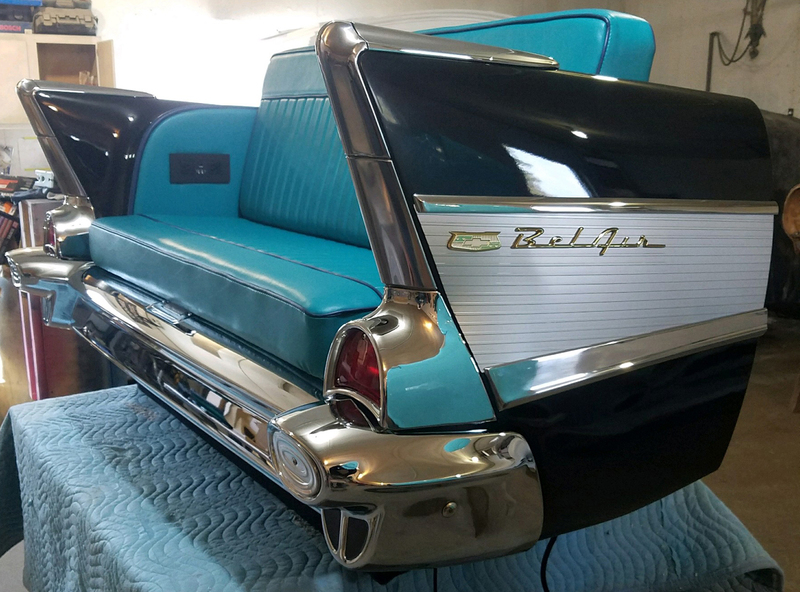 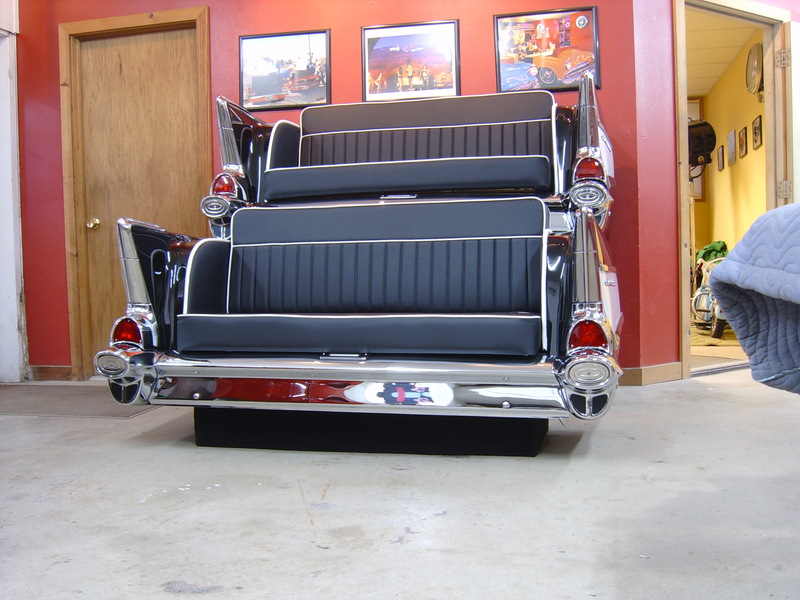 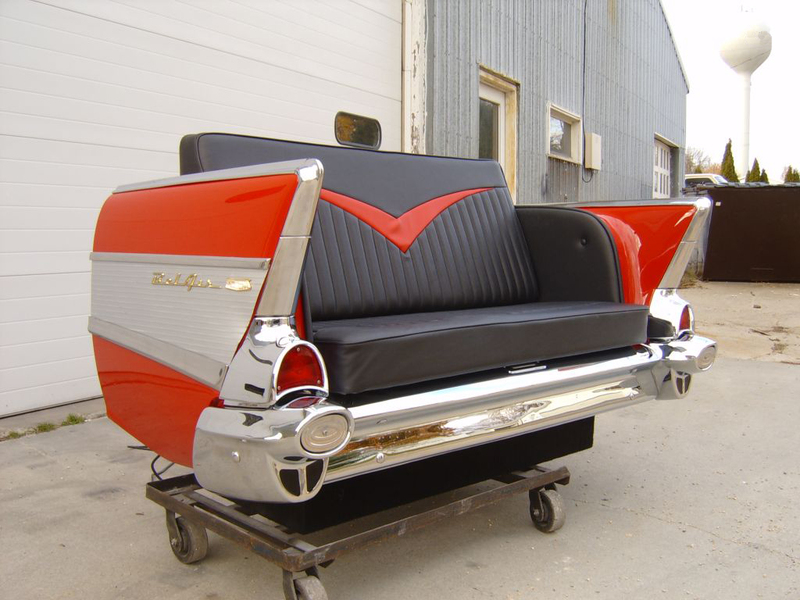 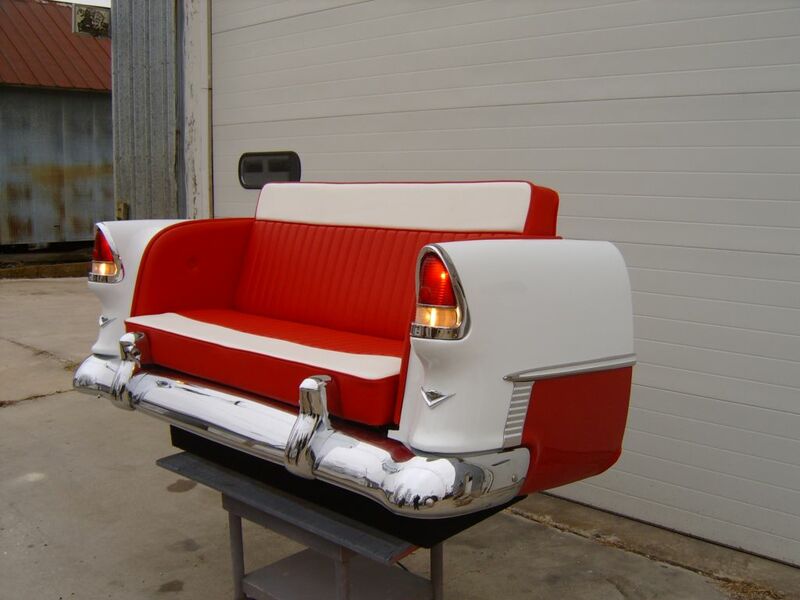 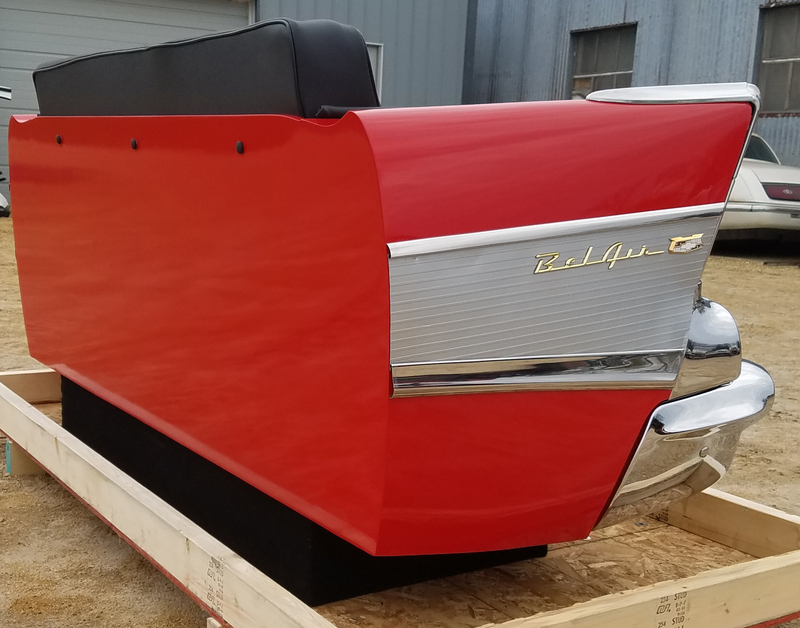 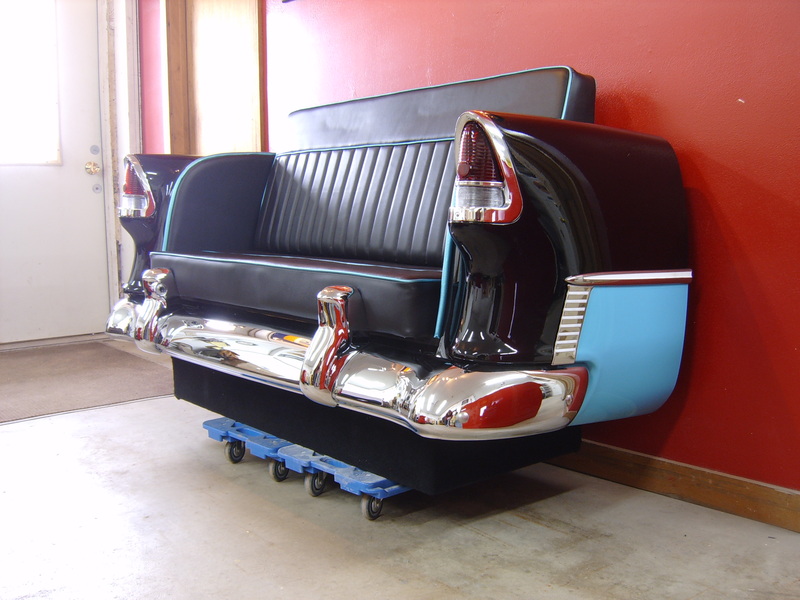 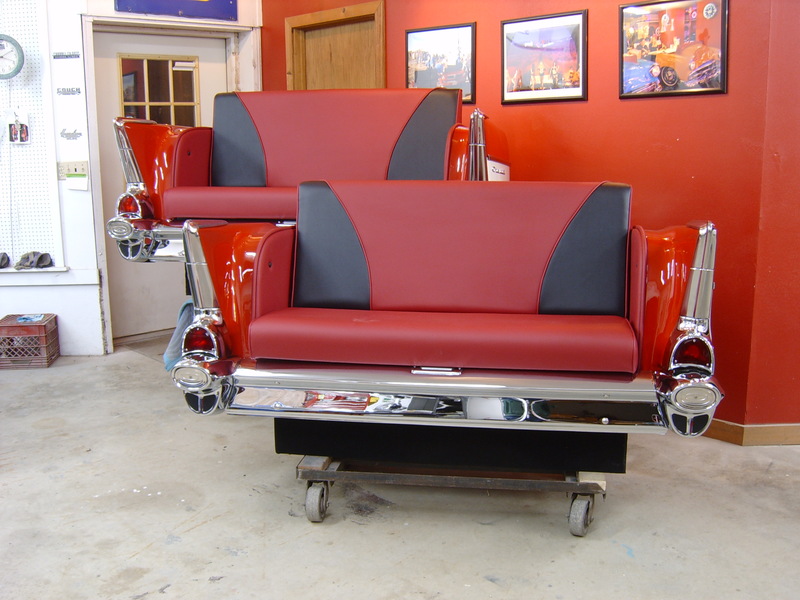 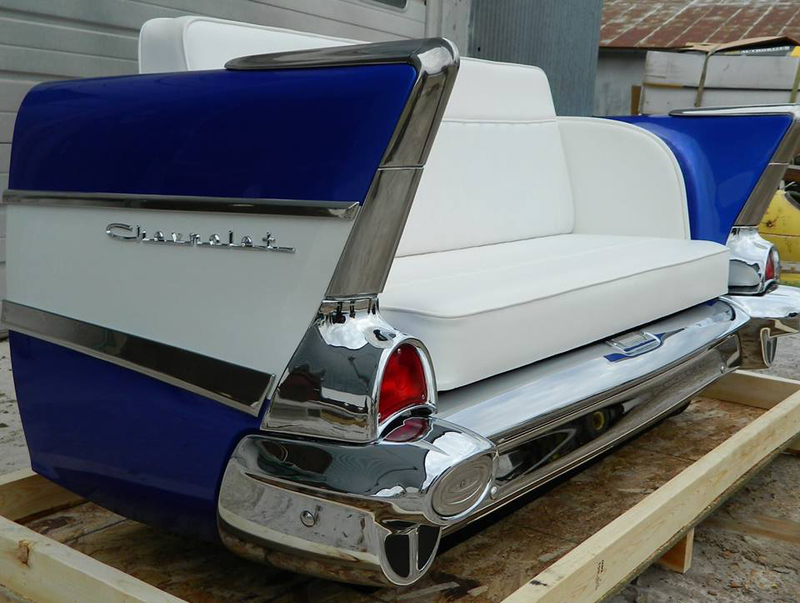 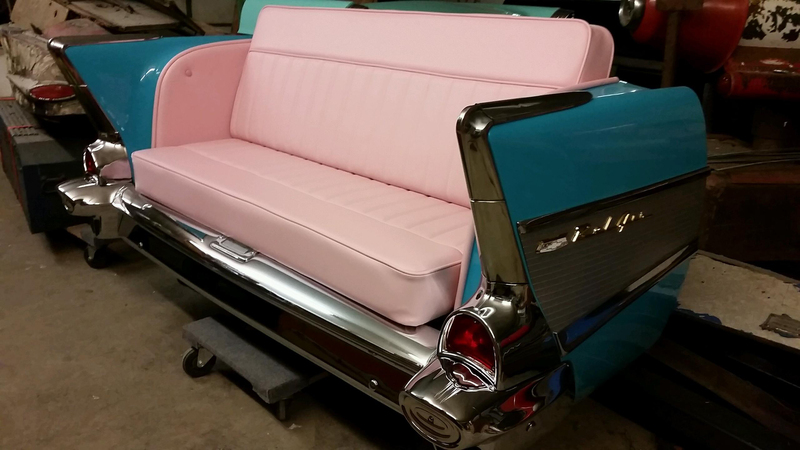 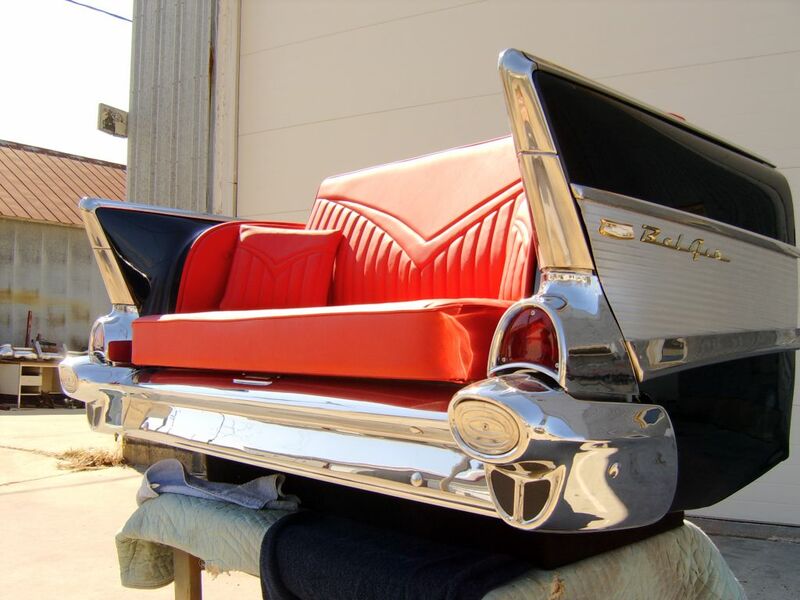 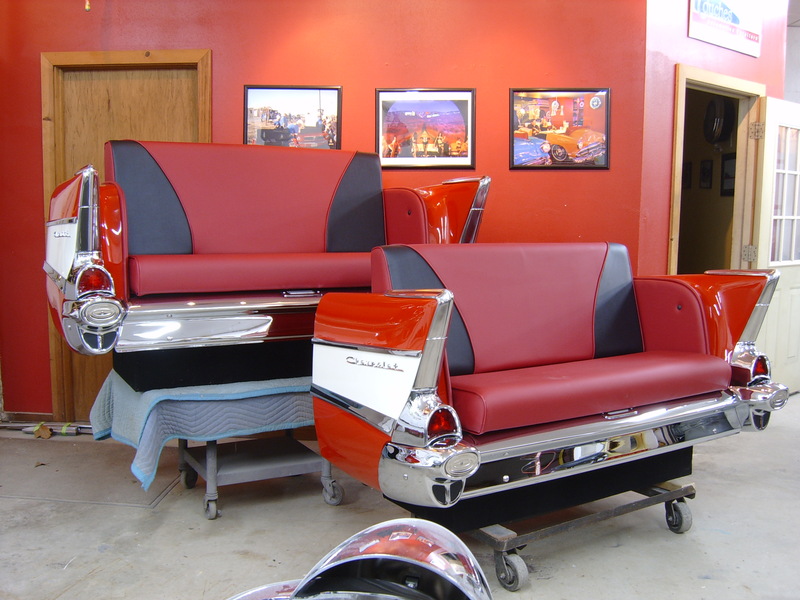 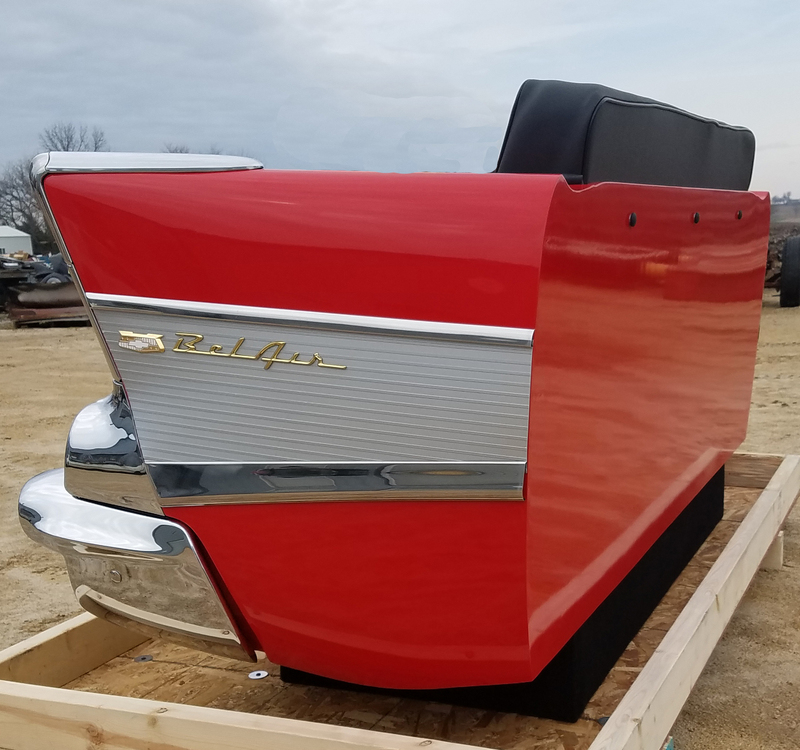 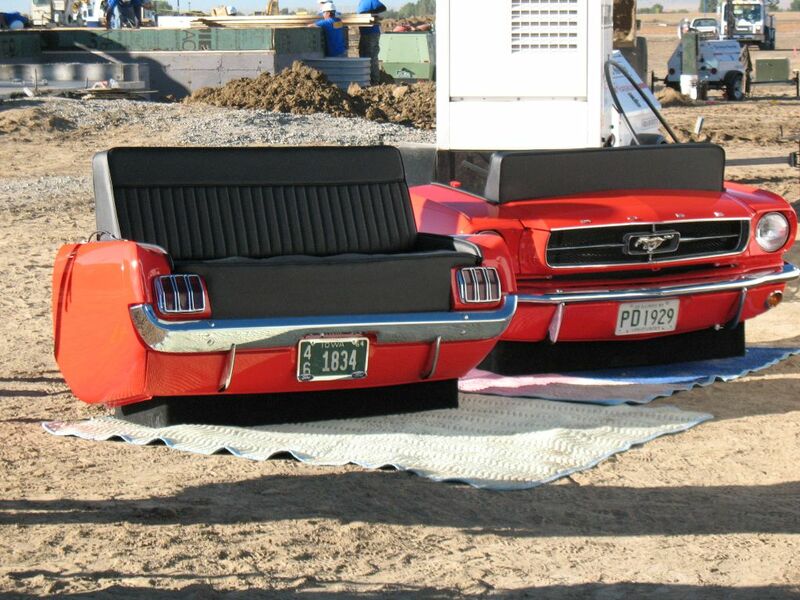 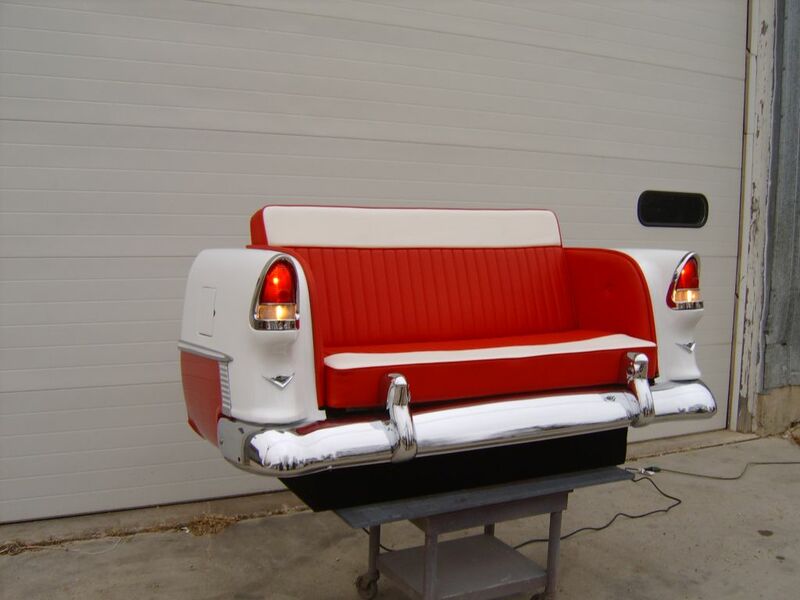 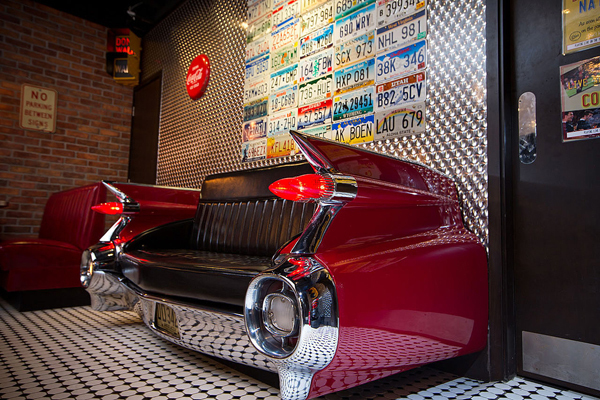 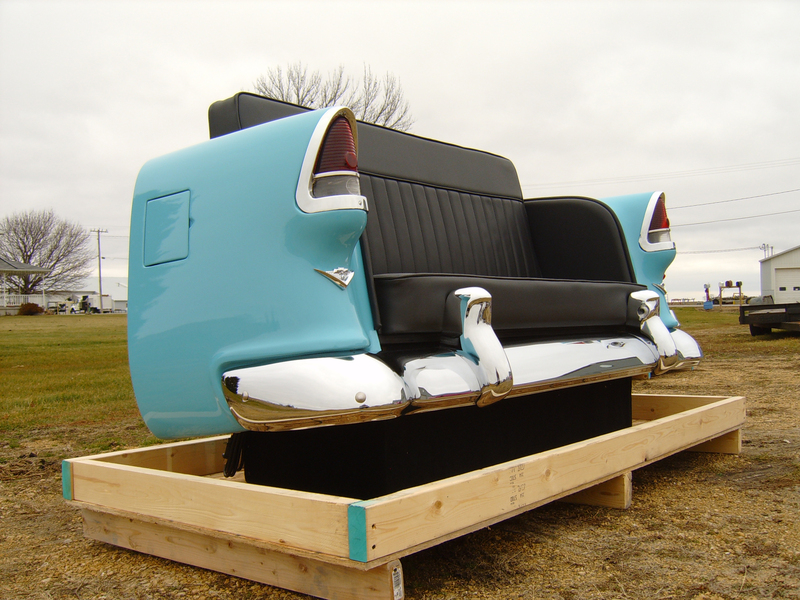 COOL PROJECT SALE: These twin classic 1957 Chevy Bel Air Rear End Couches were made for the Hard Rock Hotel located in Daytona Beach, FL. 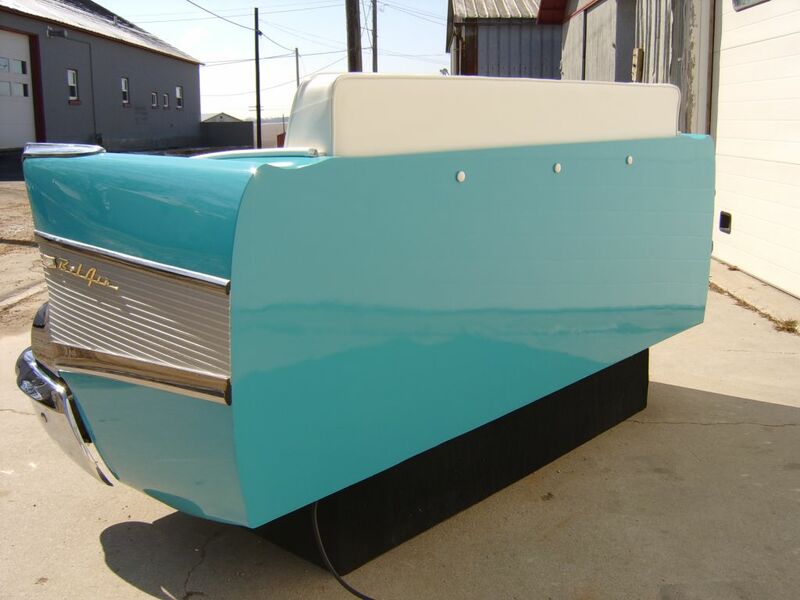 We can build one of these for you in about 4-6 weeks. 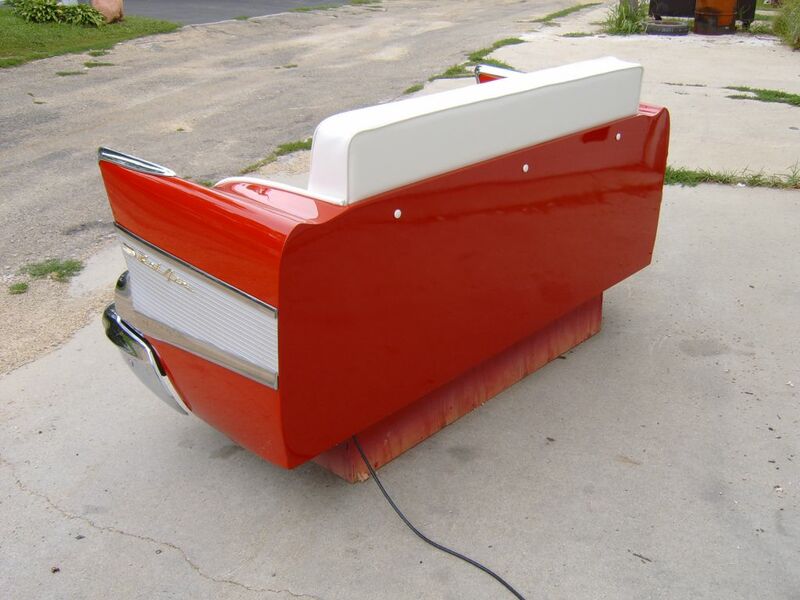 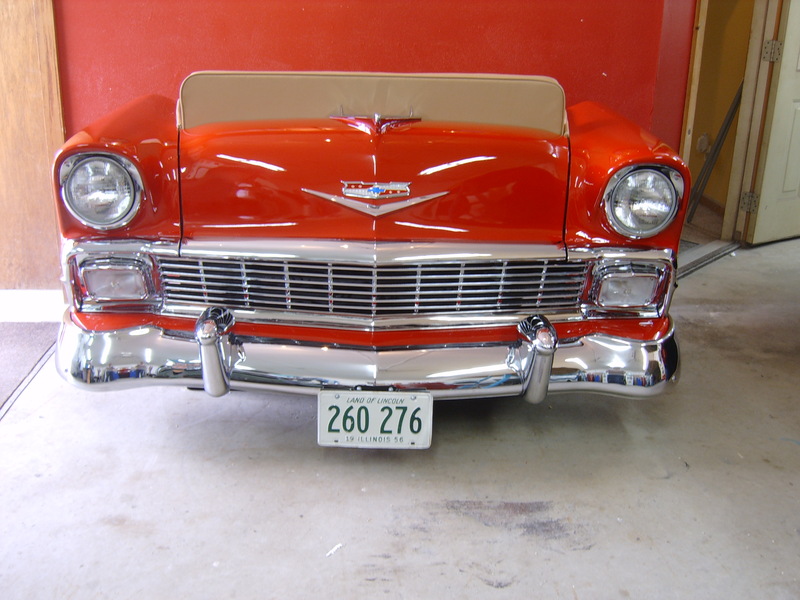 The chrome work is perfect and we can paint one in the color of your choice. 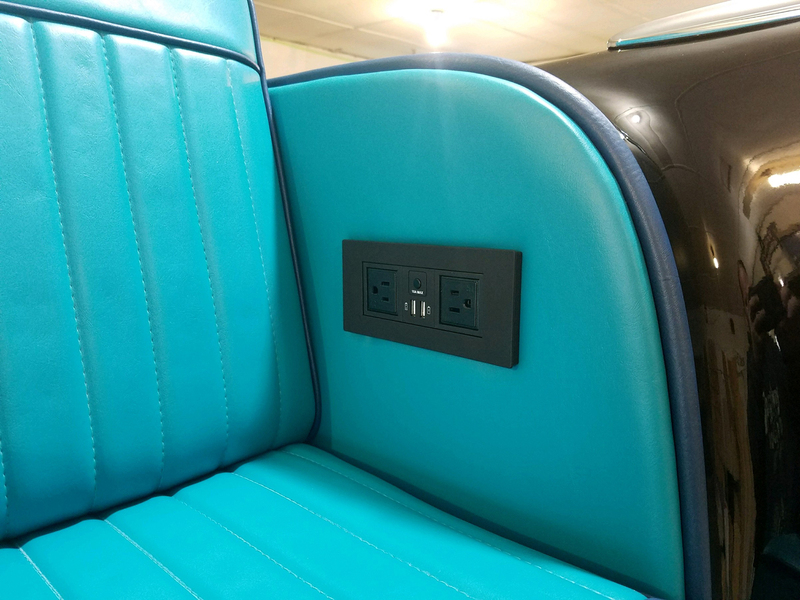 These couches have optional Power/USB Hubs on each side (add $150) This can be yours for only $7,810.00 USD EA plus $300 for crating plus shipping costs. 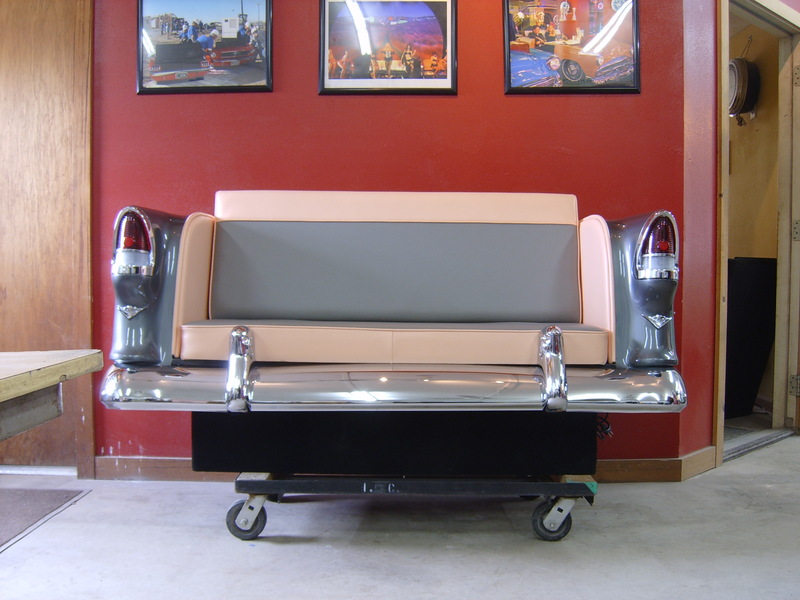 Please call us today to order one of these couches for your own. 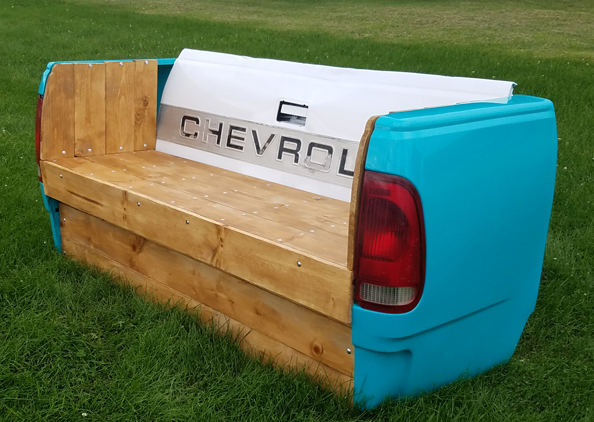 NEW CREATION SALE: This is our latest creation featuring a Classic 50's Chevy Truck to create our Classic Truck Tail Gate Wooden Bench. 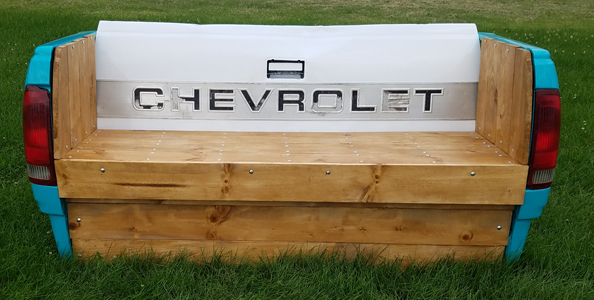 Shown in a rustic patina paint job, this bench can be made in your color(s) of choice with LED Tail Lights. 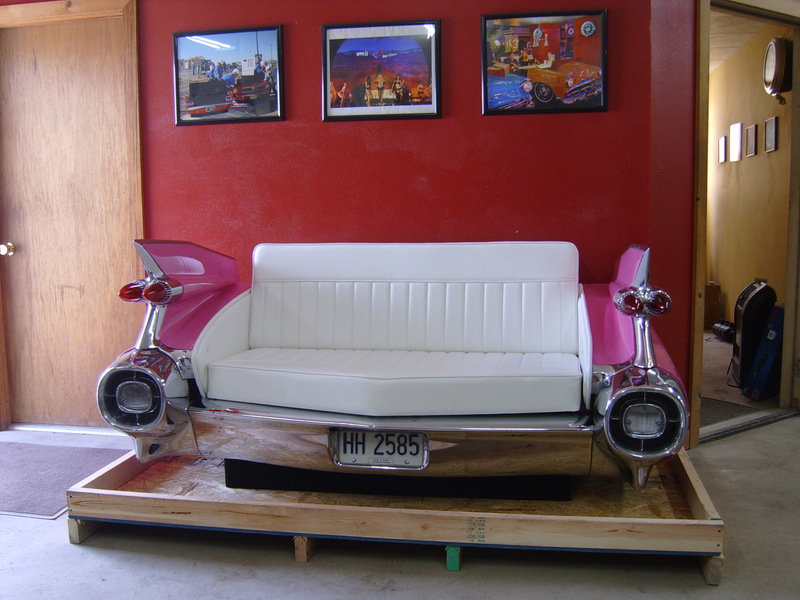 This being for sold for a discounted price of only $4,000.00 USD plus $300.00 for crating plus shipping. 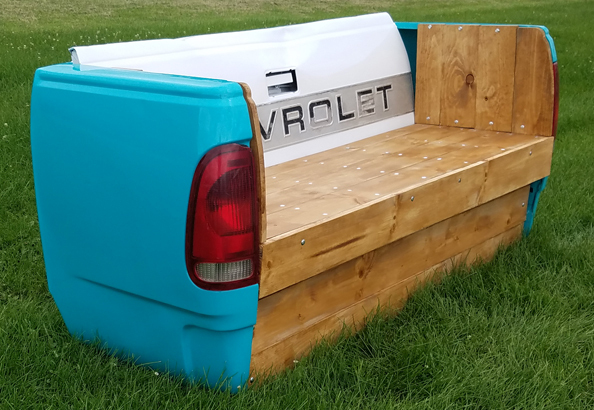 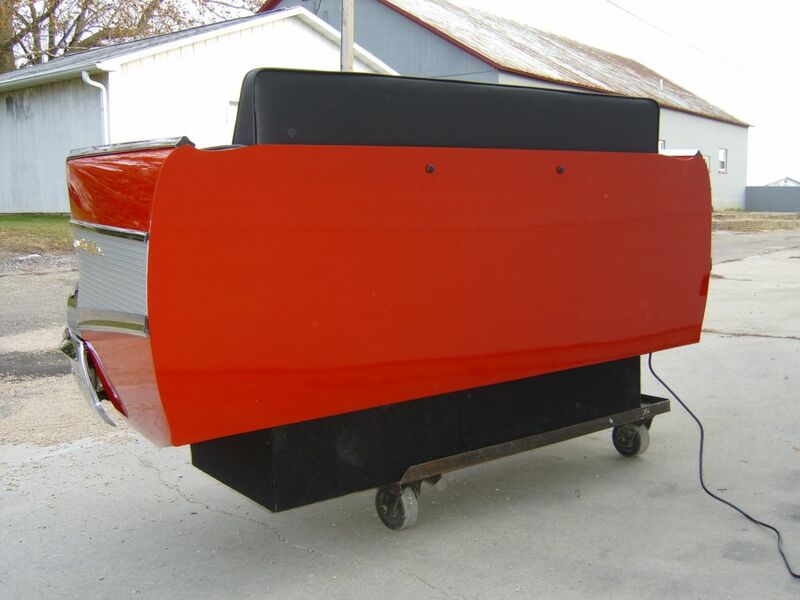 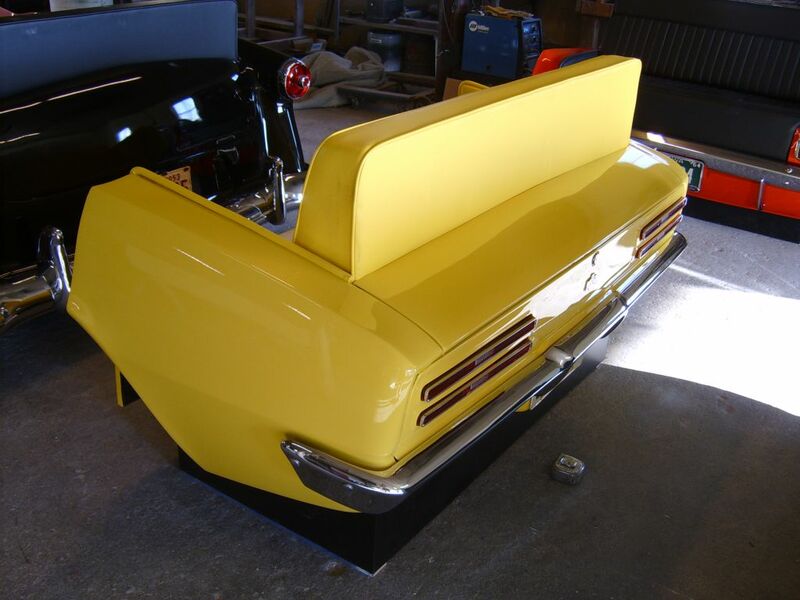 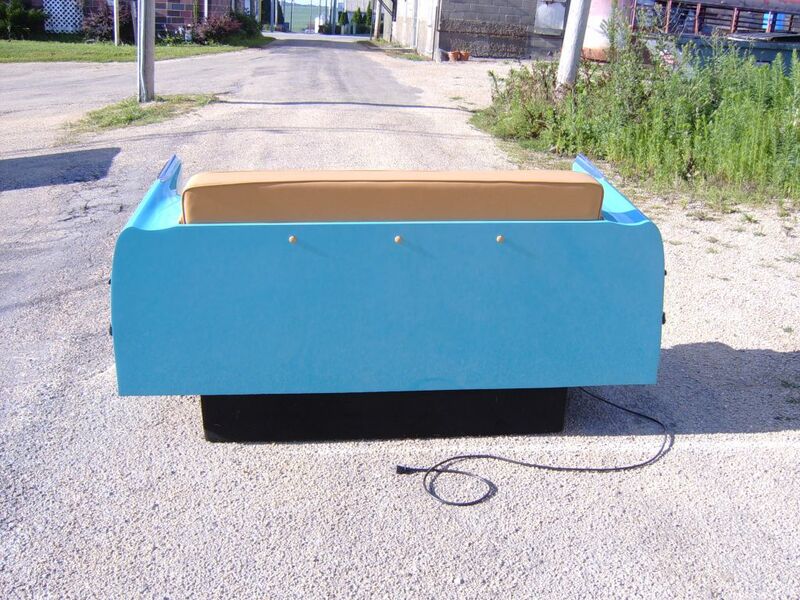 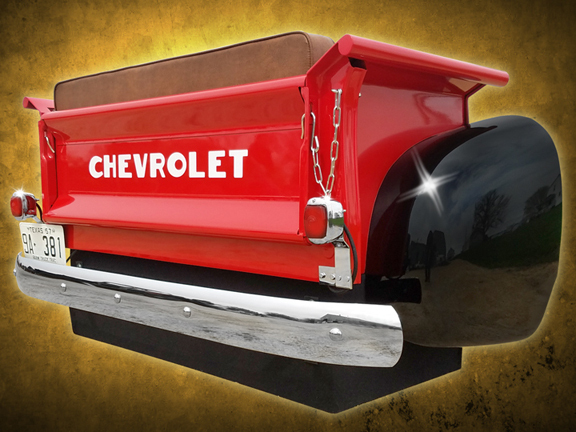 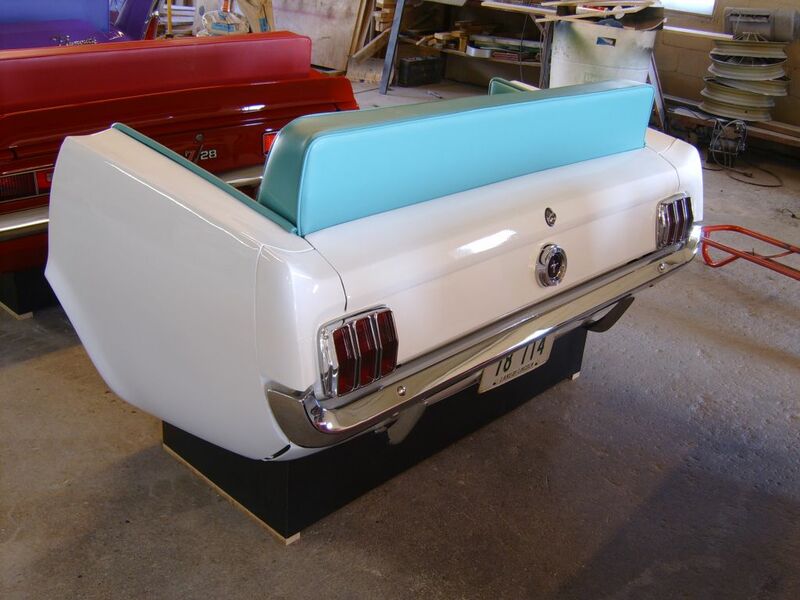 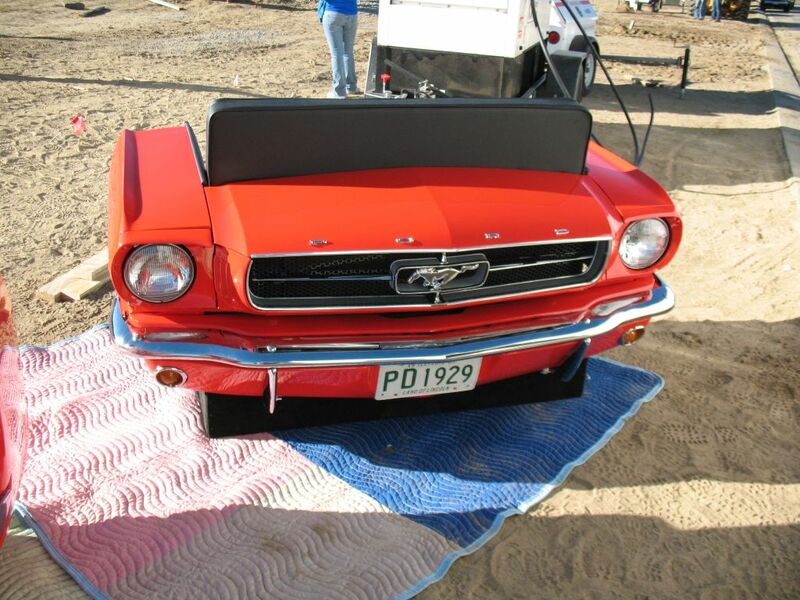 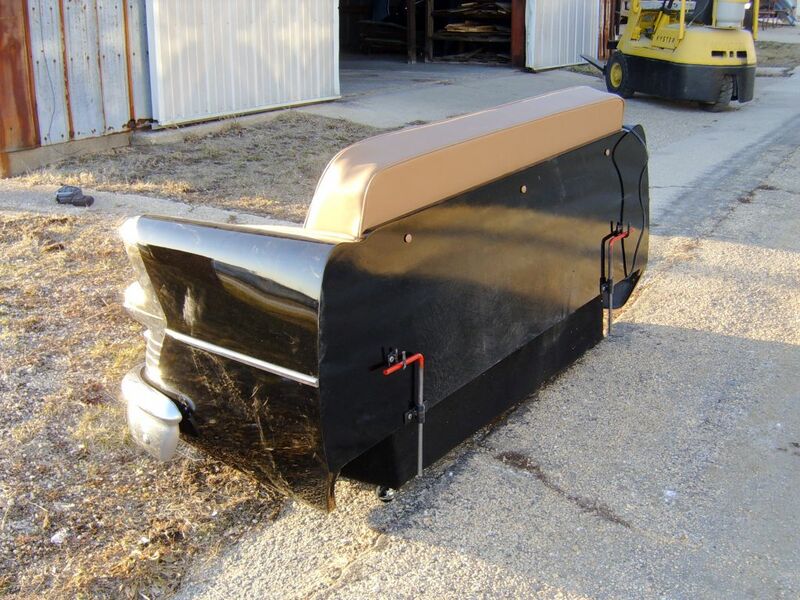 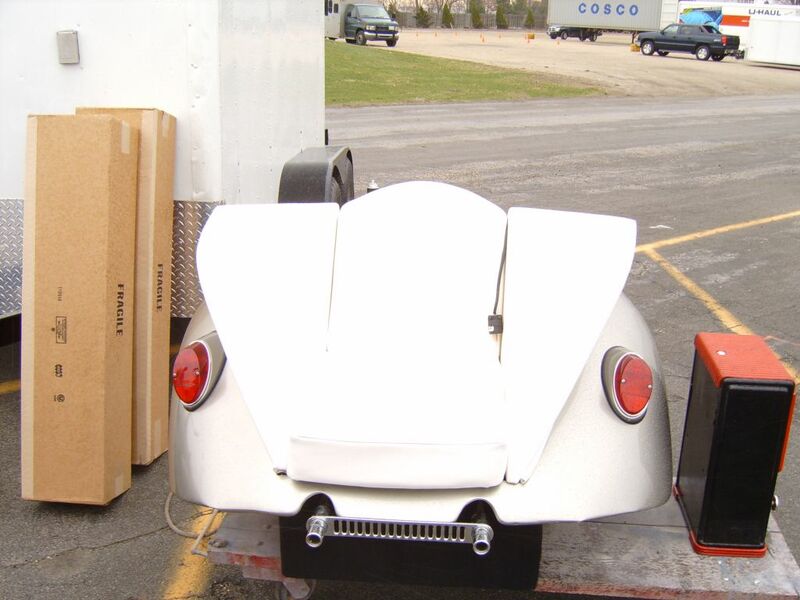 Please allow 5-6 weeks for us to build you a custom Classic Truck Tail Gate Wooden Bench. 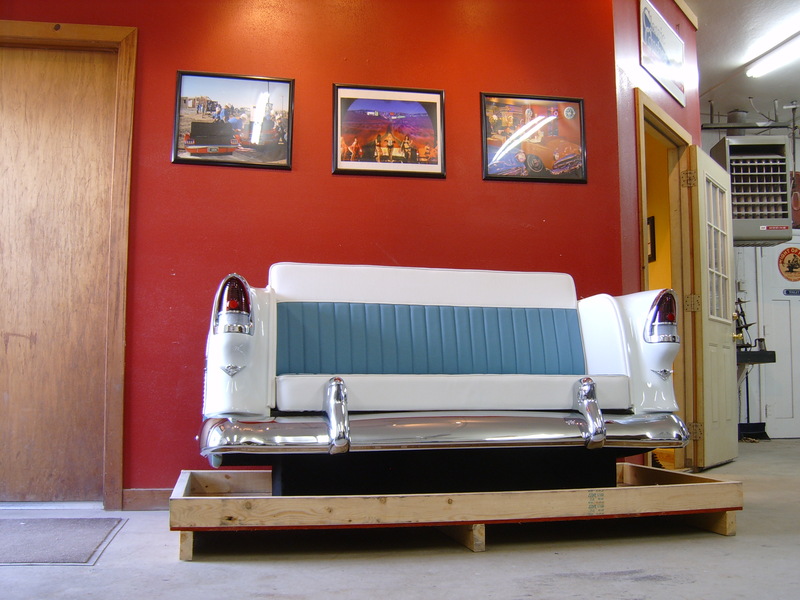 NEW CREATION SALE: This is our latest creation featuring a Classic 50's Chevy Truck to create our Reverse Rear End New Retro Truck Couch. 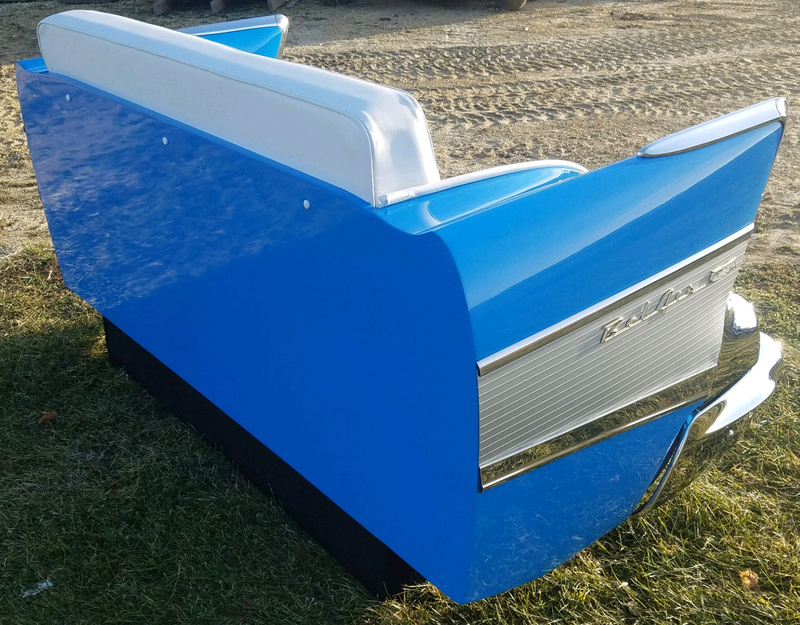 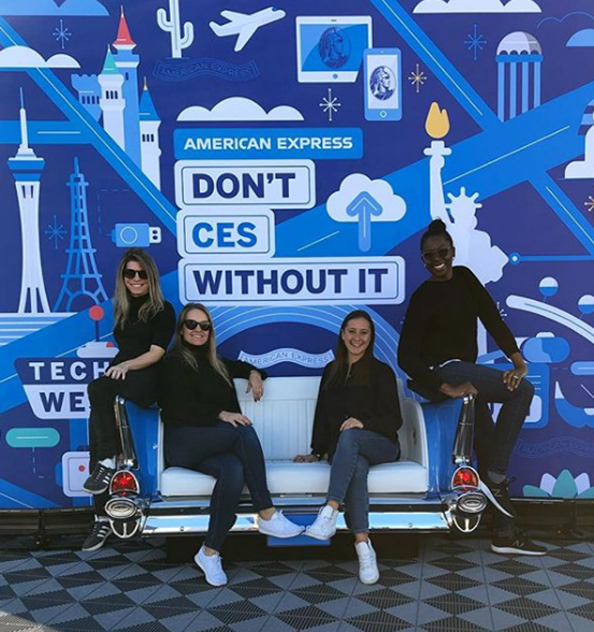 We use a straight non-embossed tailgate so we can put FORD, DODGE, CHEVROLET, GMC, or whatever name you want on the gate. 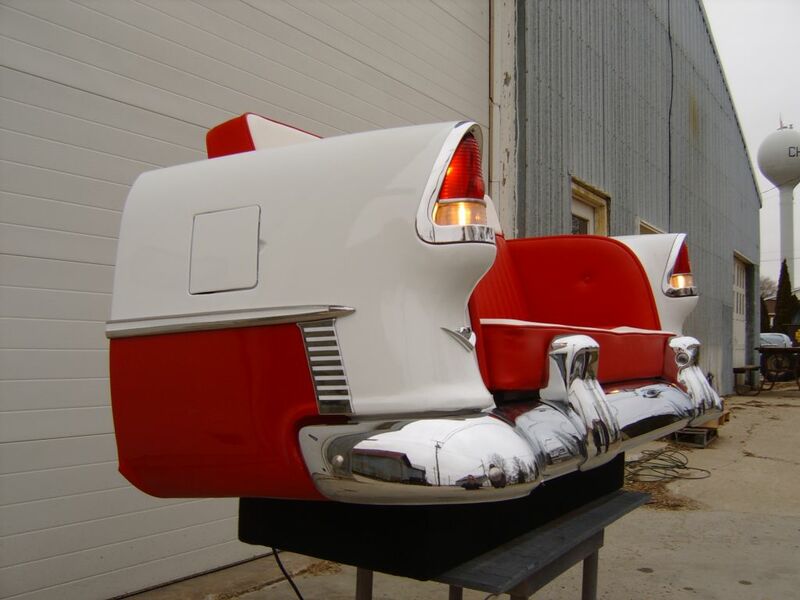 Made in your color(s) of choice with LED Lights. 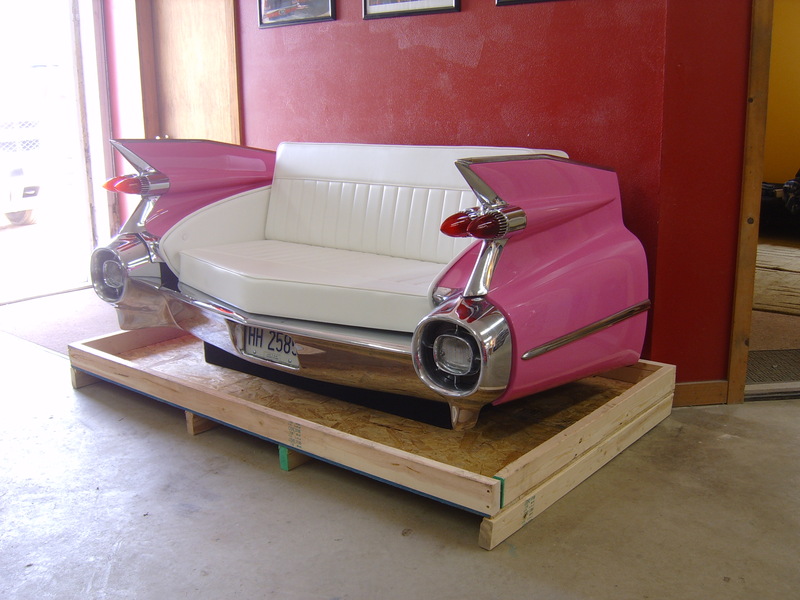 This being for sold for a discounted price of only $7,600.00 USD plus $300.00 for crating plus shipping. 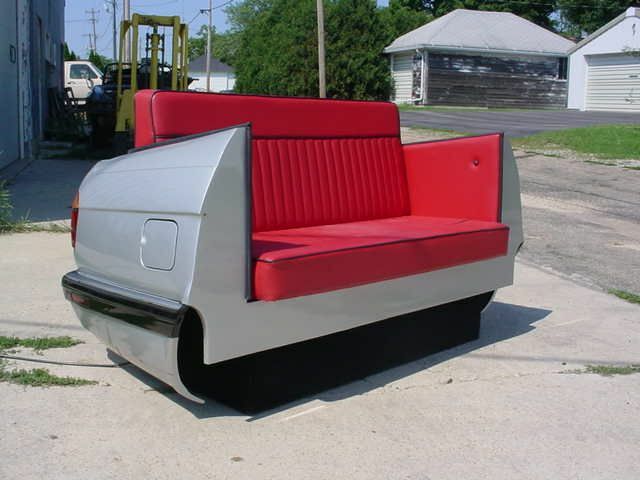 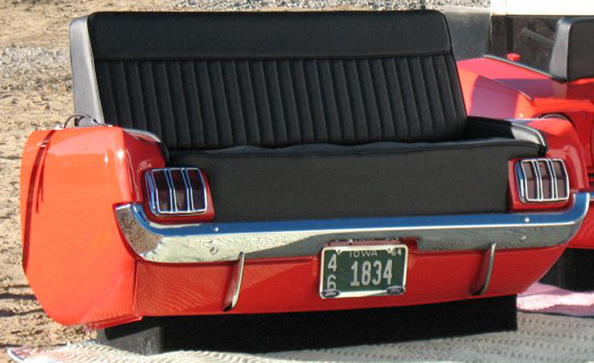 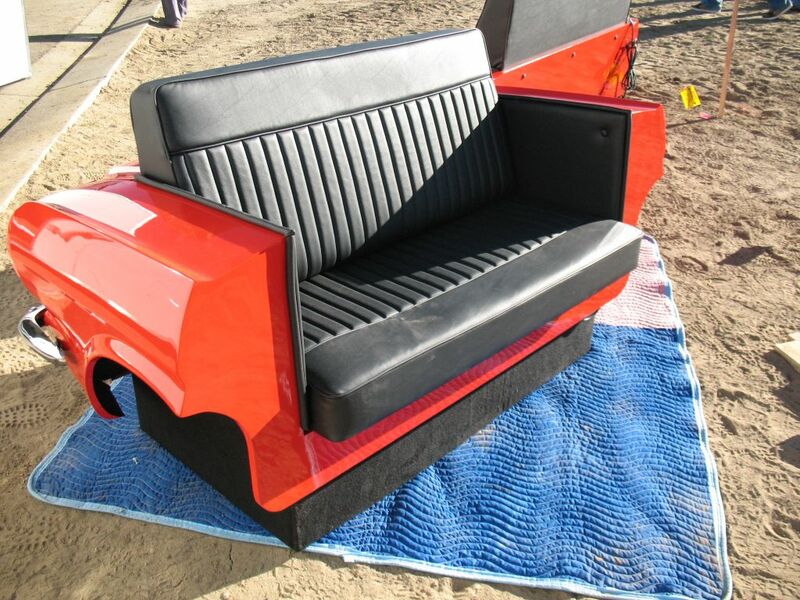 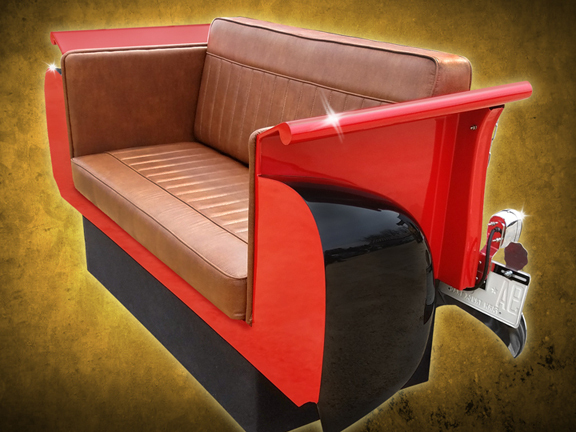 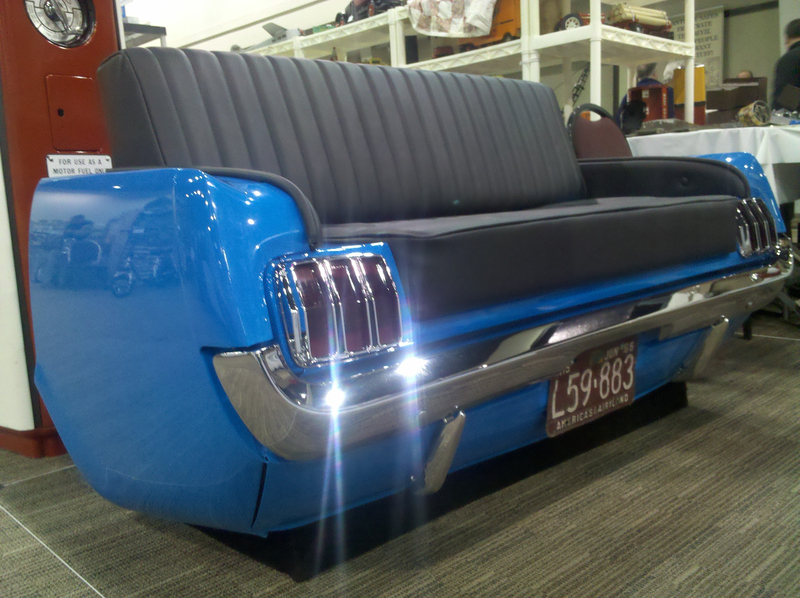 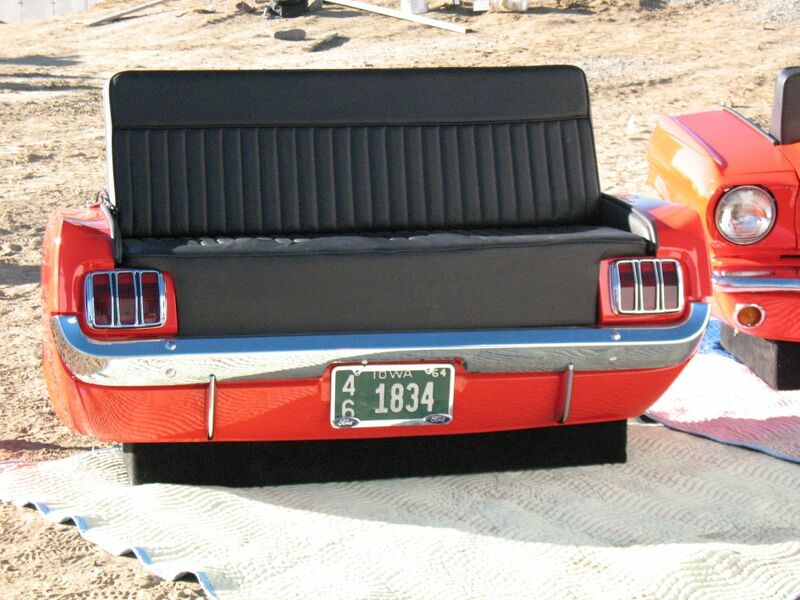 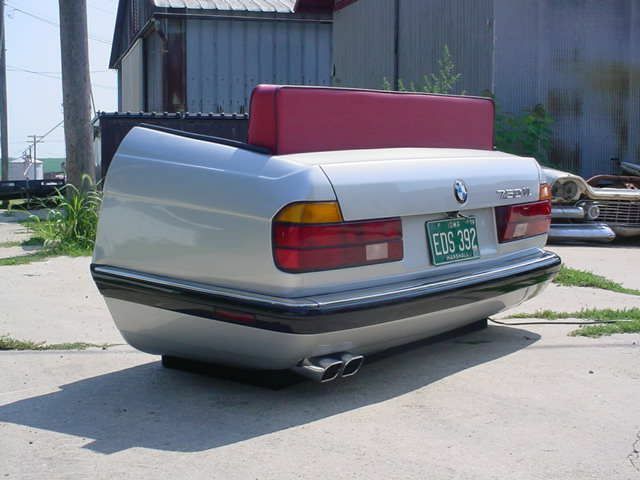 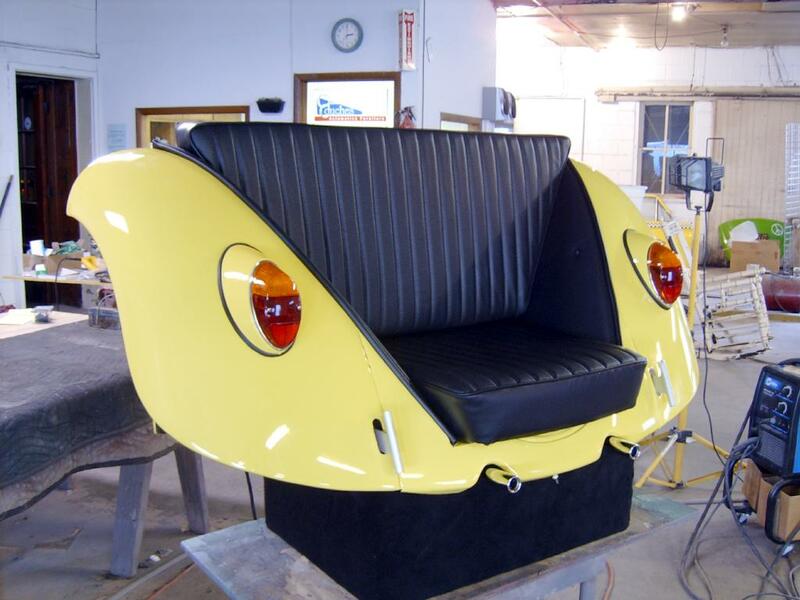 Please allow 5-6 weeks for us to build you a custom Classic Truck Couch / Sofa. 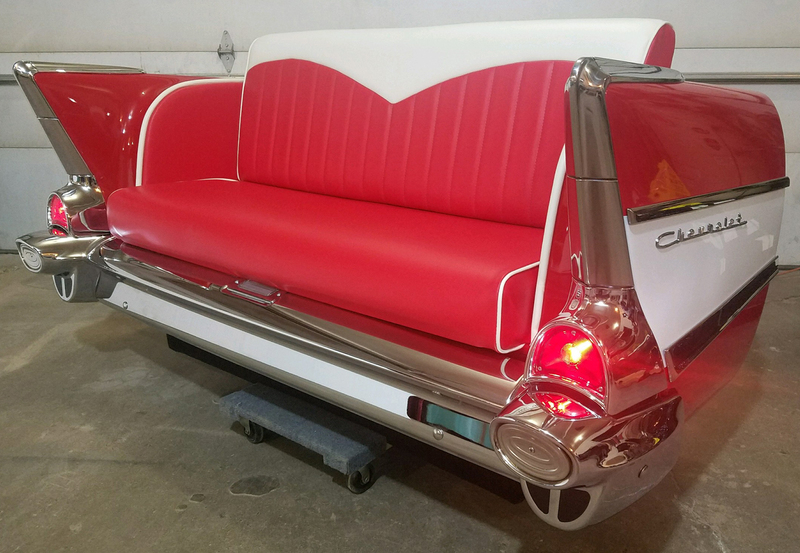 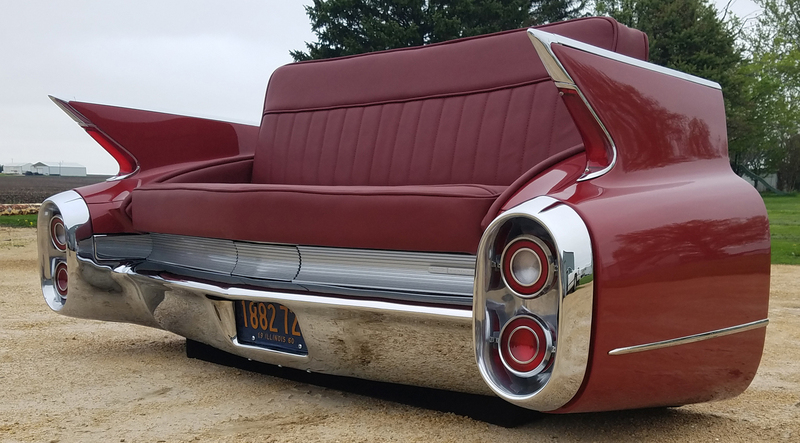 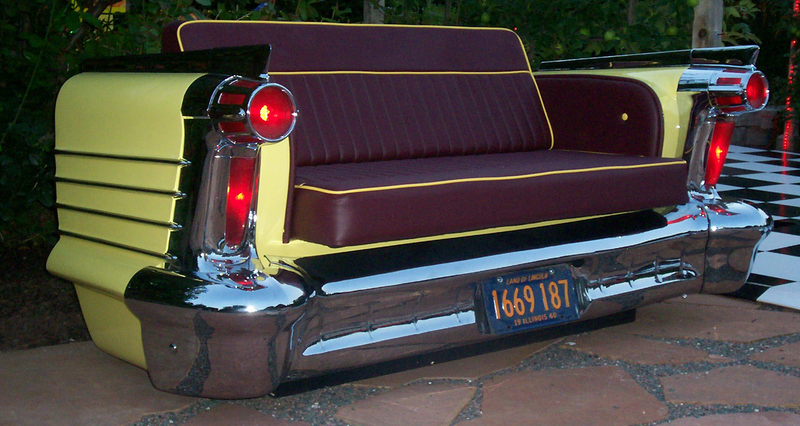 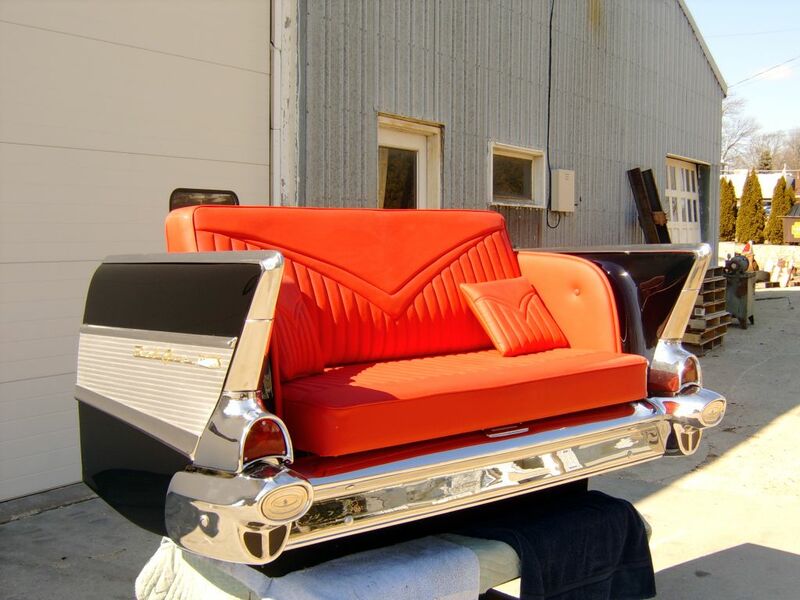 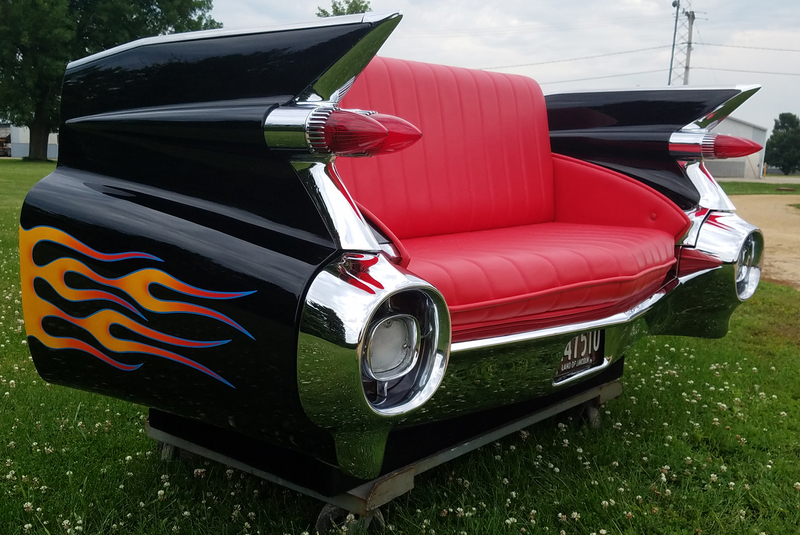 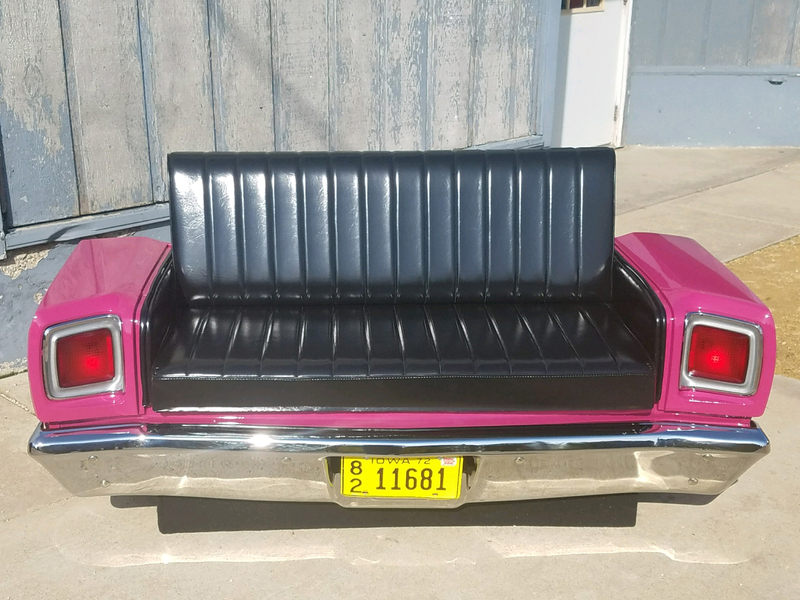 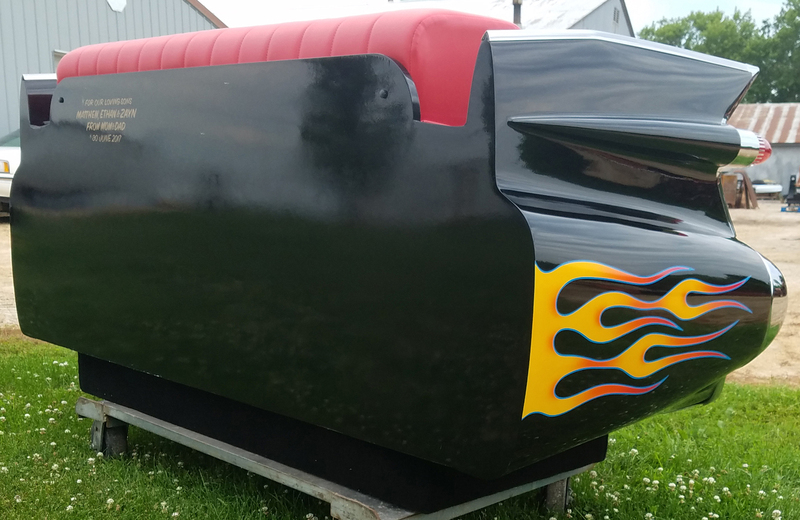 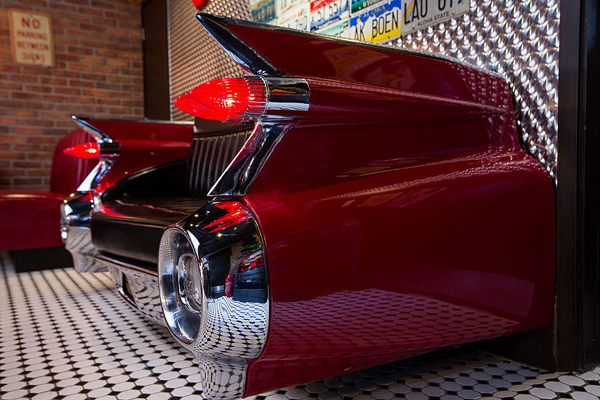 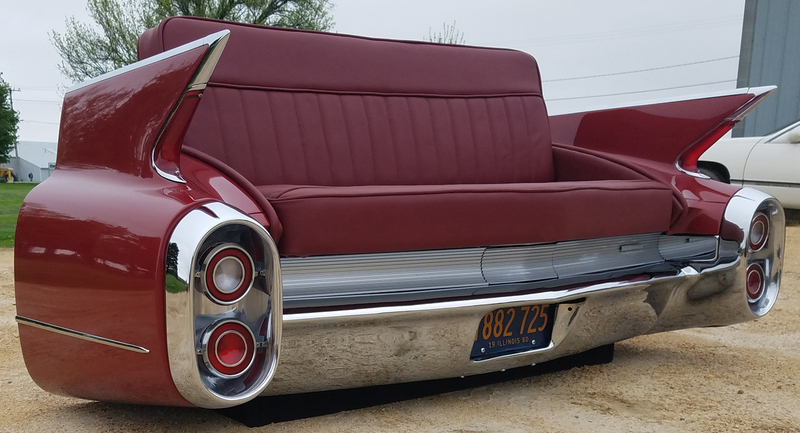 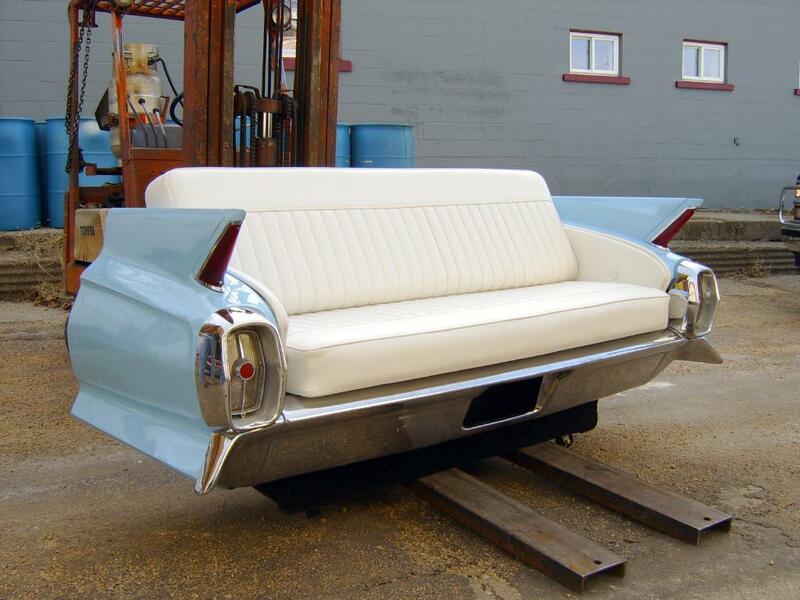 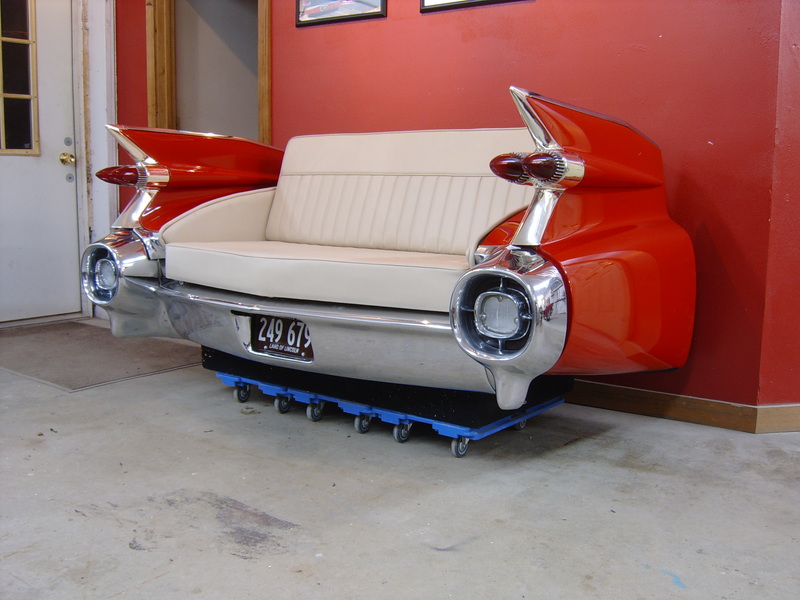 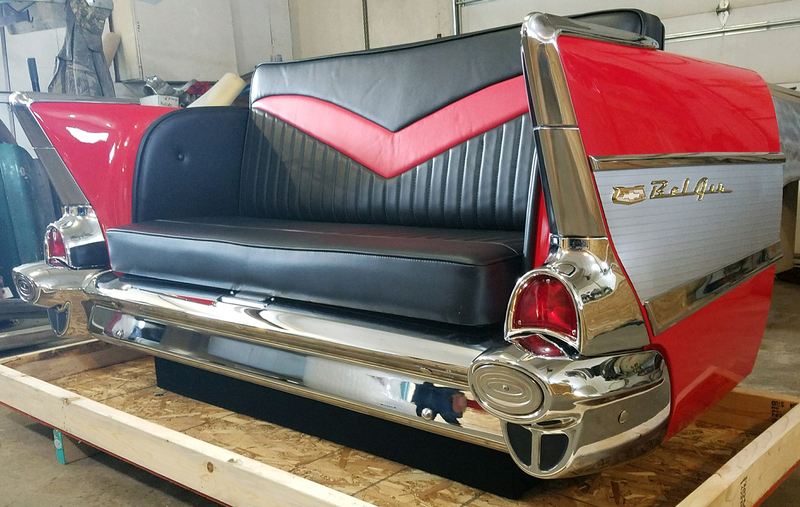 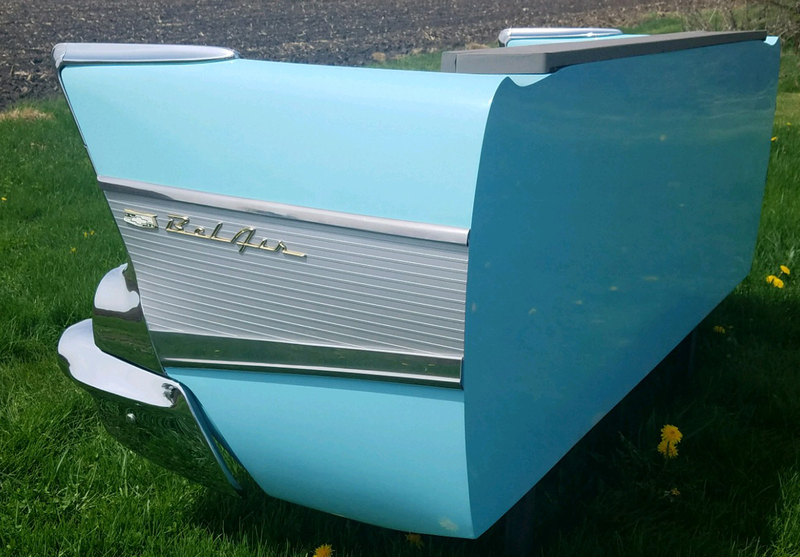 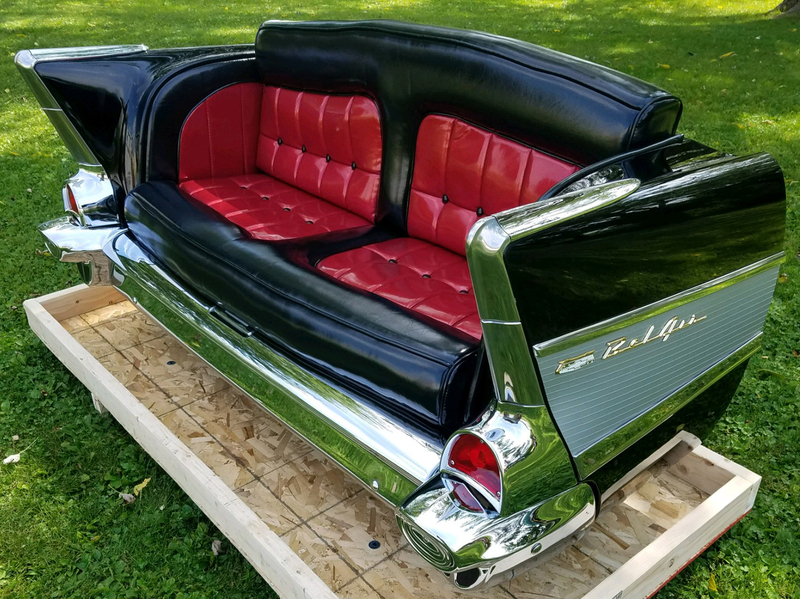 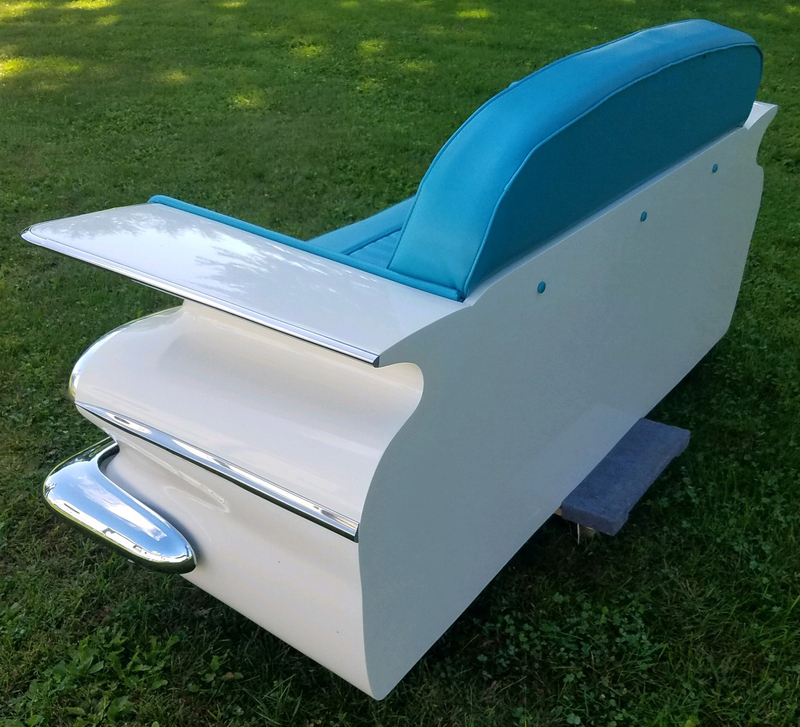 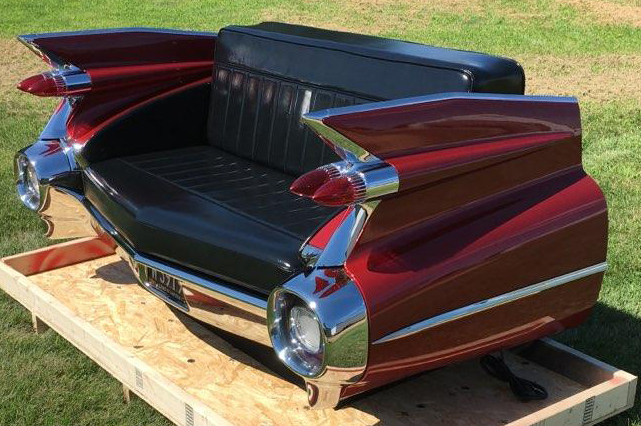 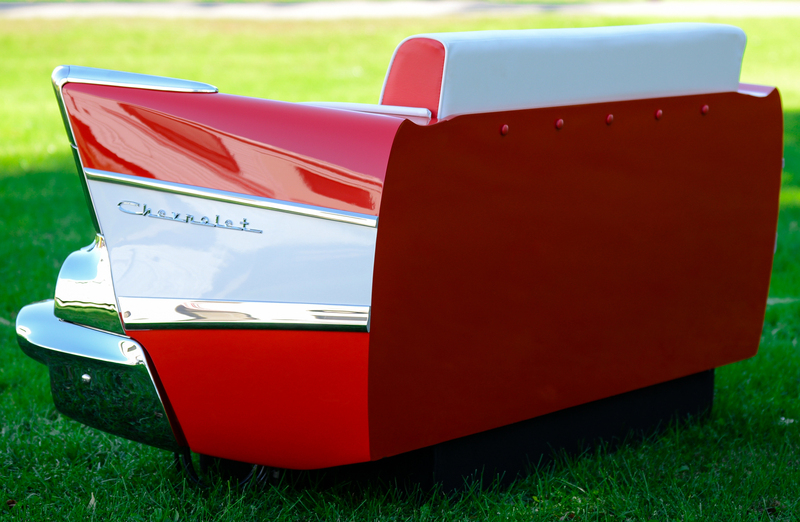 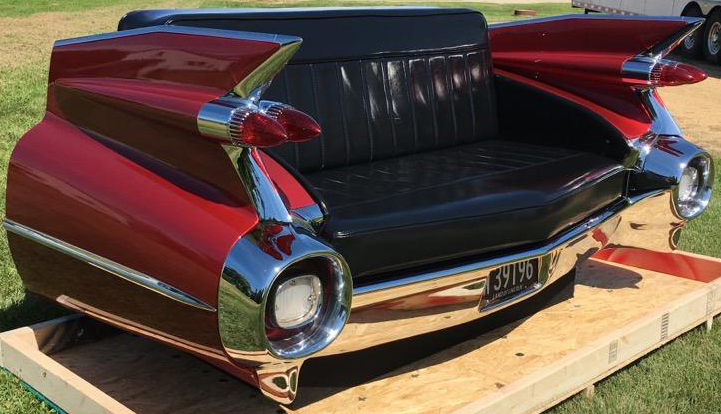 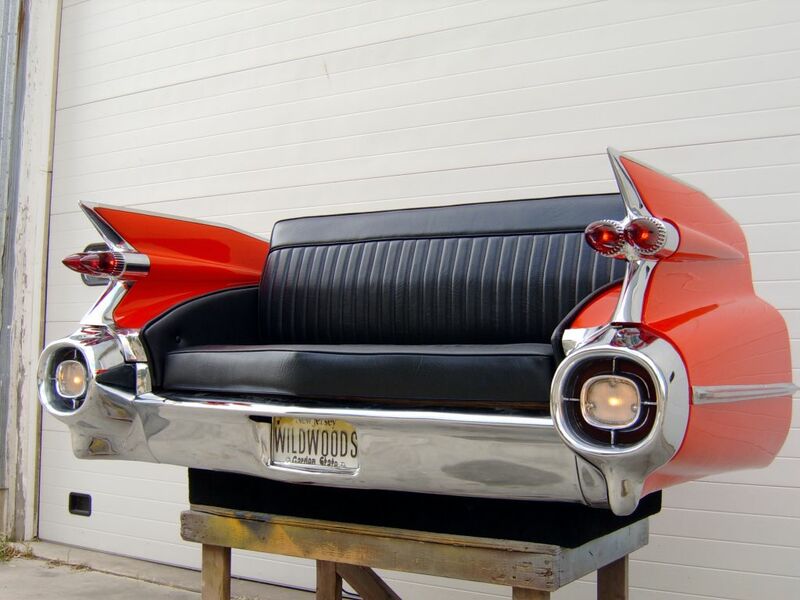 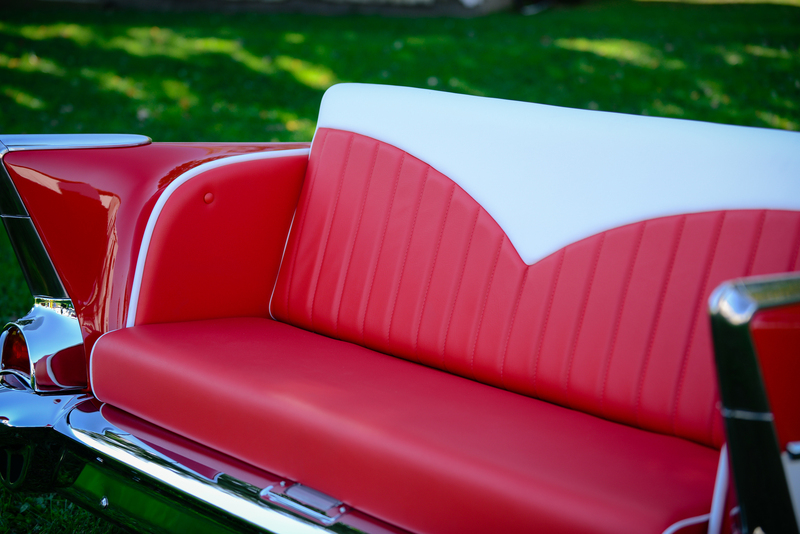 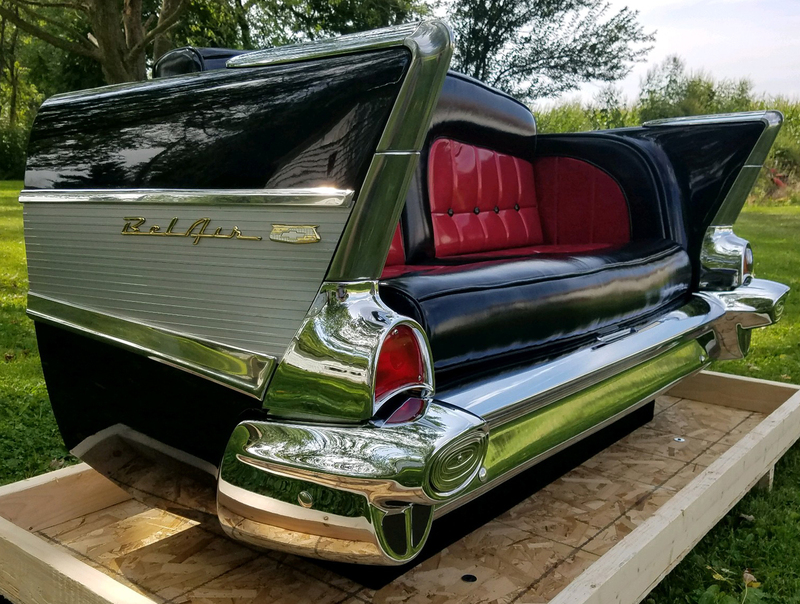 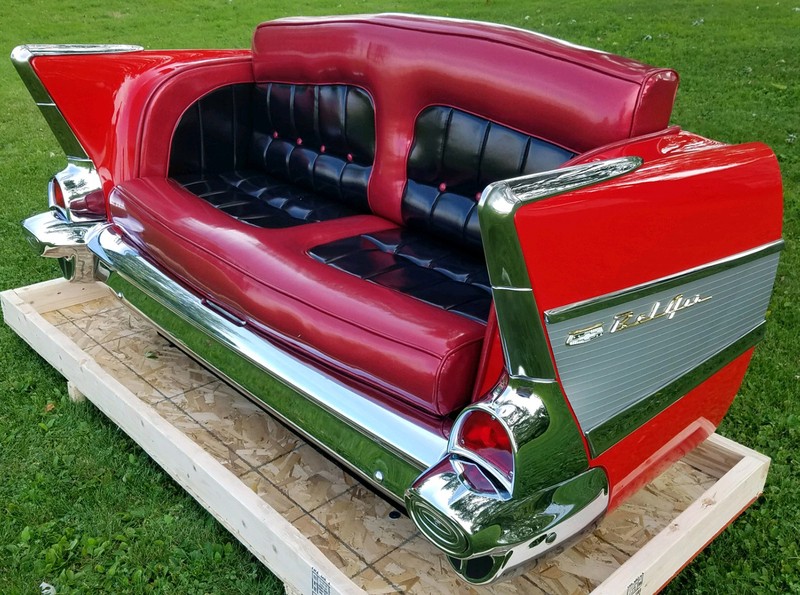 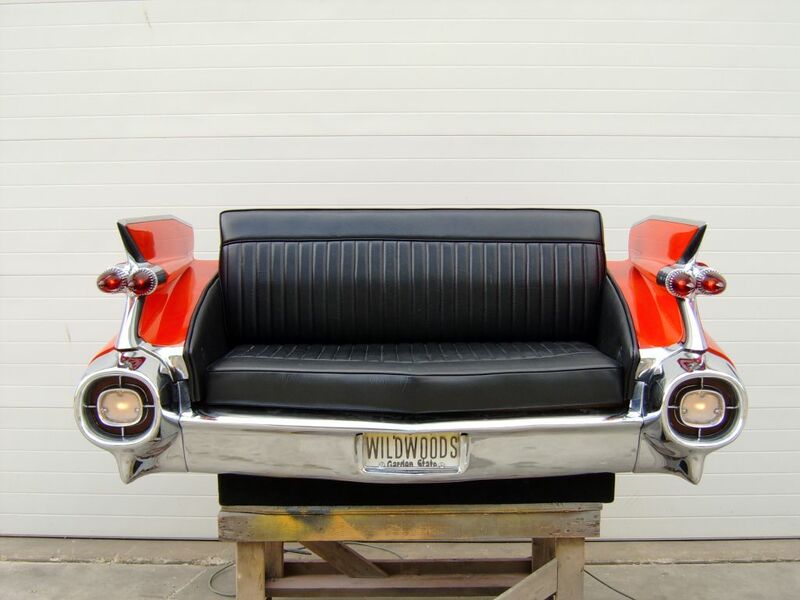 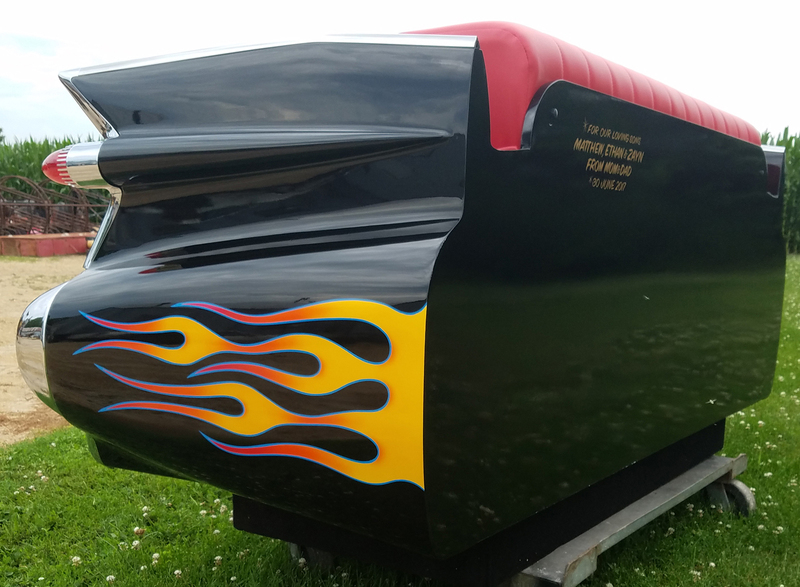 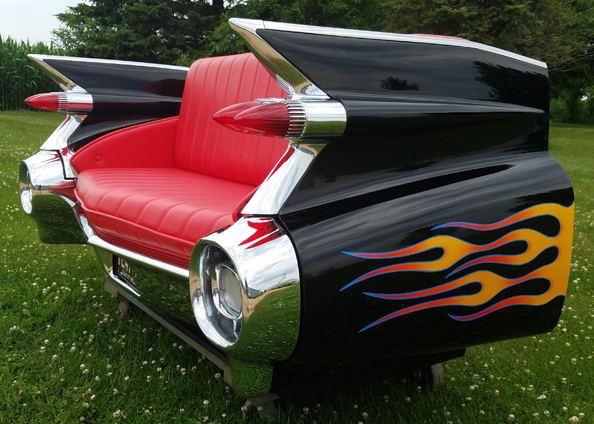 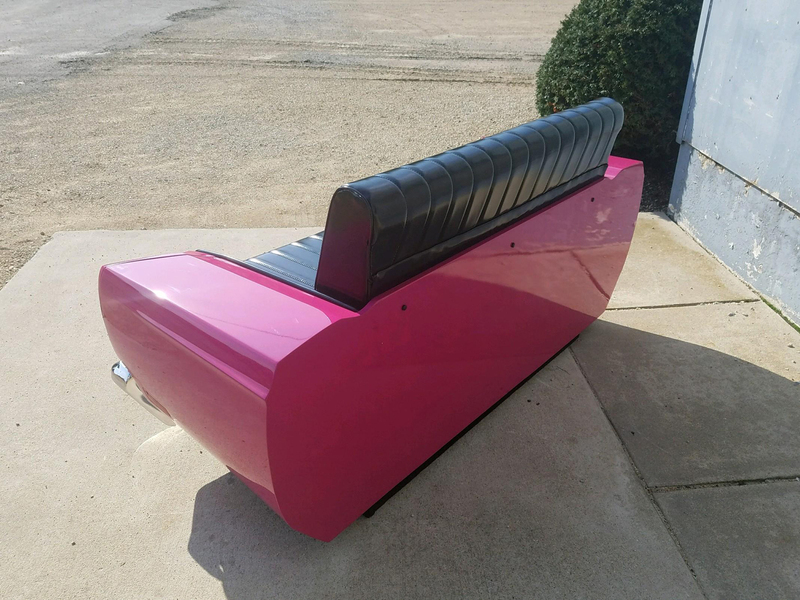 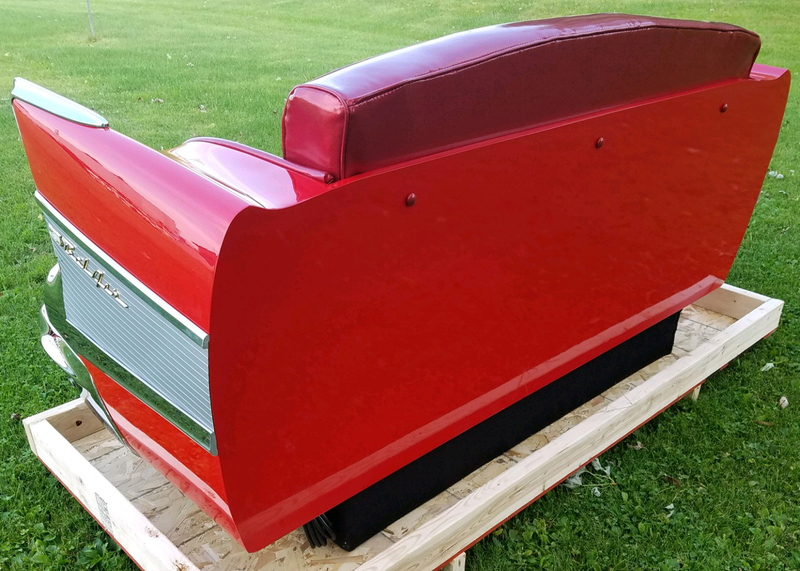 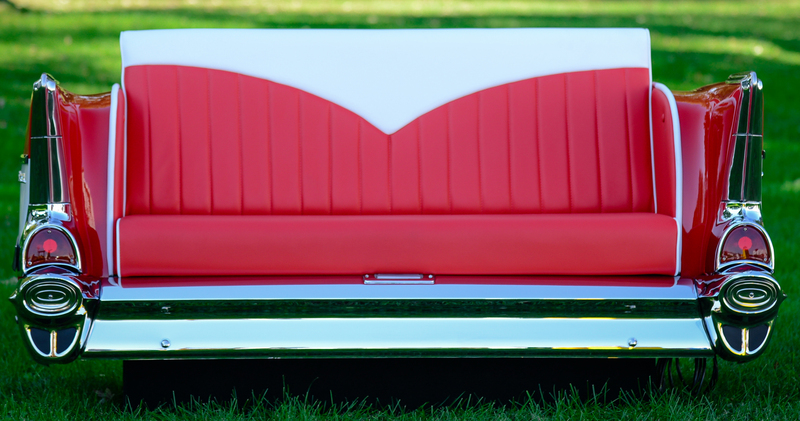 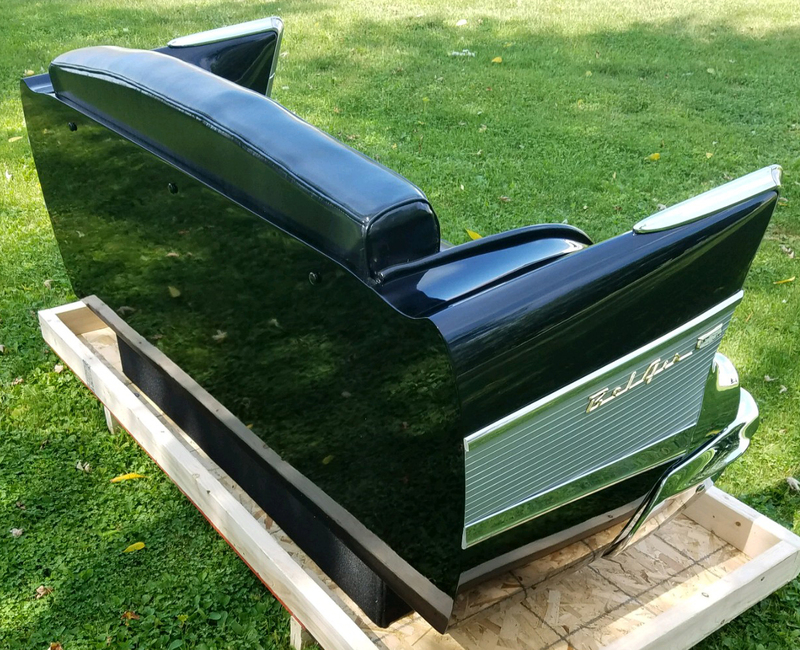 COOL PROJECT SALE: This 1959 Cadillac Rear End Couch with a custom Flame Job came out so well, we just had to feature this beauty. 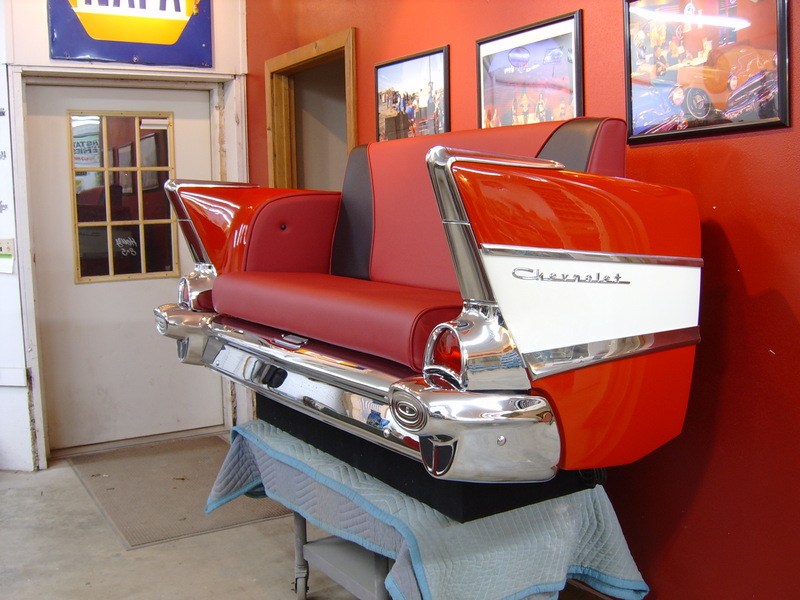 We can build one of these for you in about 12-15 weeks. 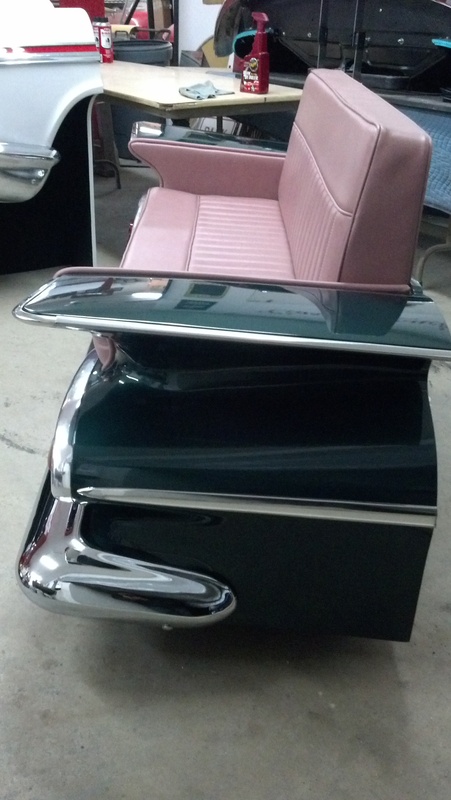 The chrome work takes a long time on these but if you can wait the time they are true works of art. 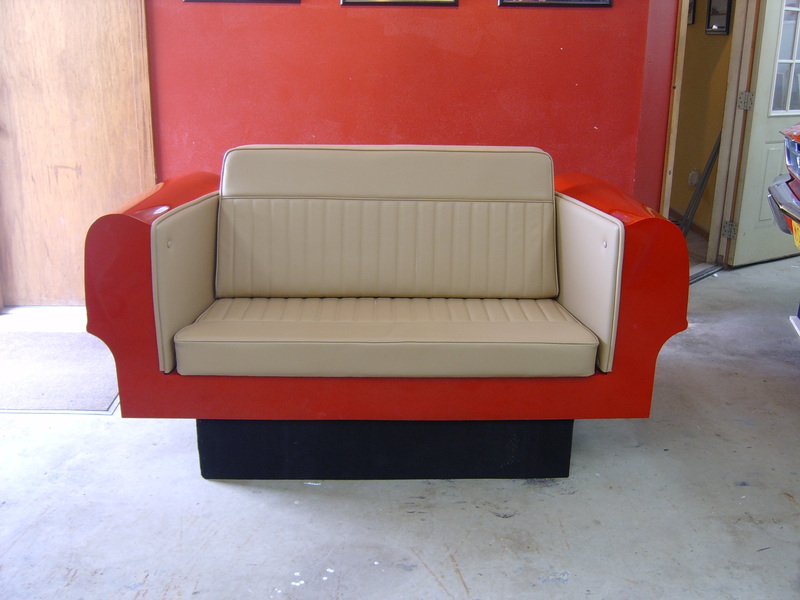 This can be yours for only $18,500.00 USD plus shipping. 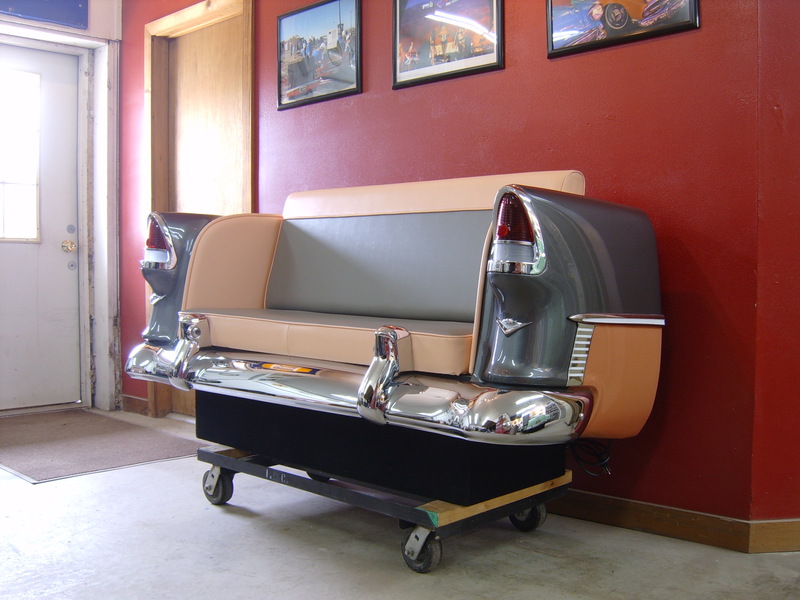 Please call today to order one of these couches. 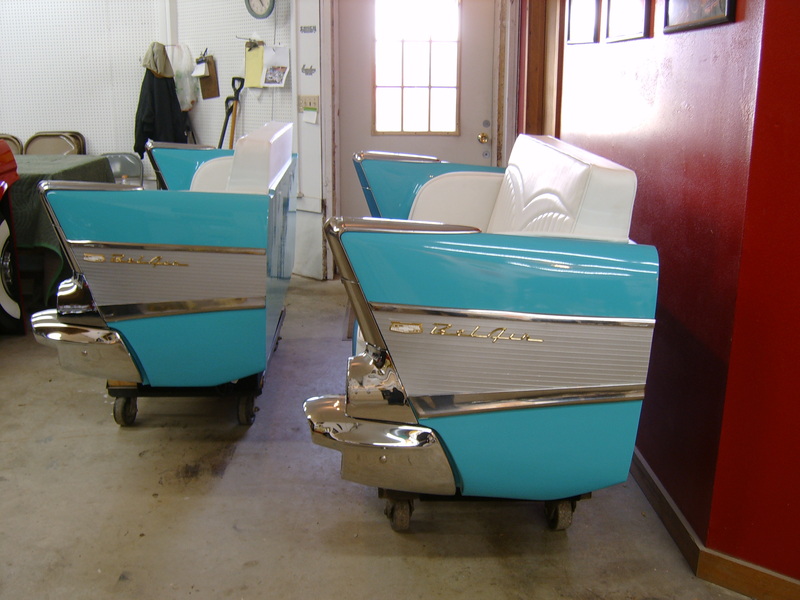 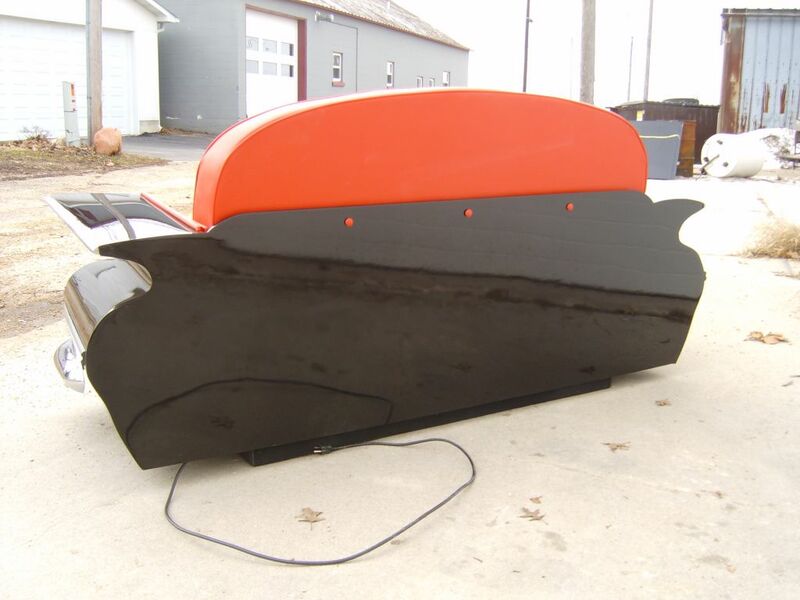 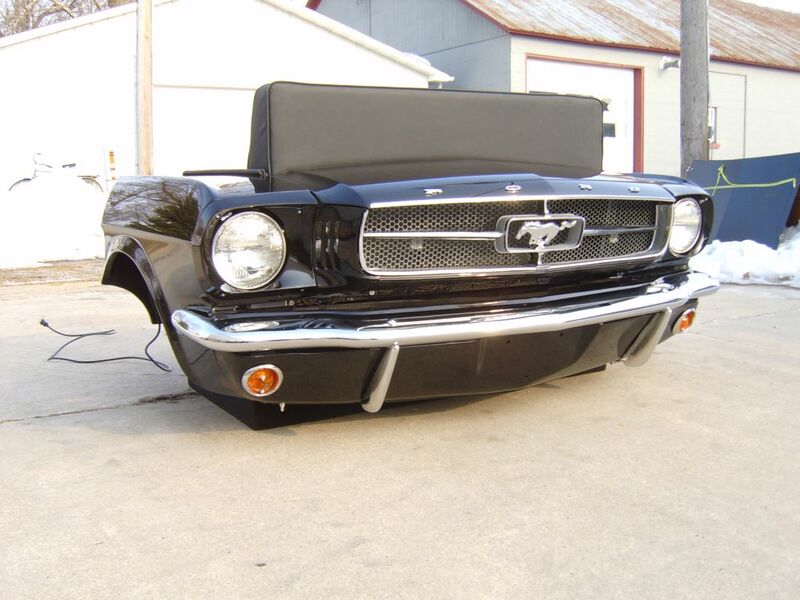 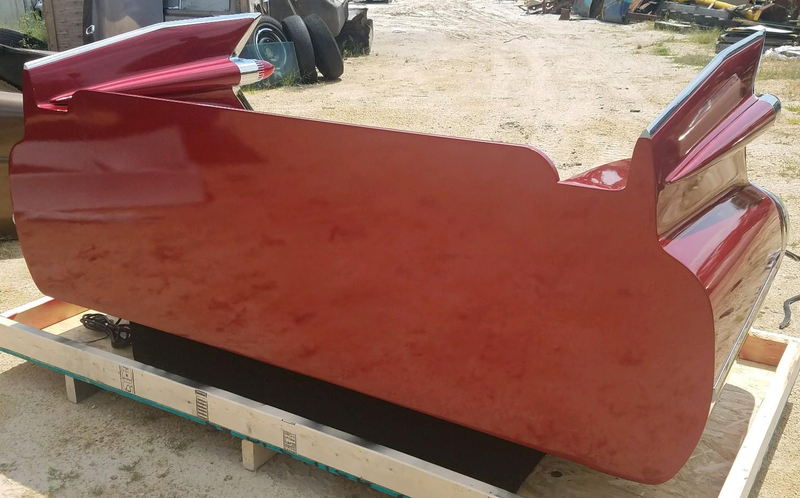 FLASH SALE: We have some front ends primed and ready to finish. 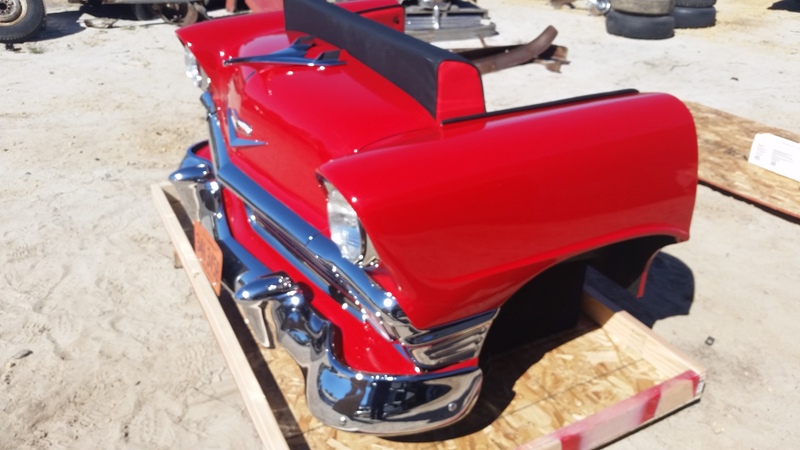 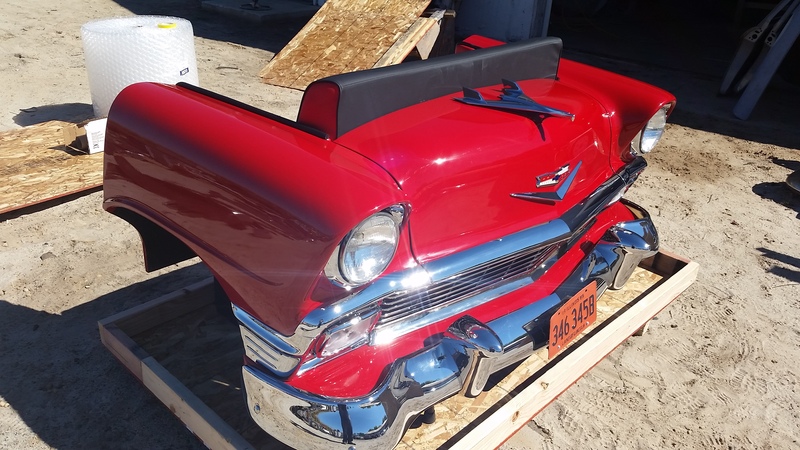 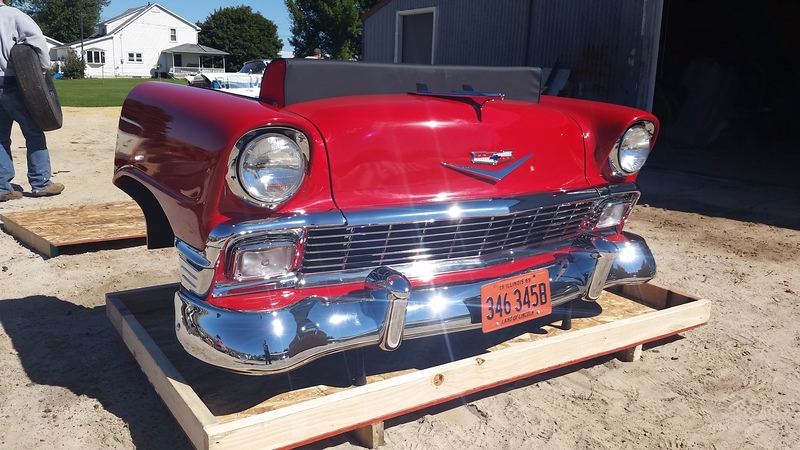 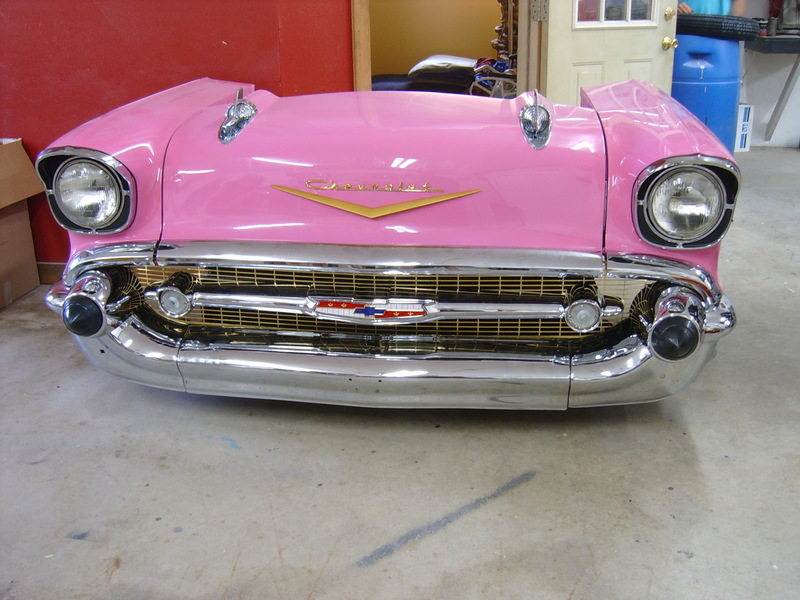 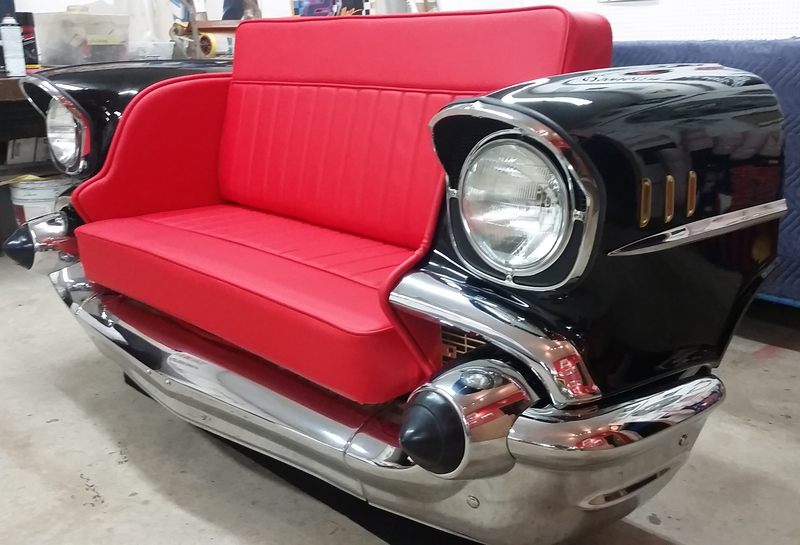 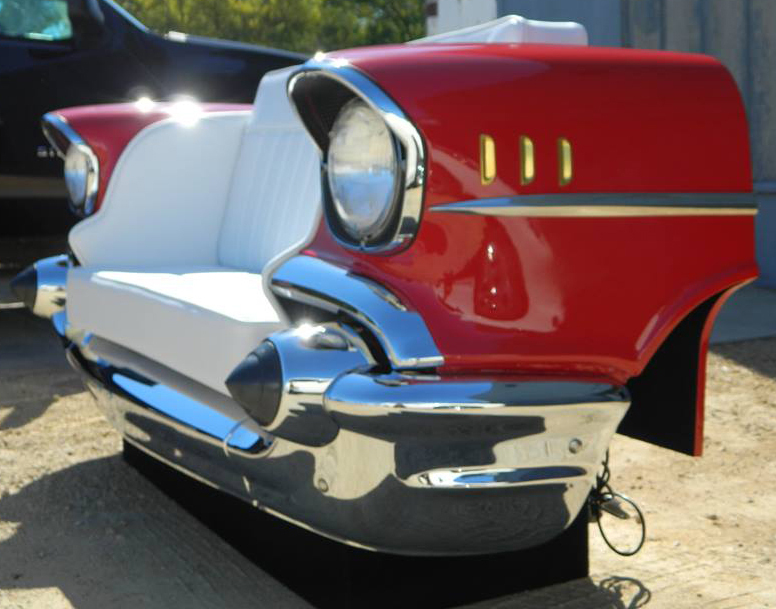 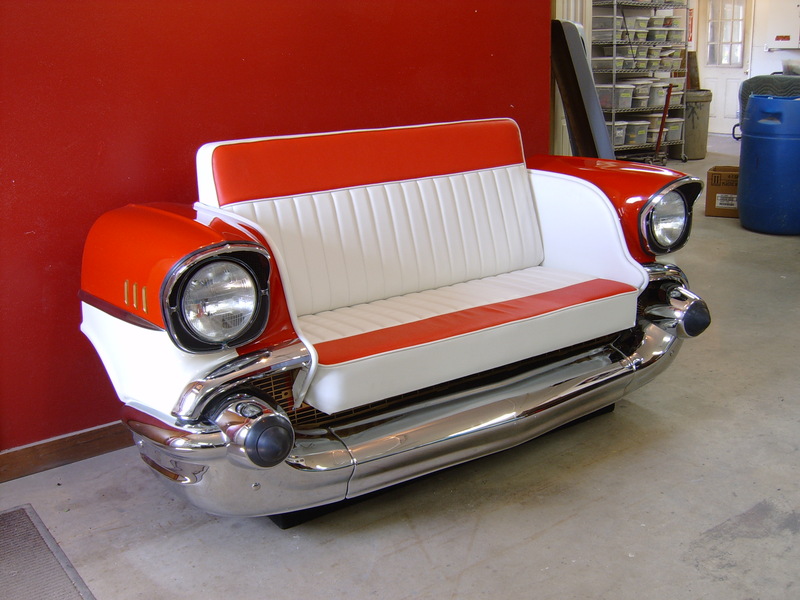 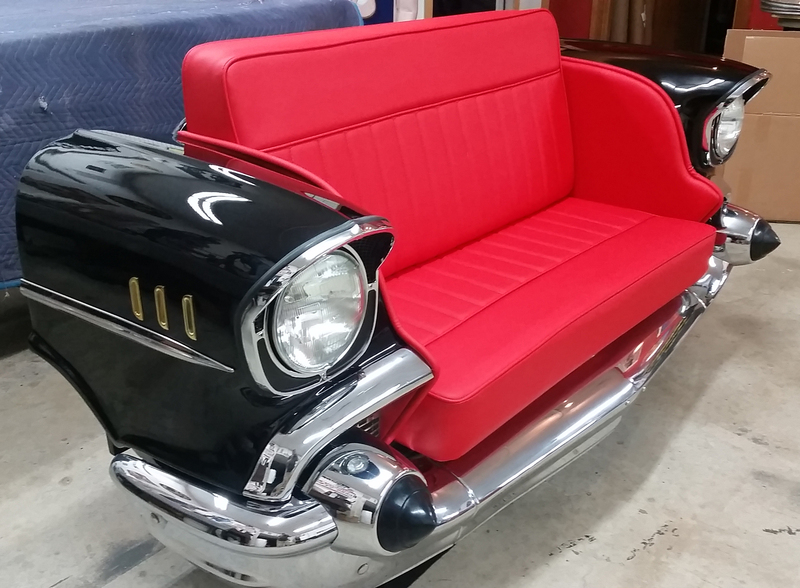 We can offer this beautiful 1957 Chevy Bel Air Front End Car Couch ready to go in 4 weeks. 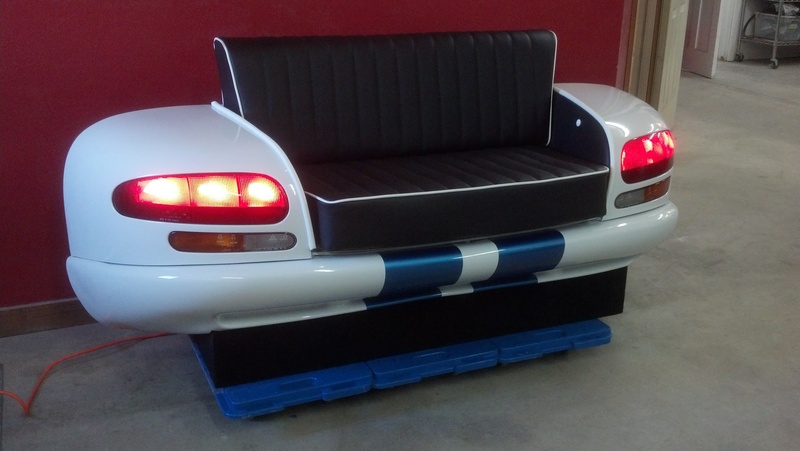 This being for sold for a discounted price of only $7,810.00 USD plus shipping. 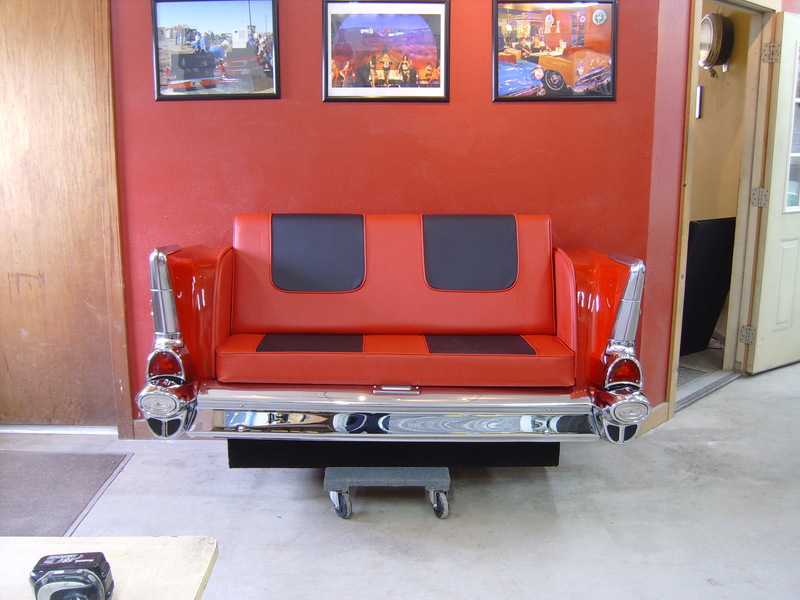 Please call today to order one of these couches. 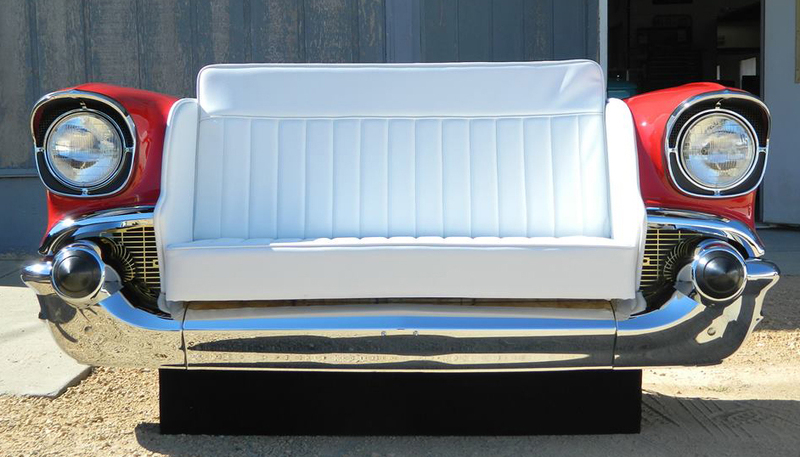 This functional work-of-art is available at an amazing price to the first (4) lucky customers! 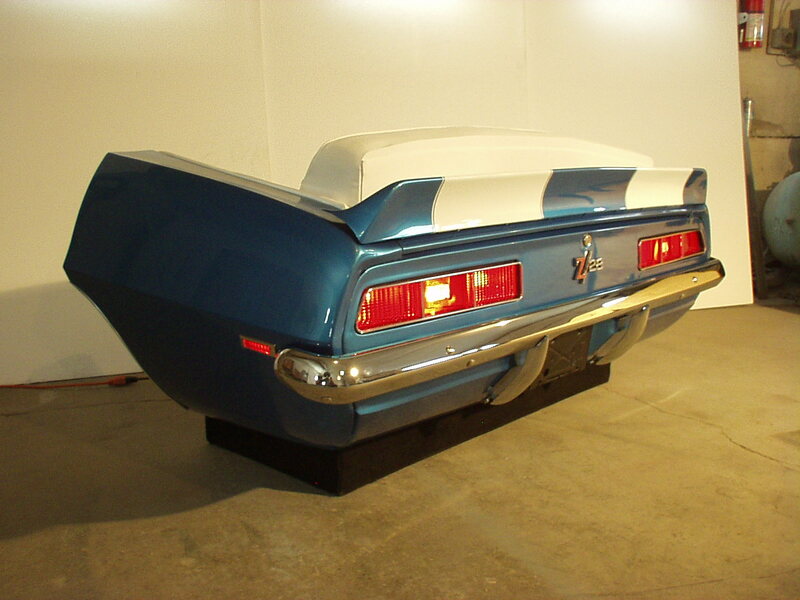 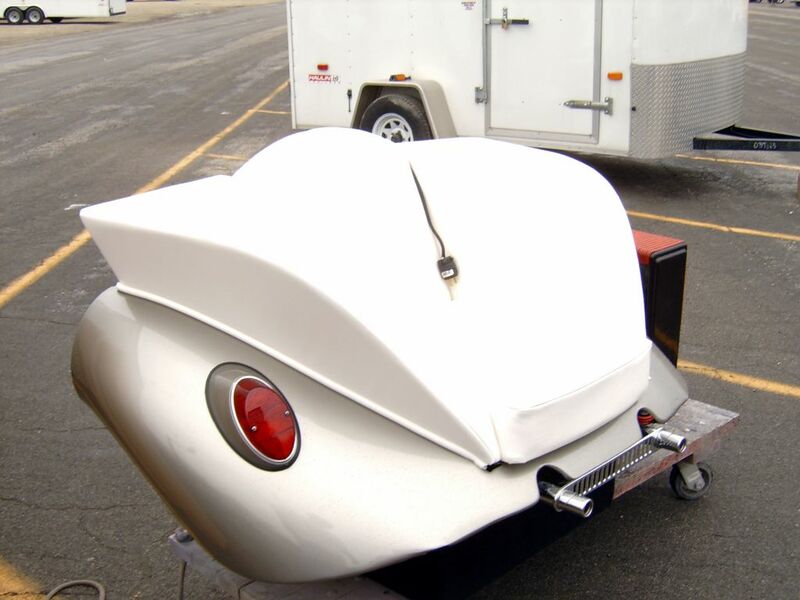 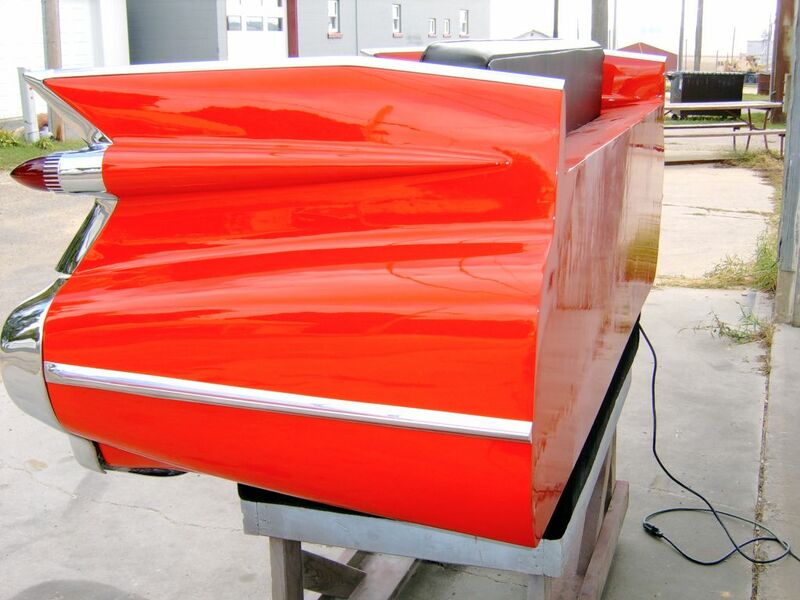 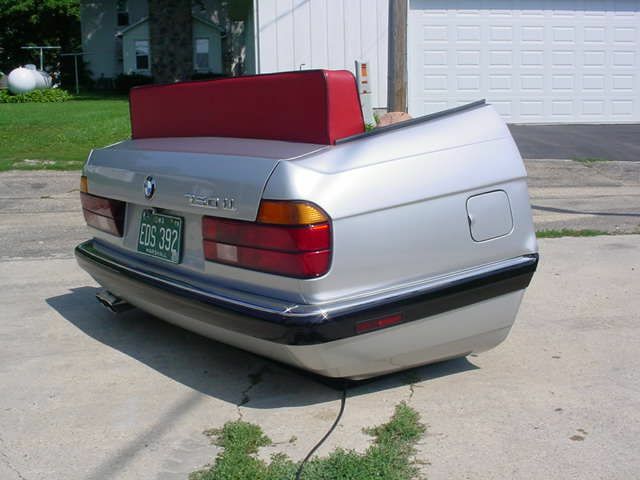 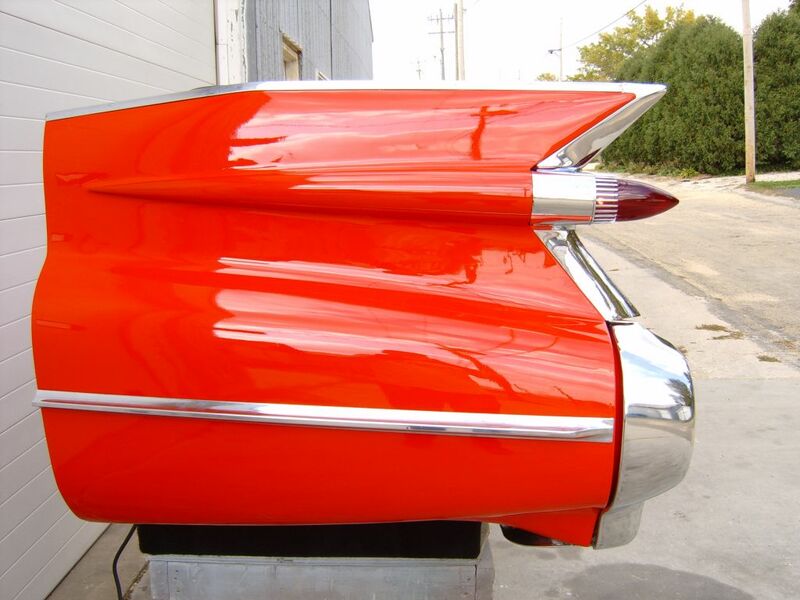 FLASH SALE: We have some rear ends primed and ready to finish. 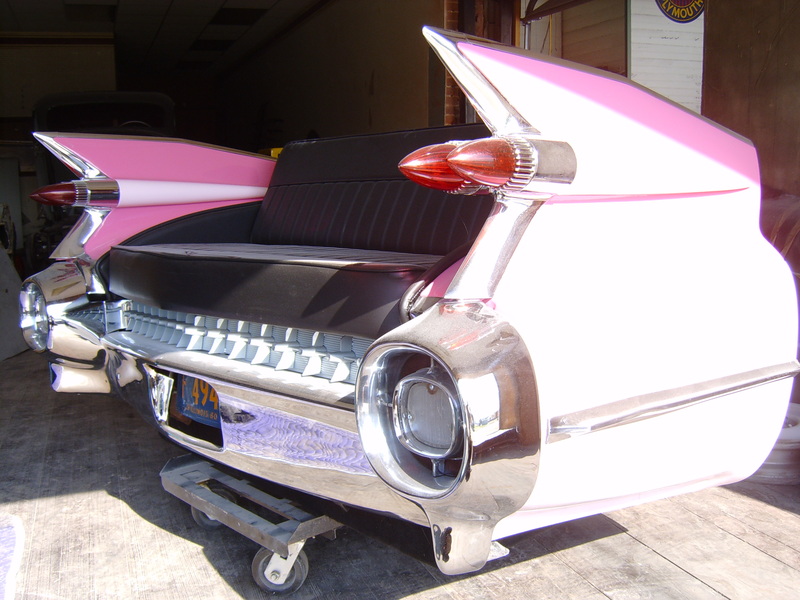 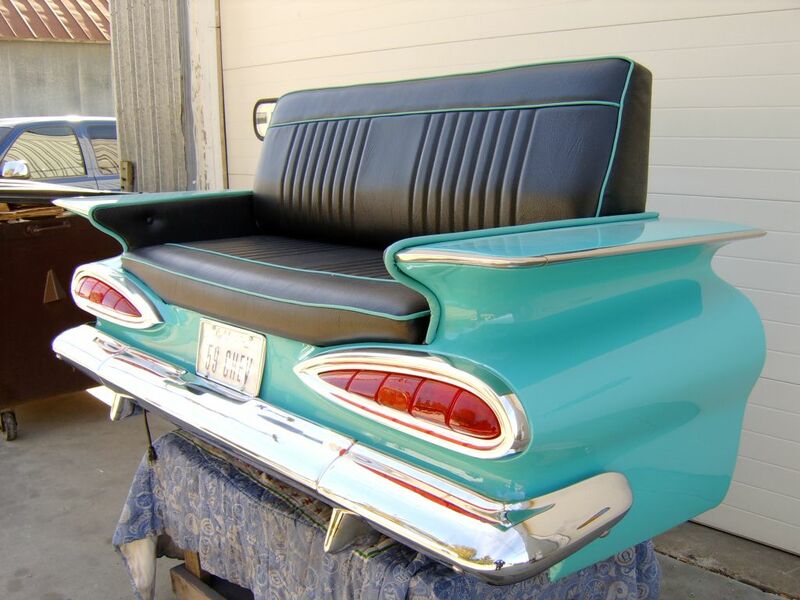 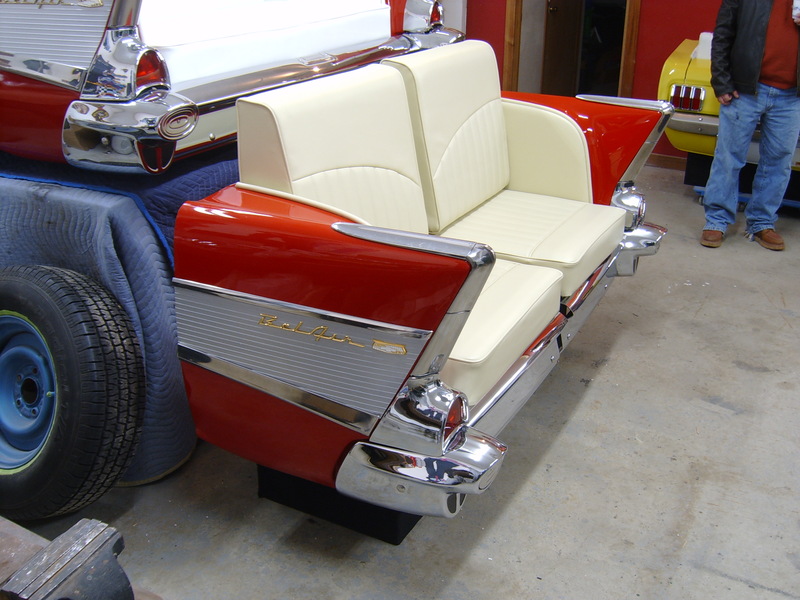 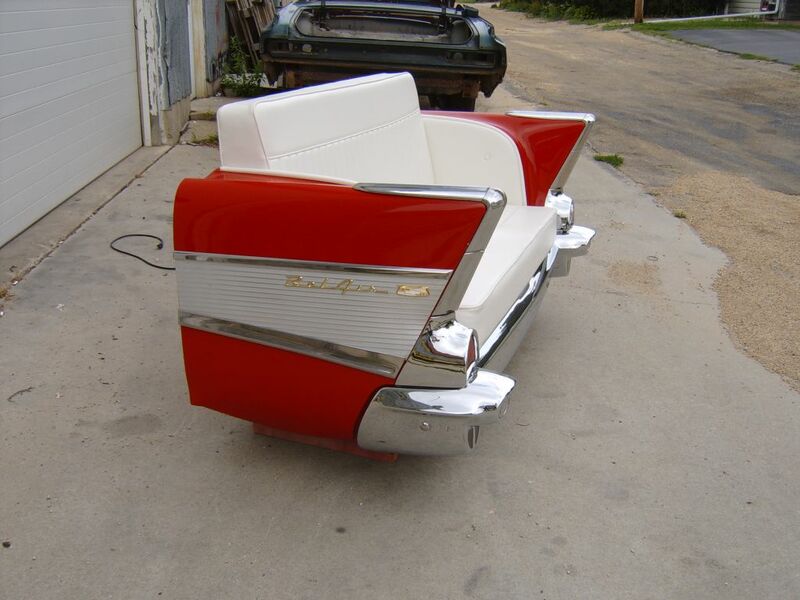 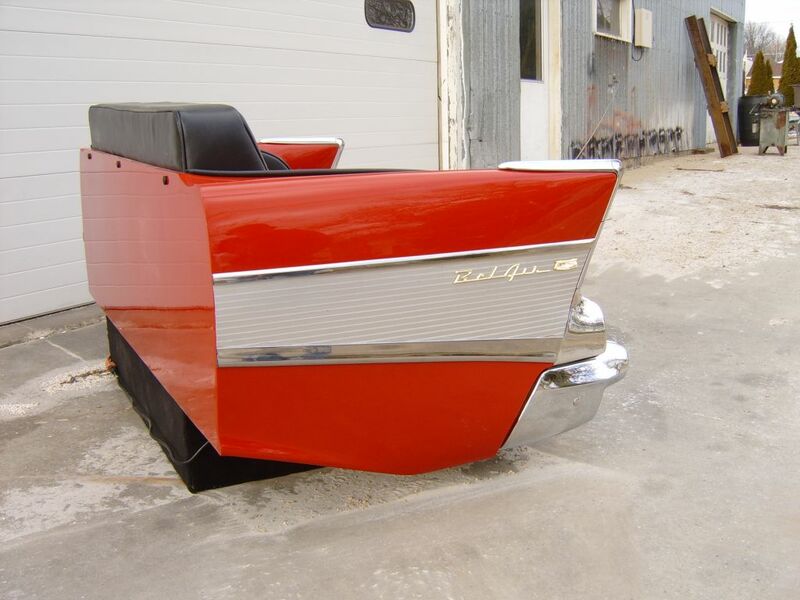 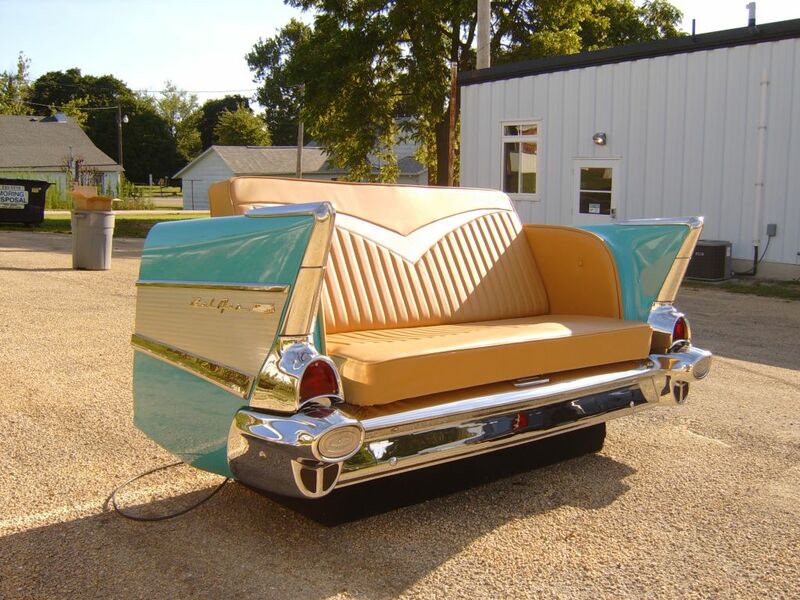 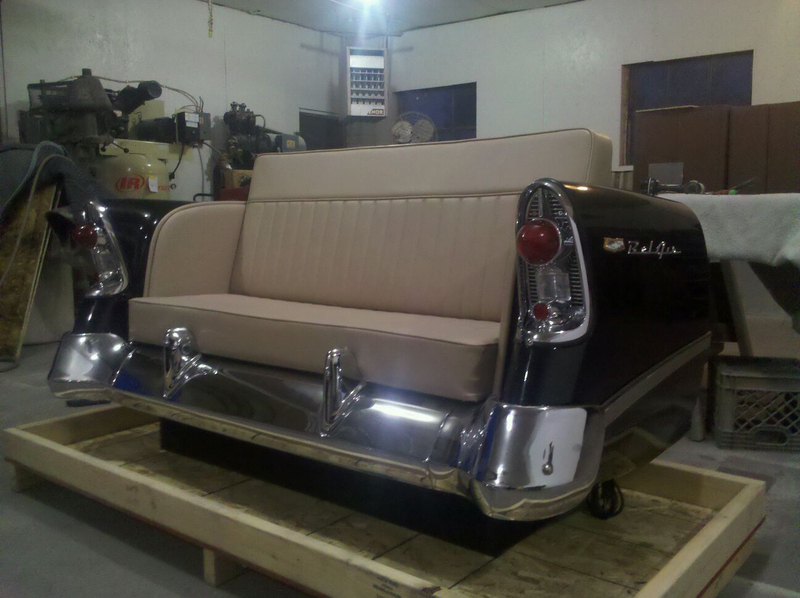 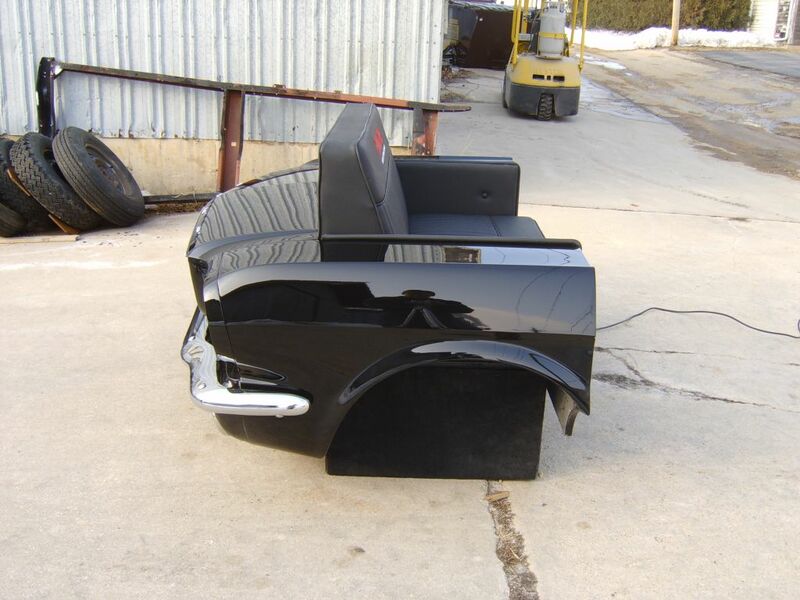 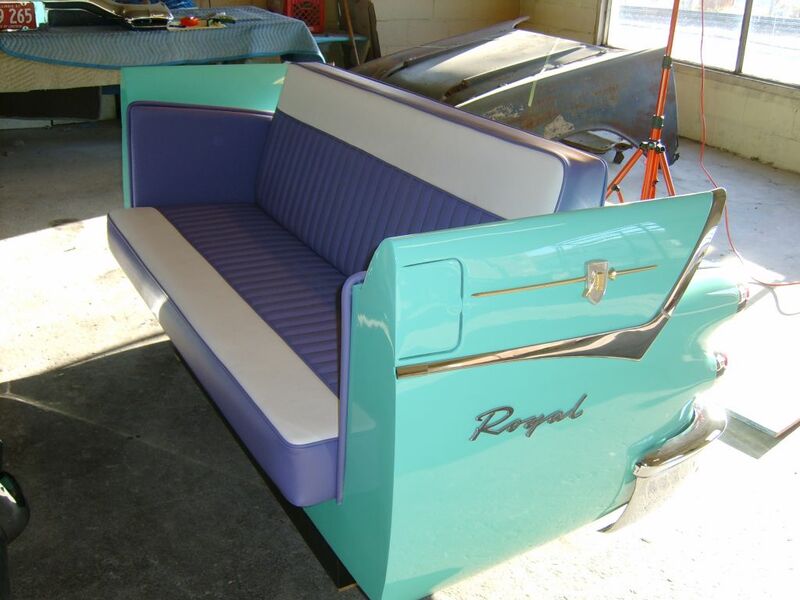 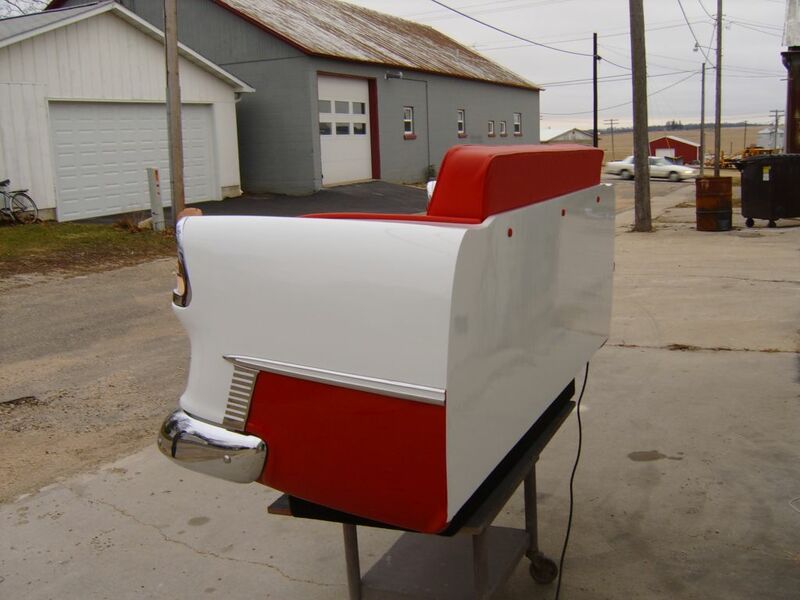 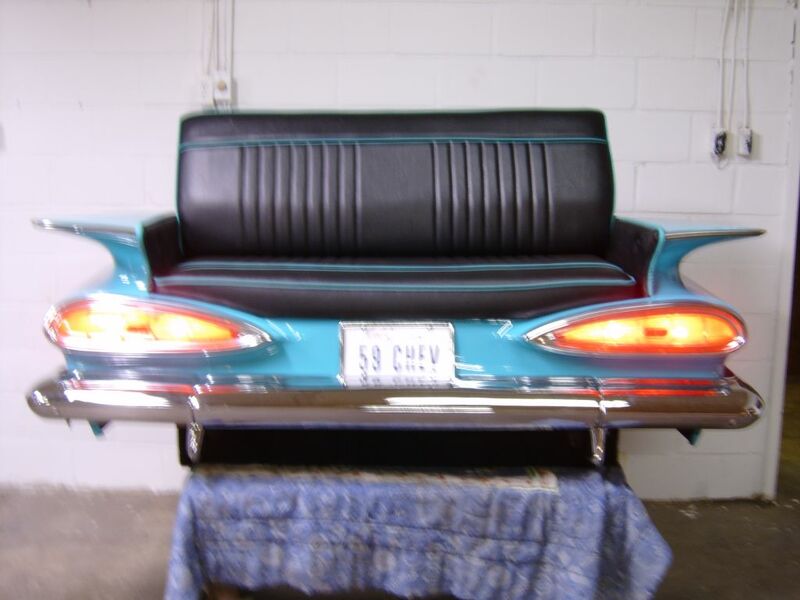 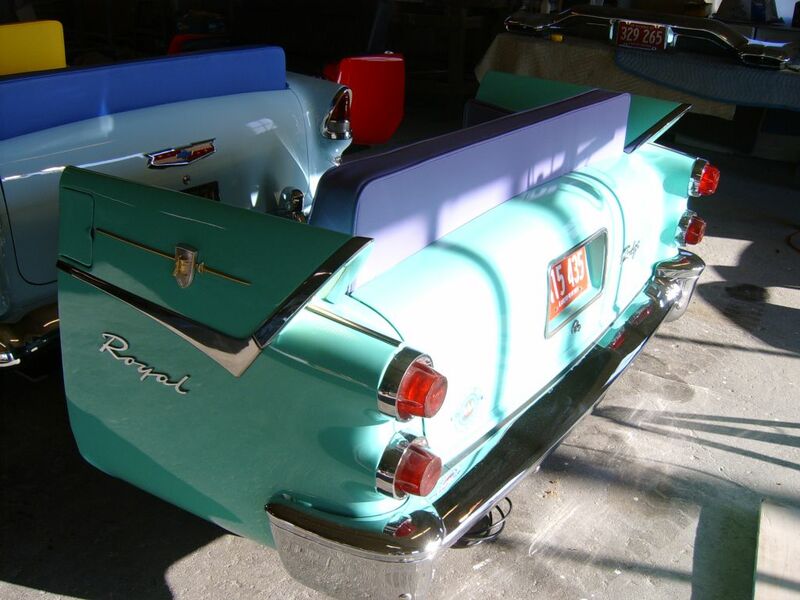 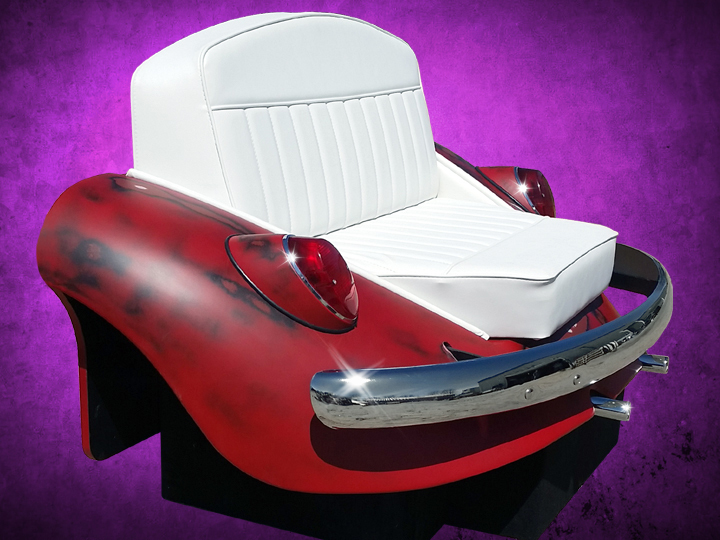 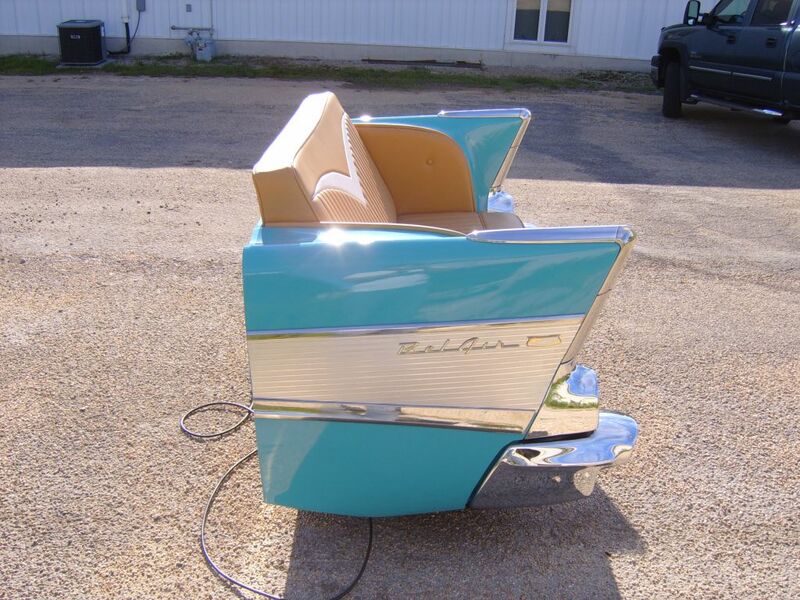 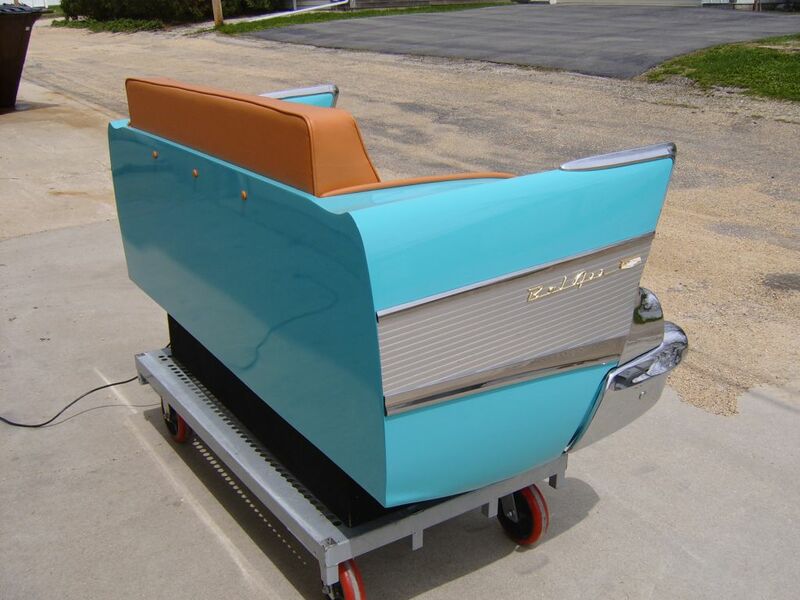 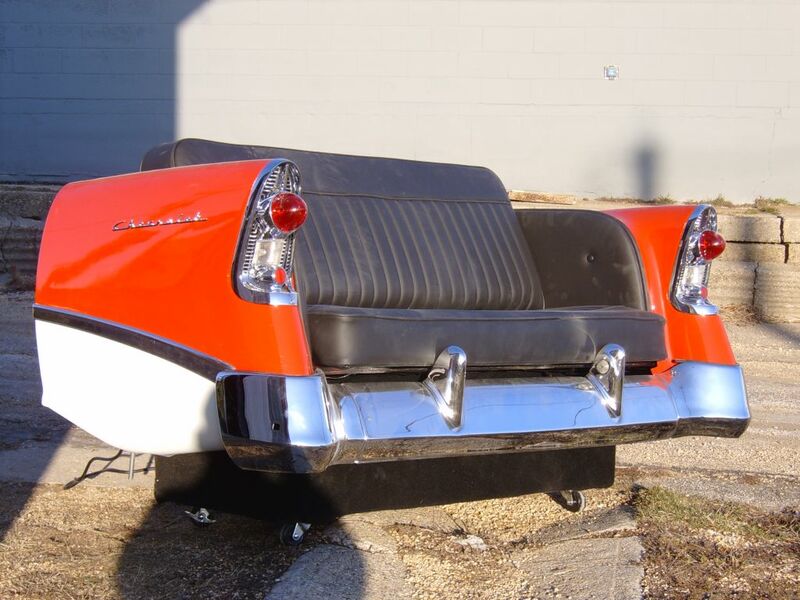 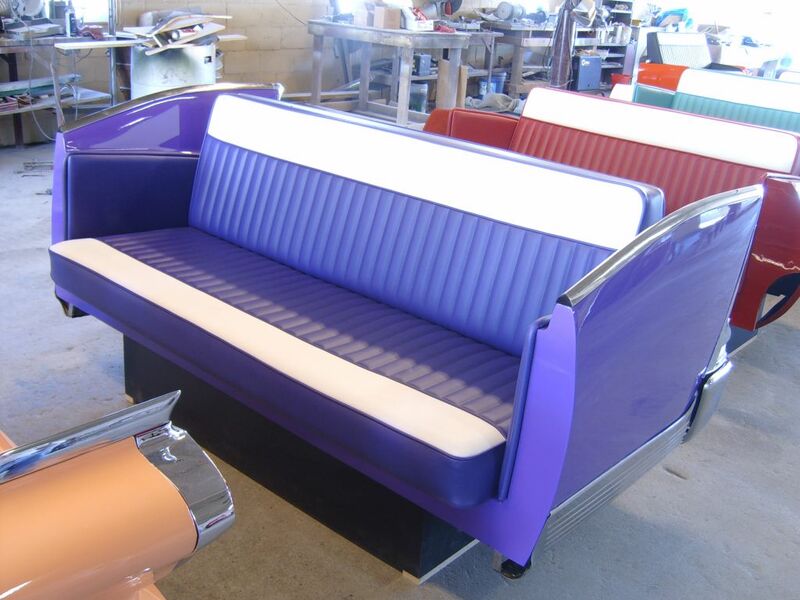 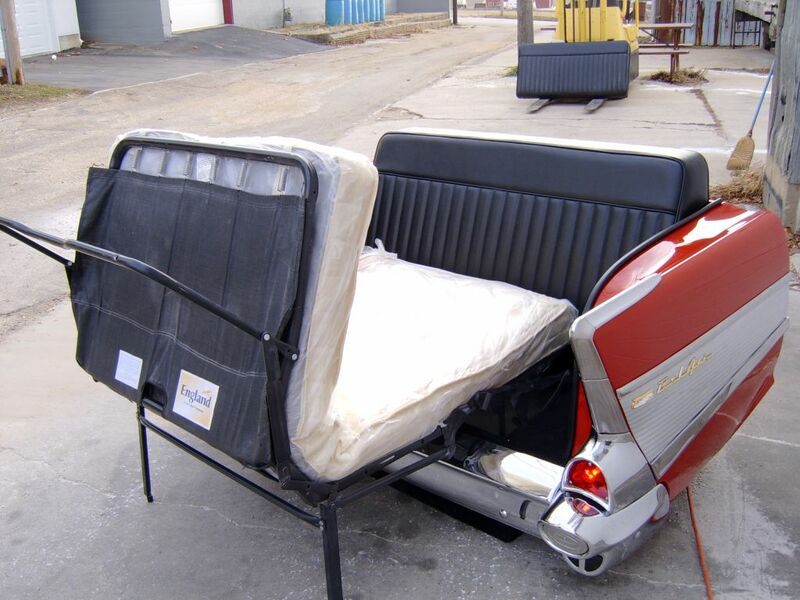 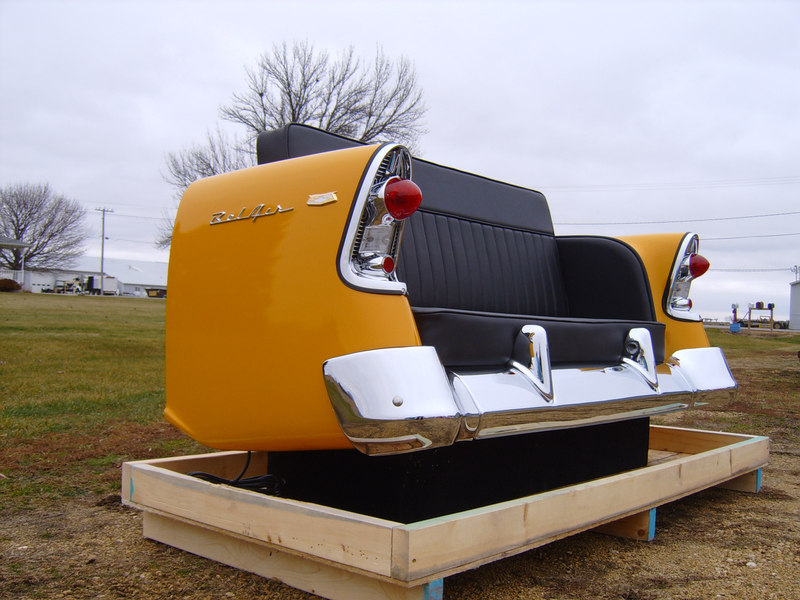 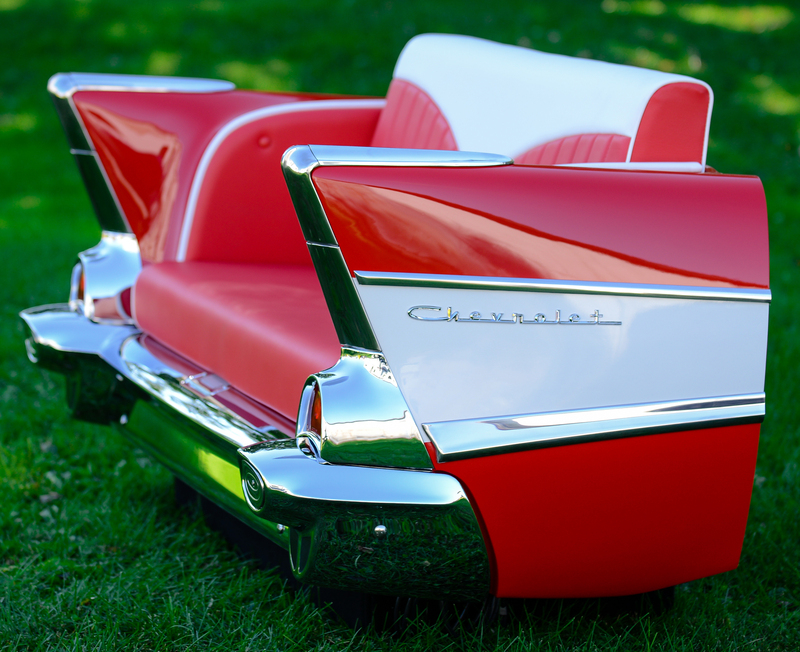 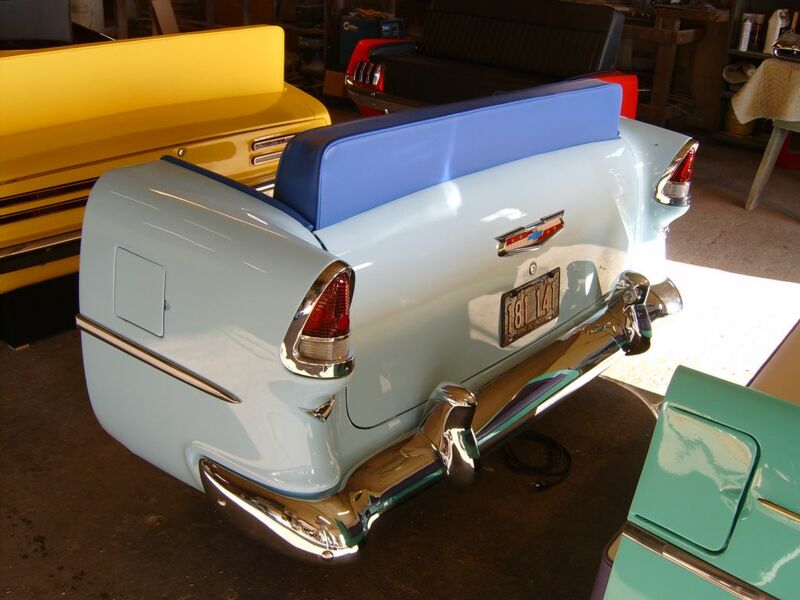 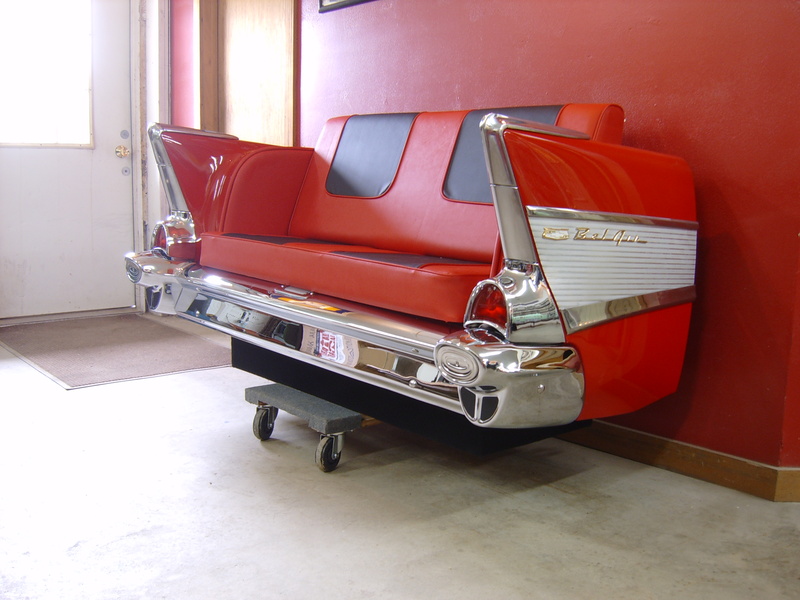 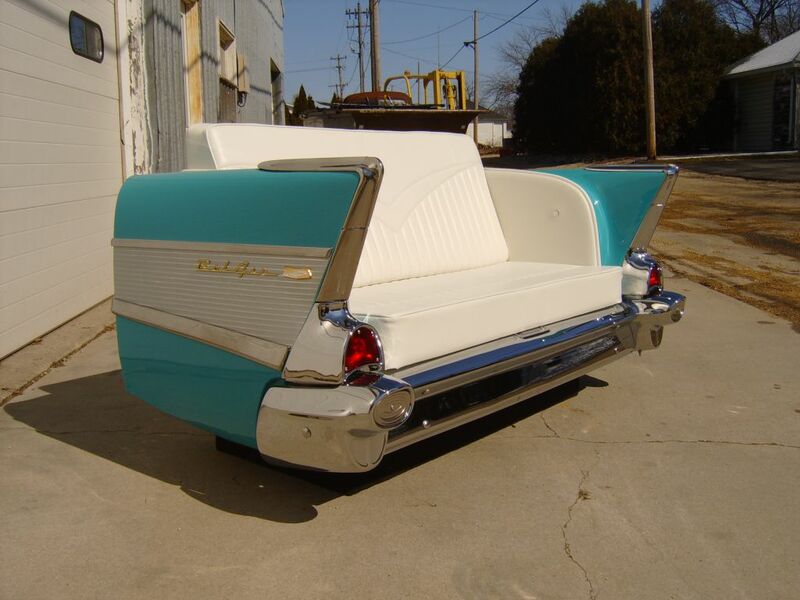 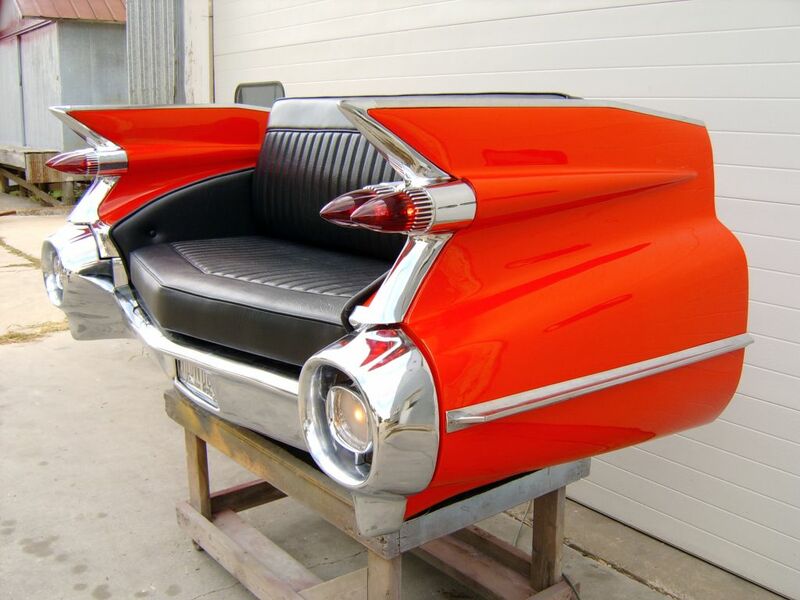 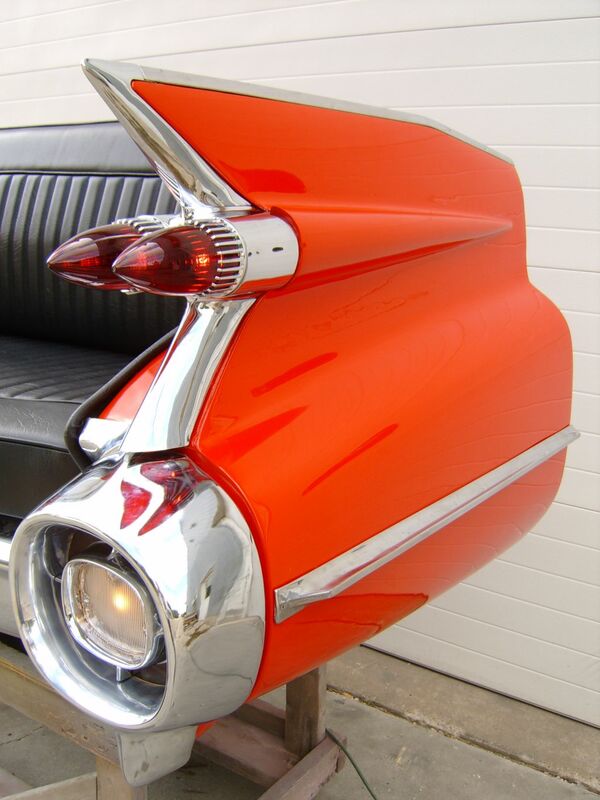 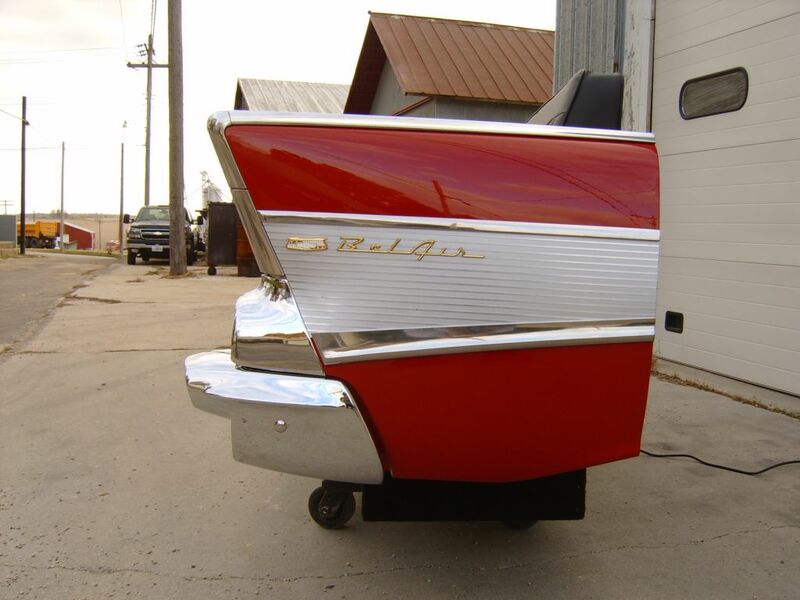 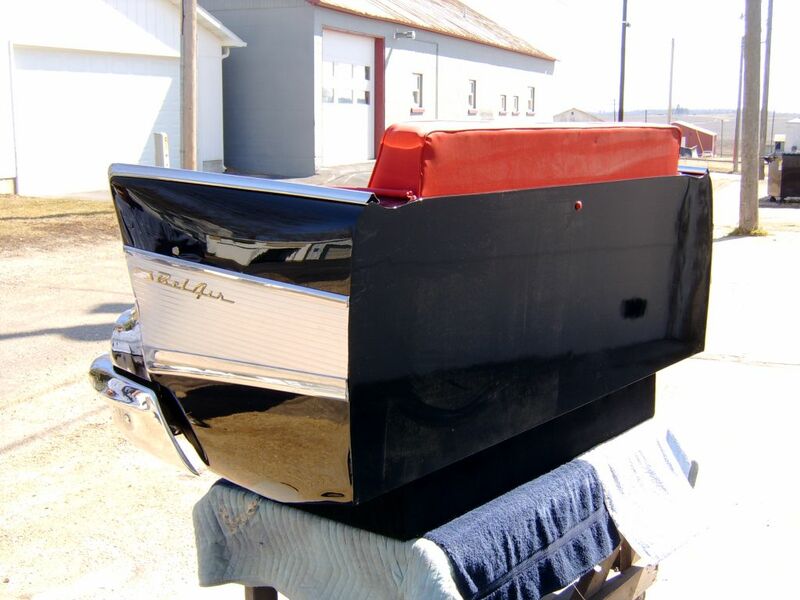 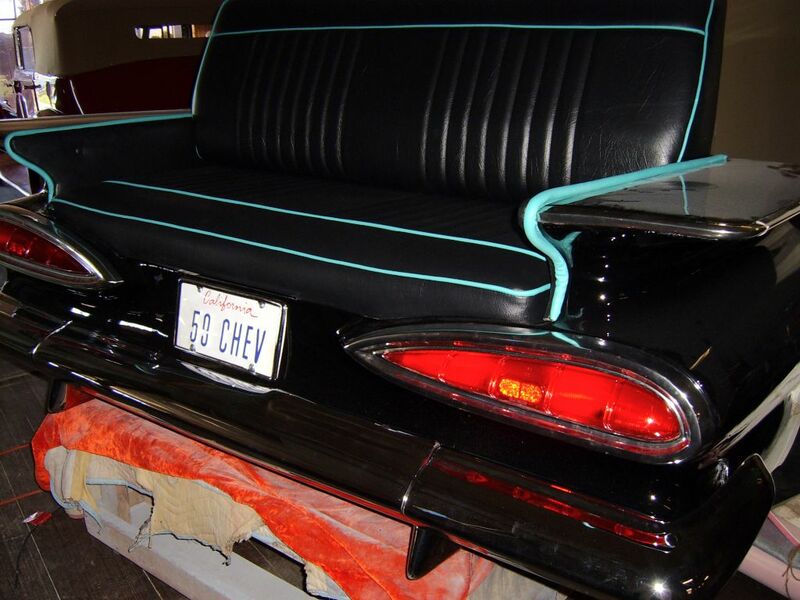 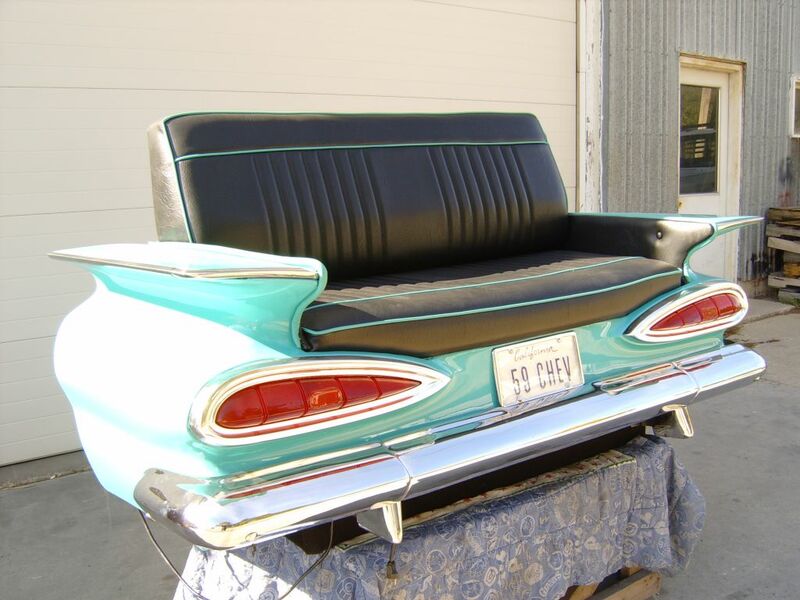 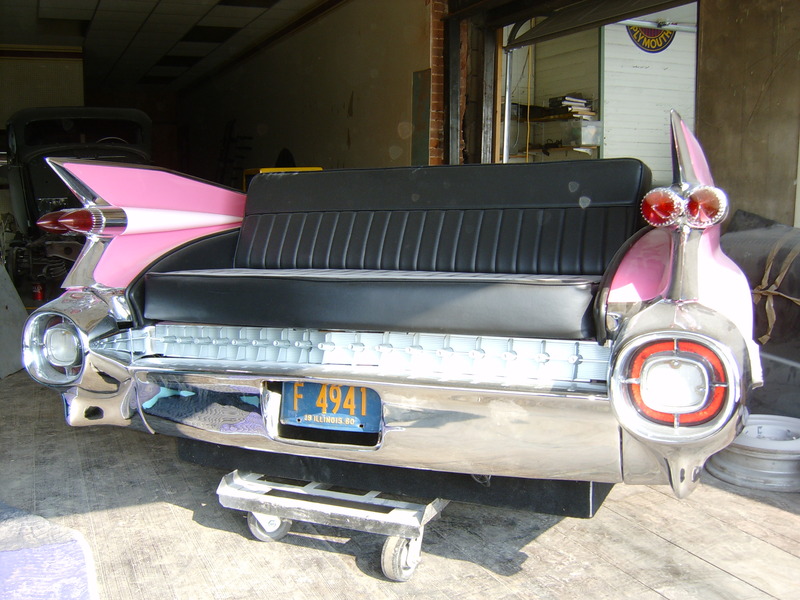 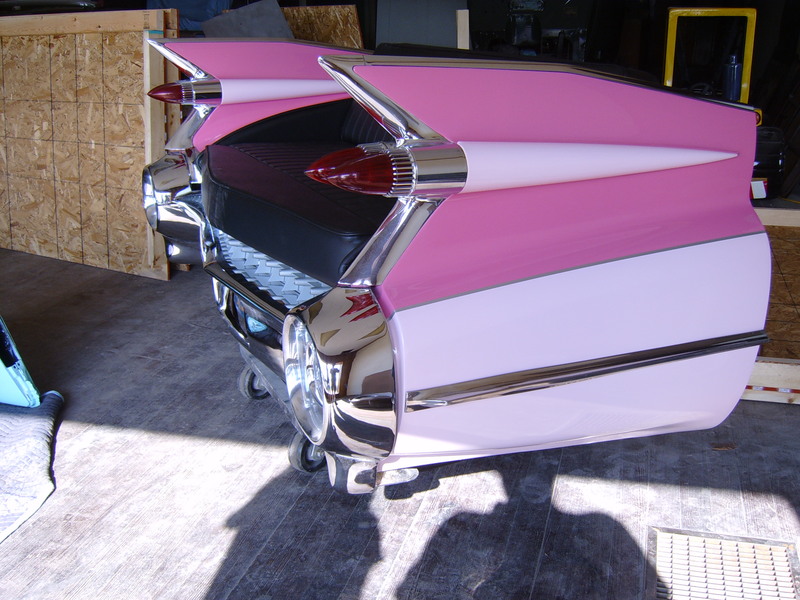 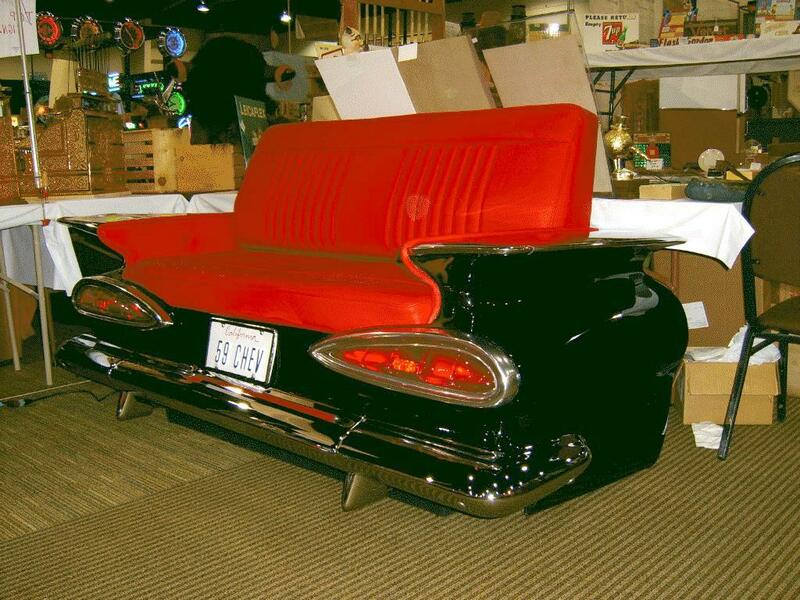 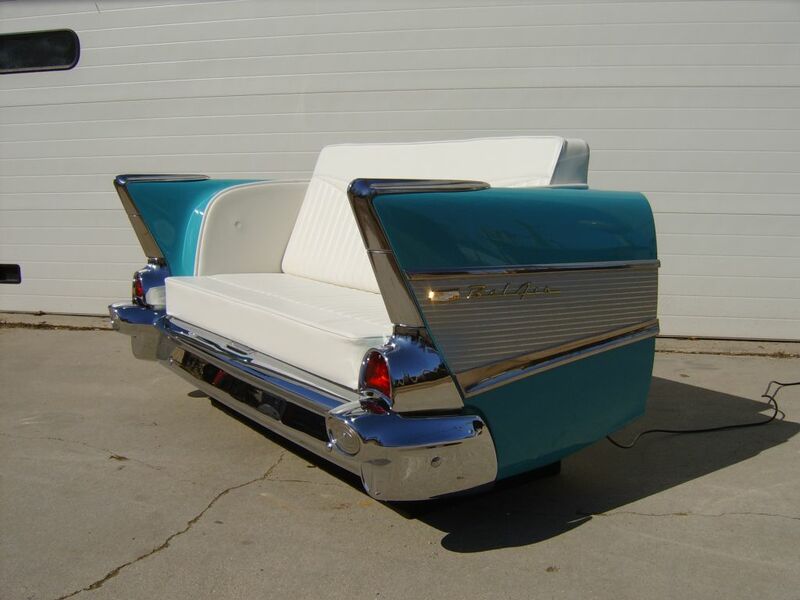 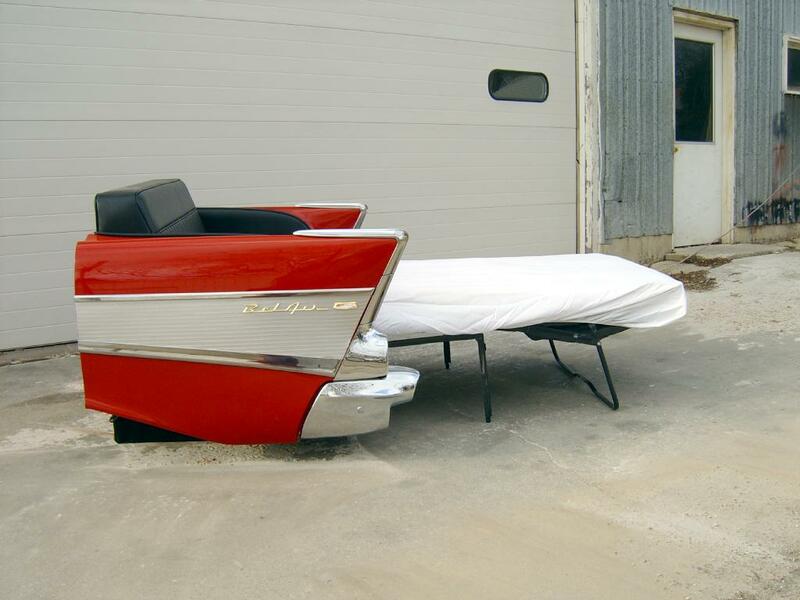 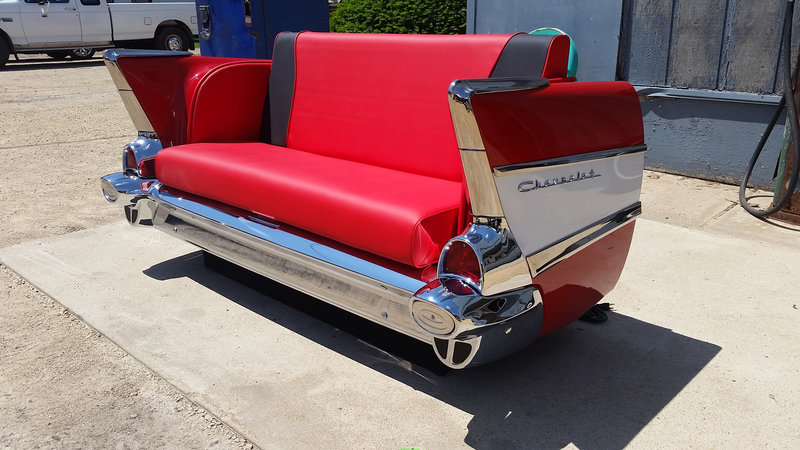 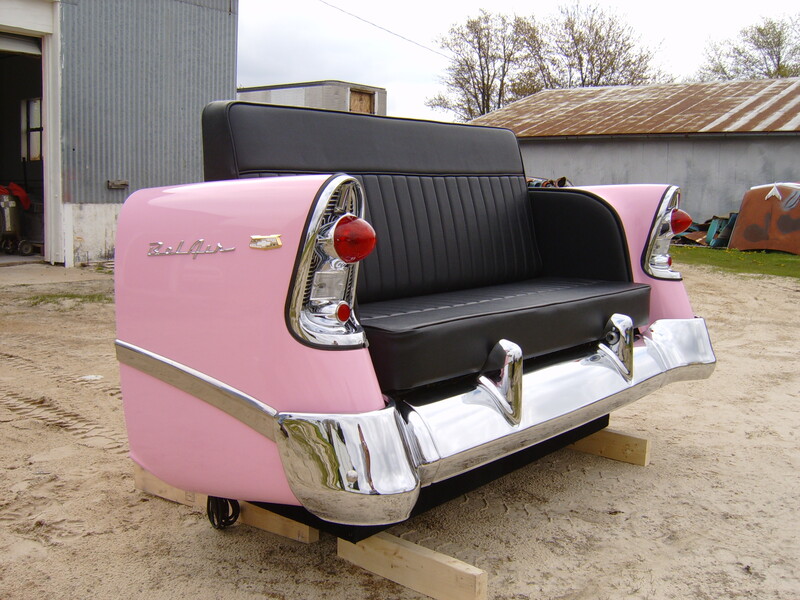 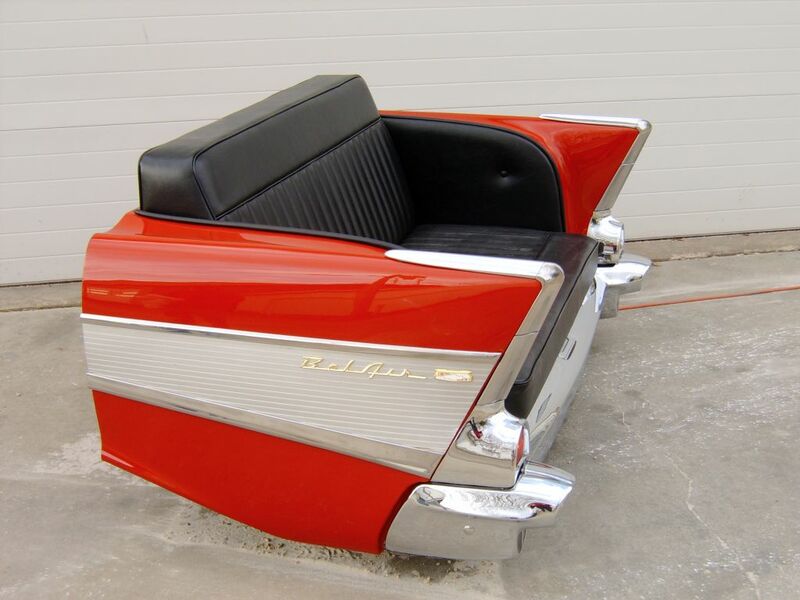 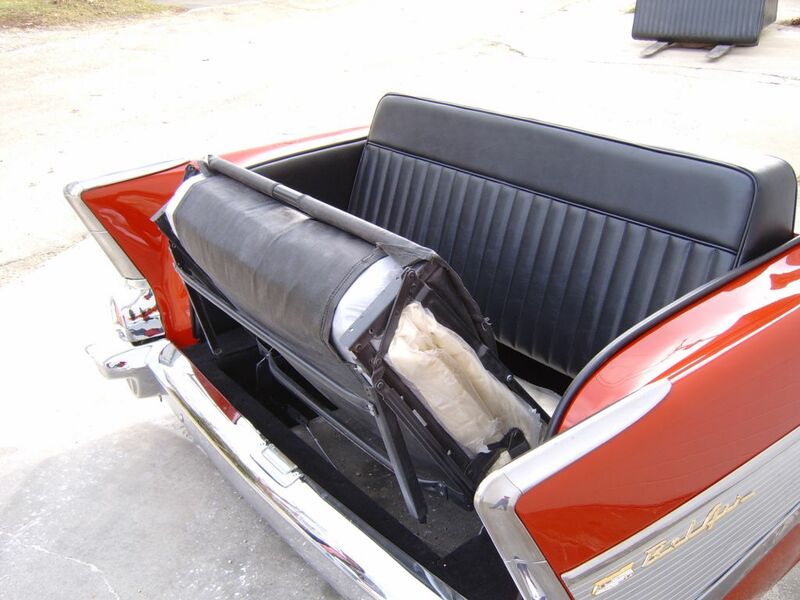 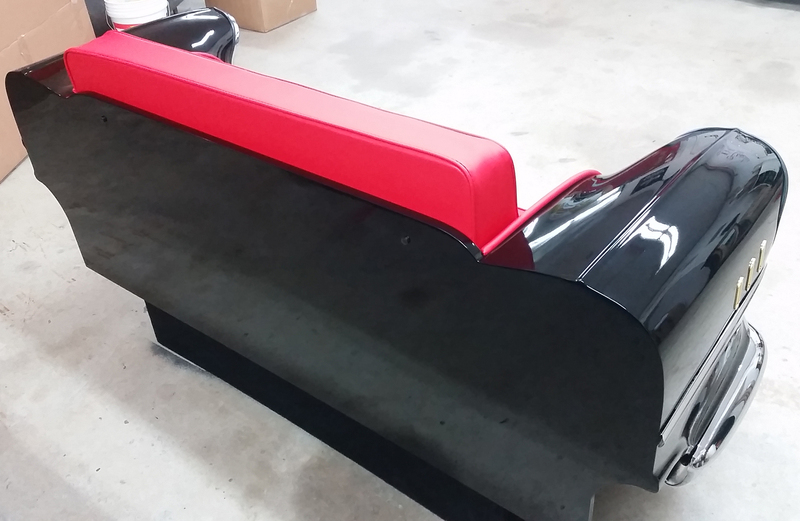 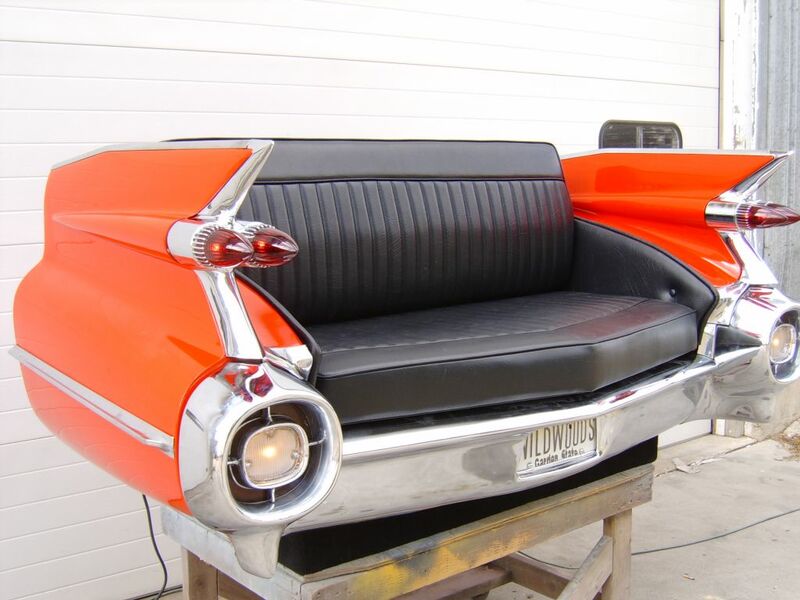 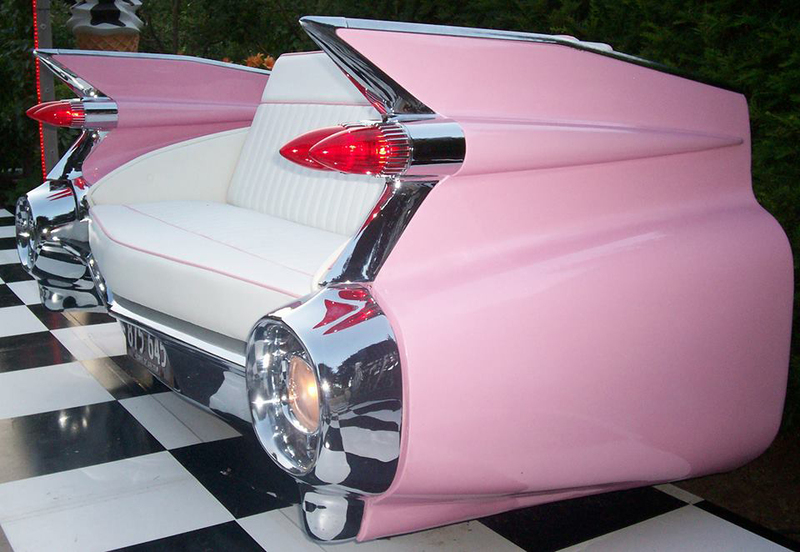 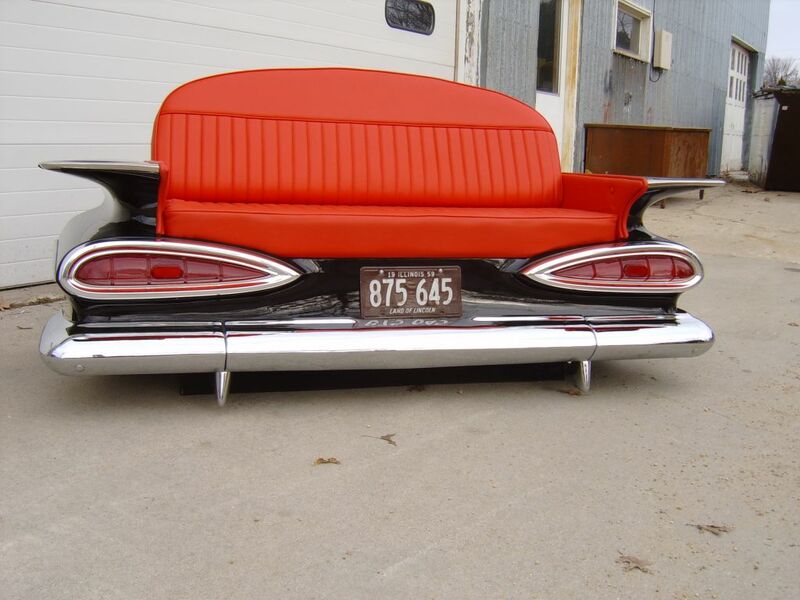 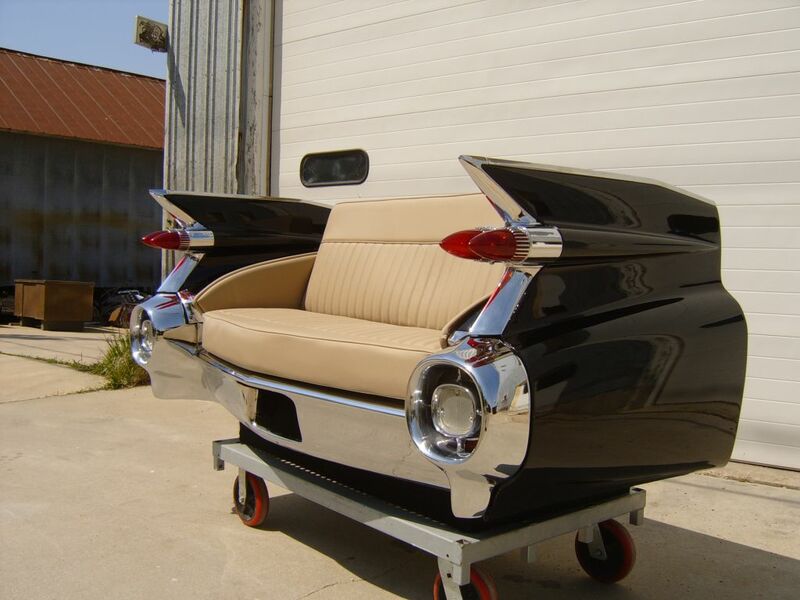 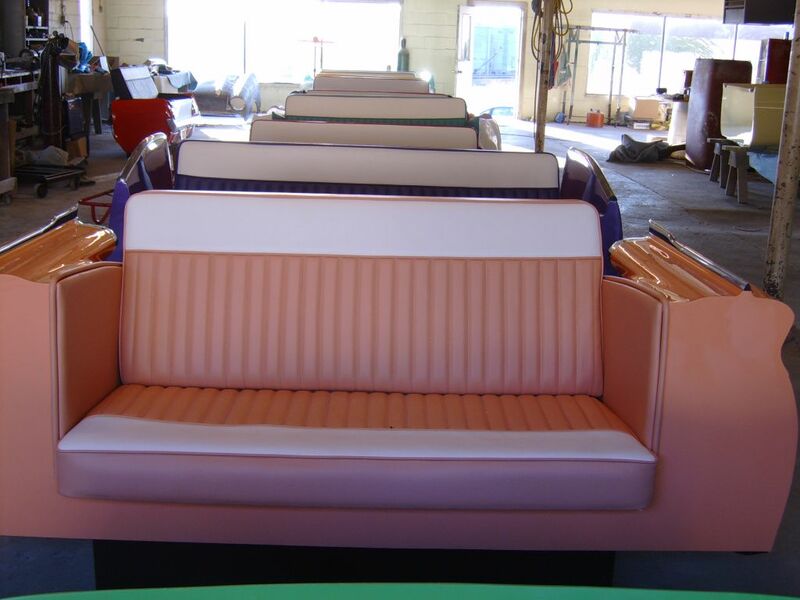 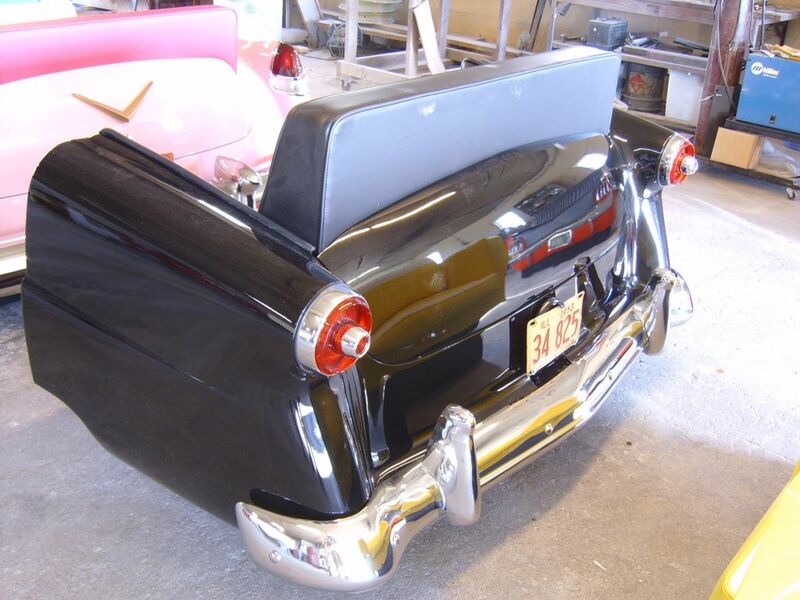 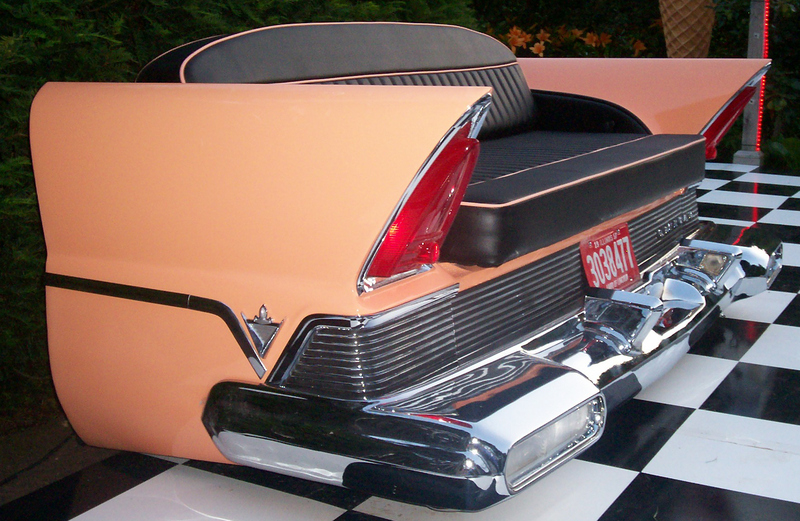 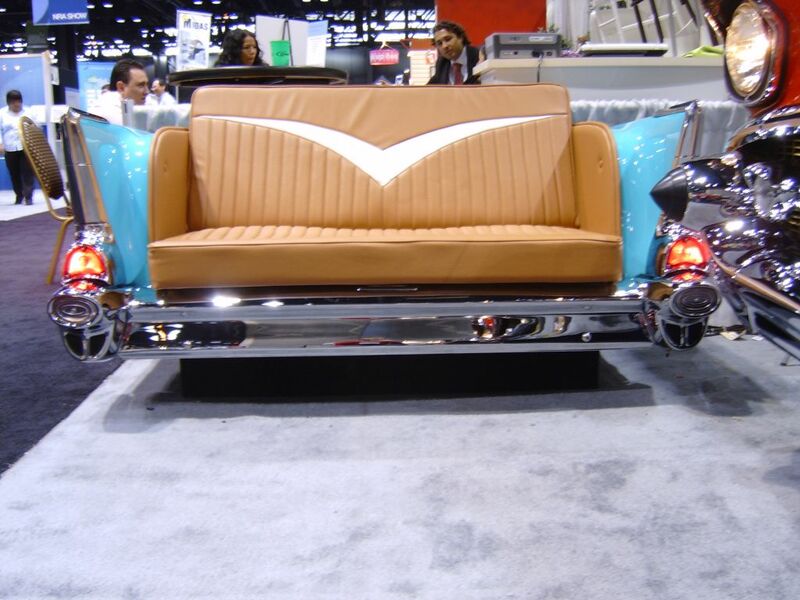 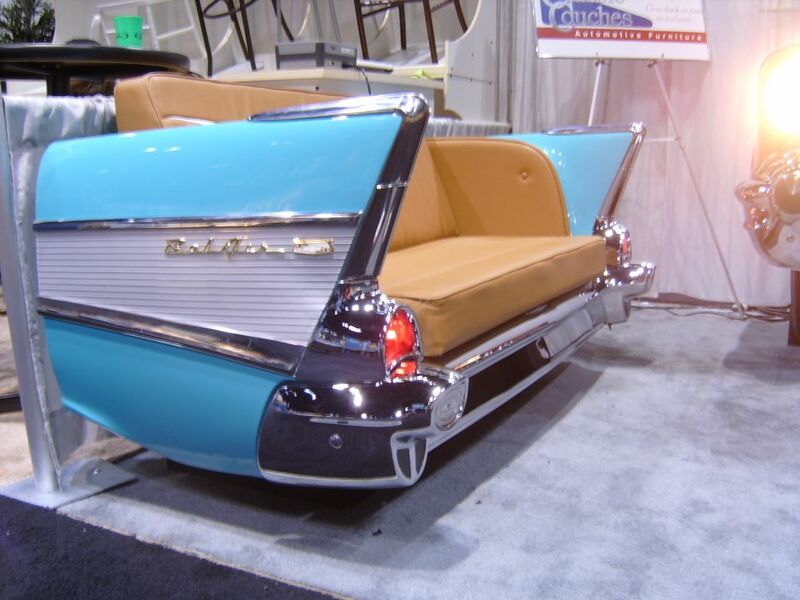 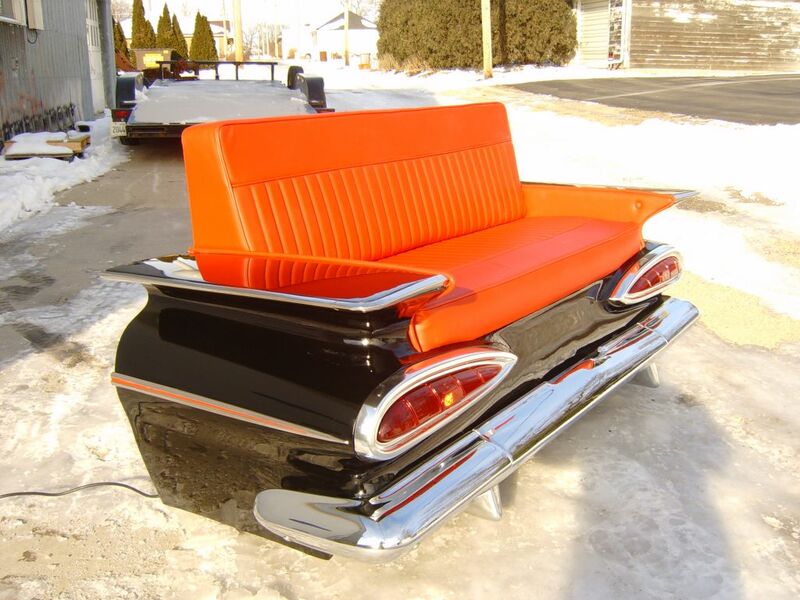 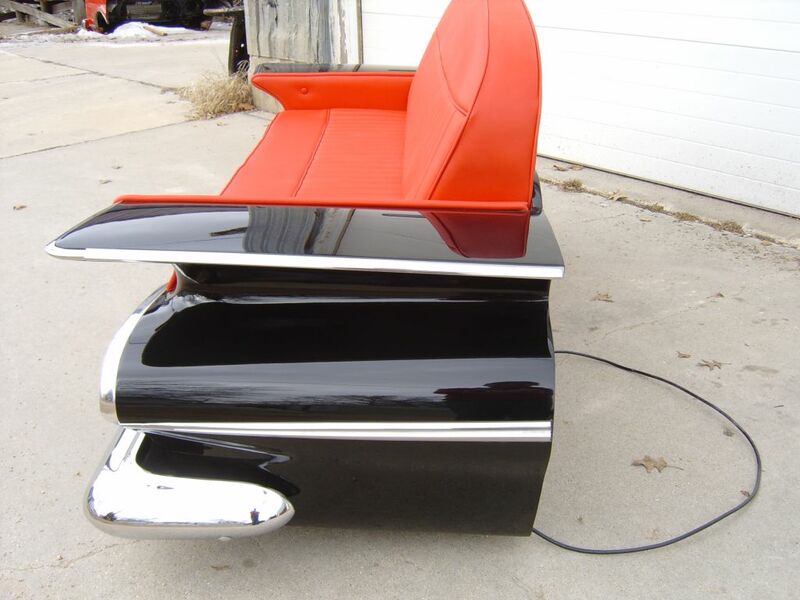 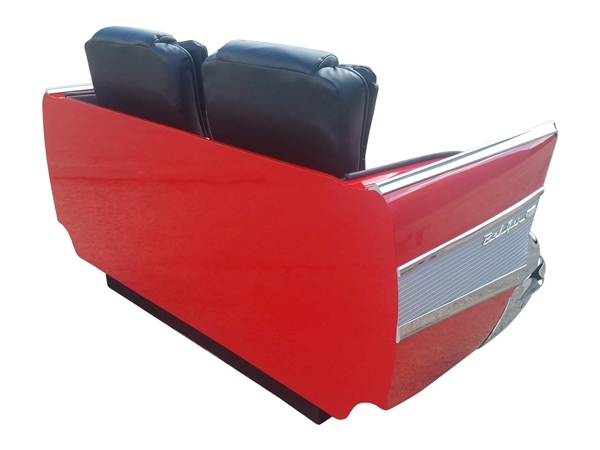 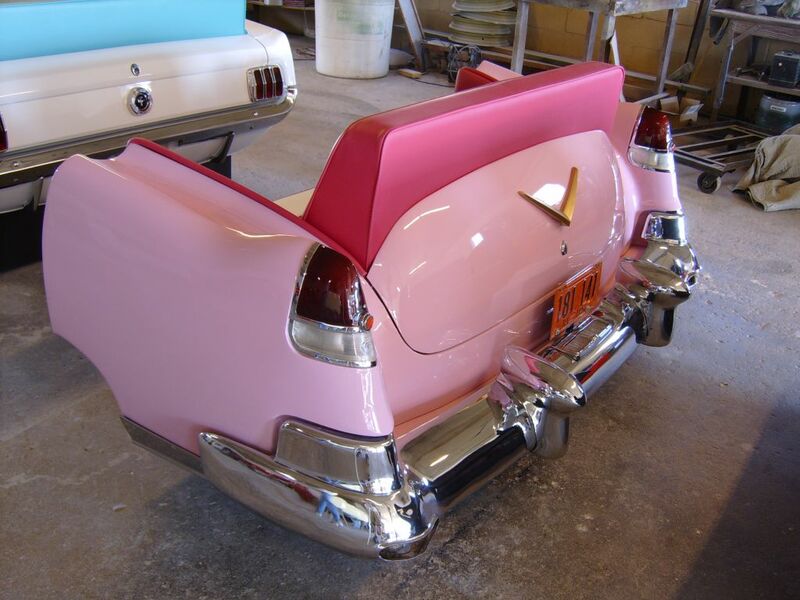 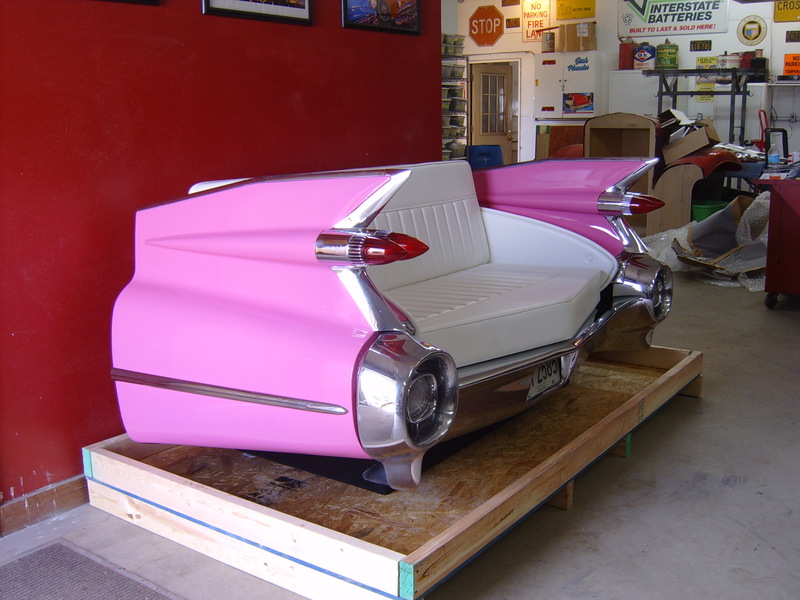 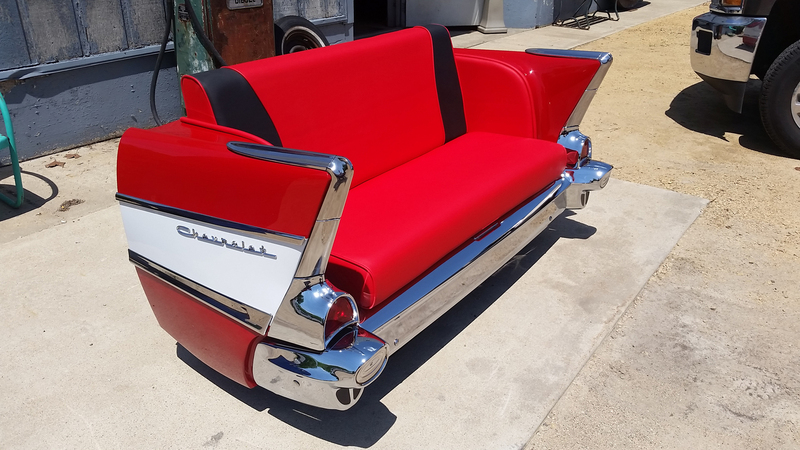 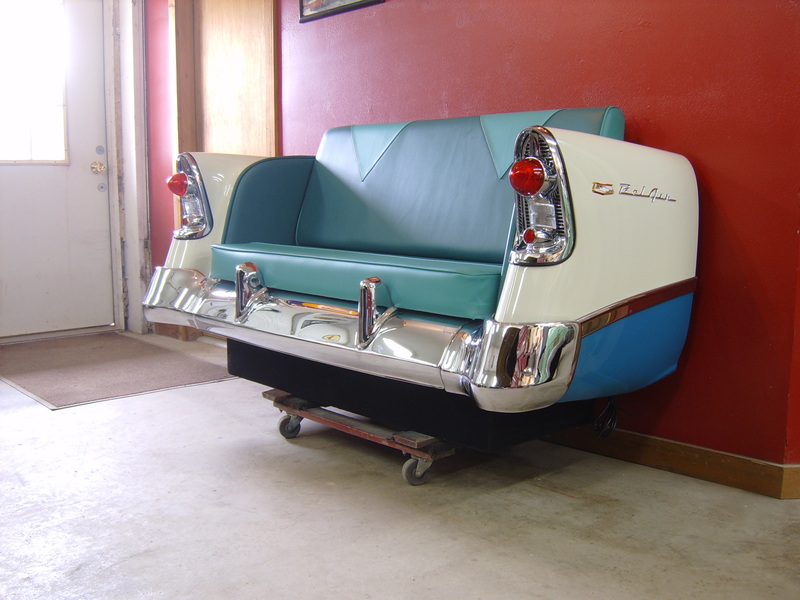 We can offer this beautiful 1957 Chevy Bel Air Rear End Car Couch ready to go in 4 weeks. 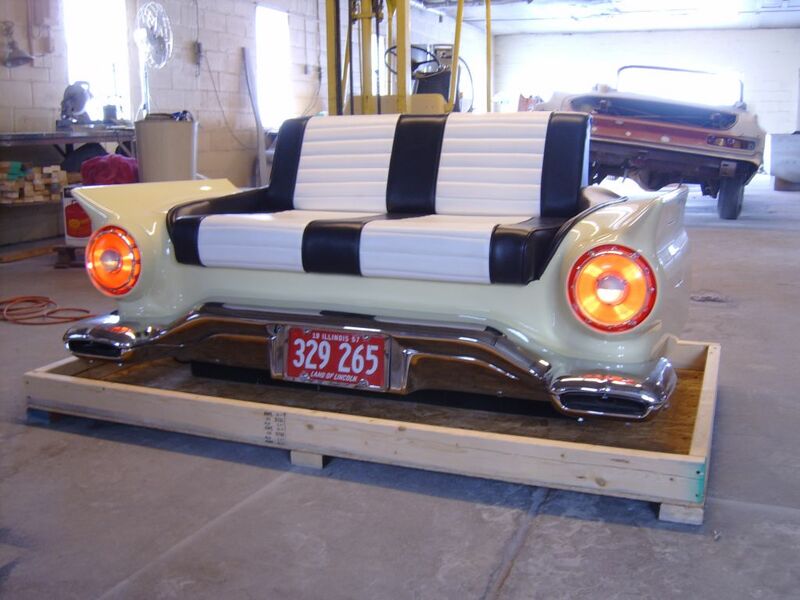 This being for sold for a discounted price of only $7,810.00 USD plus shipping. 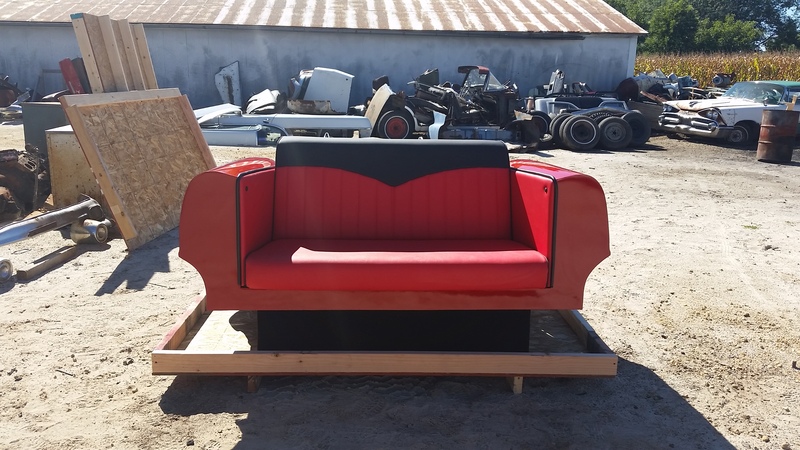 Please call today to order one of these couches. 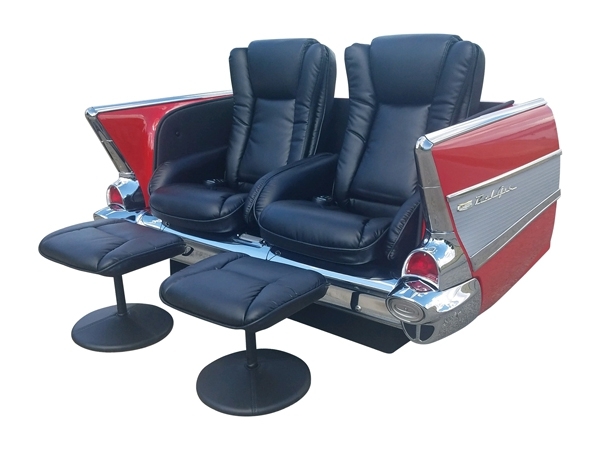 This functional work-of-art is available at an amazing price to the first (4) lucky customers! 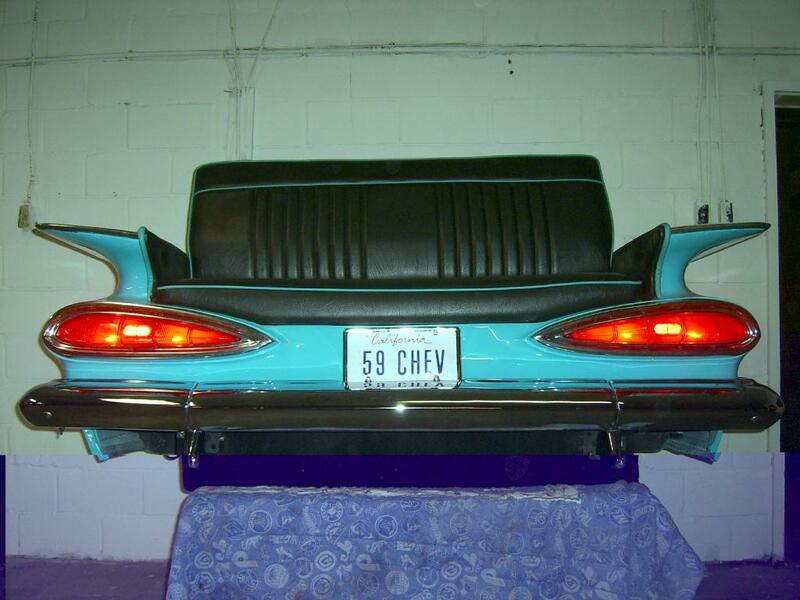 FLASH SALE: We have some rear ends primed and ready to finish. 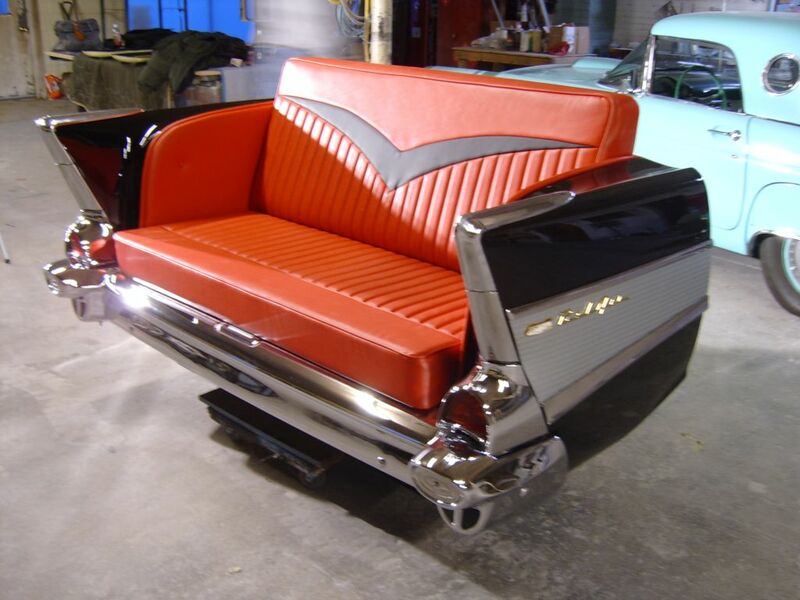 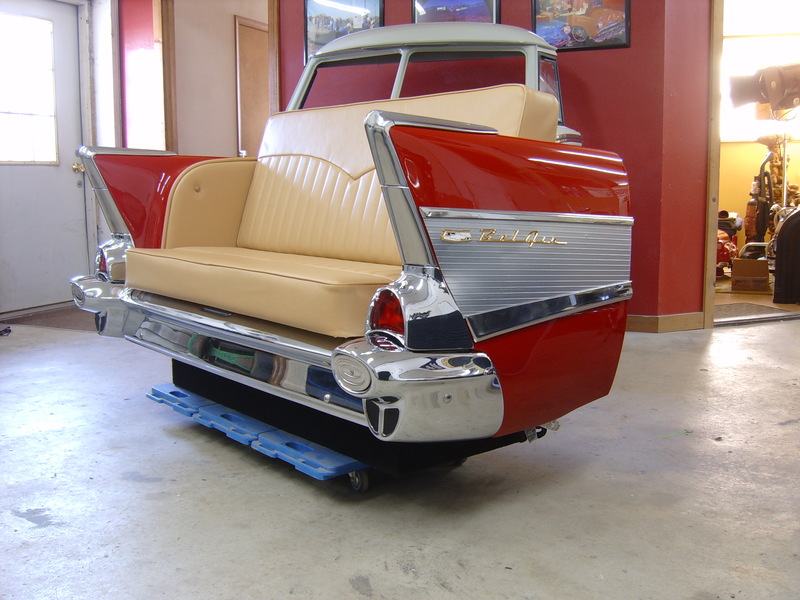 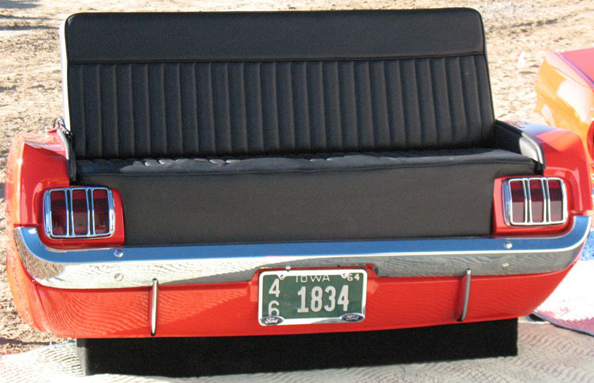 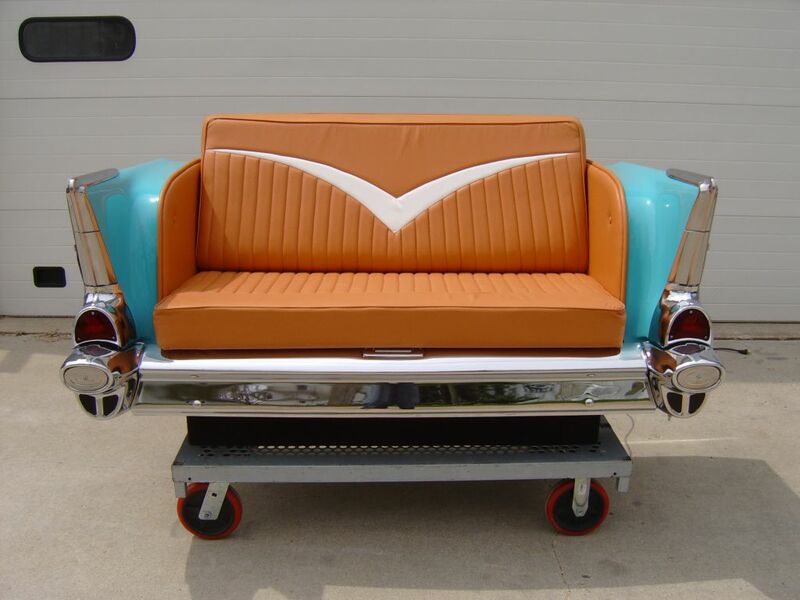 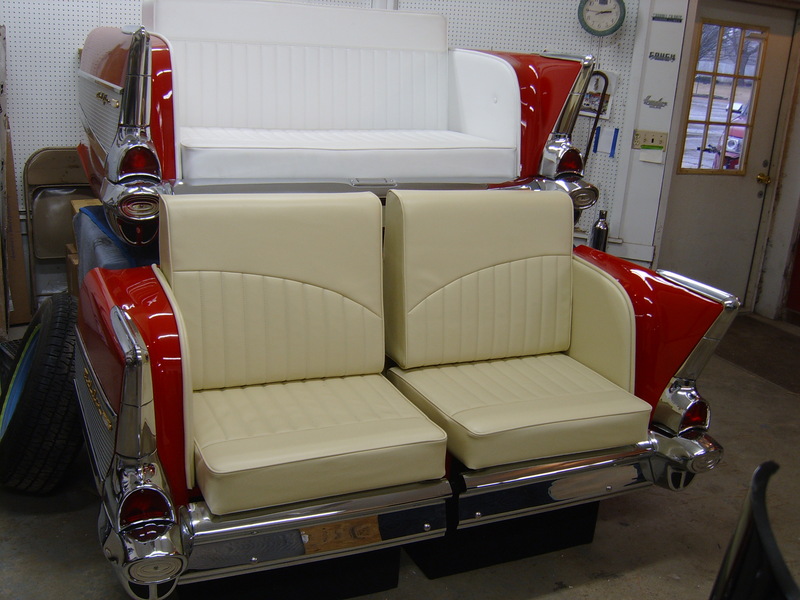 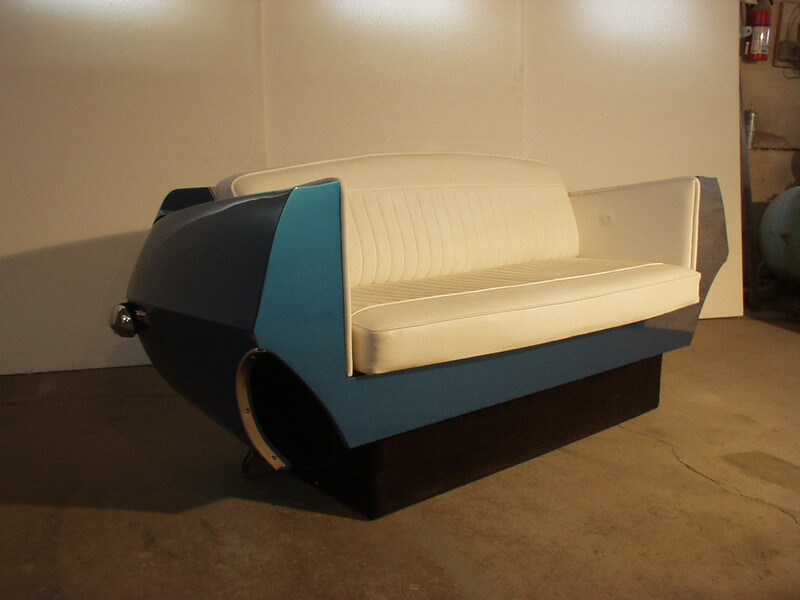 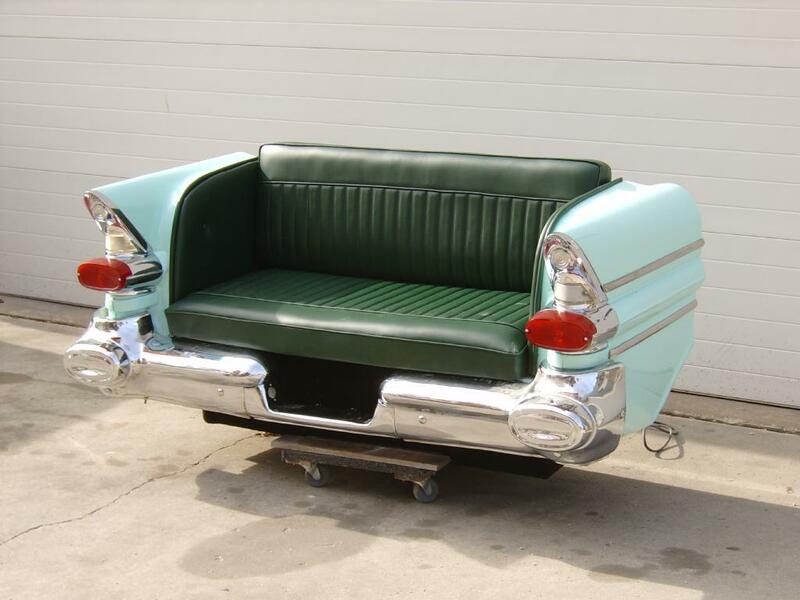 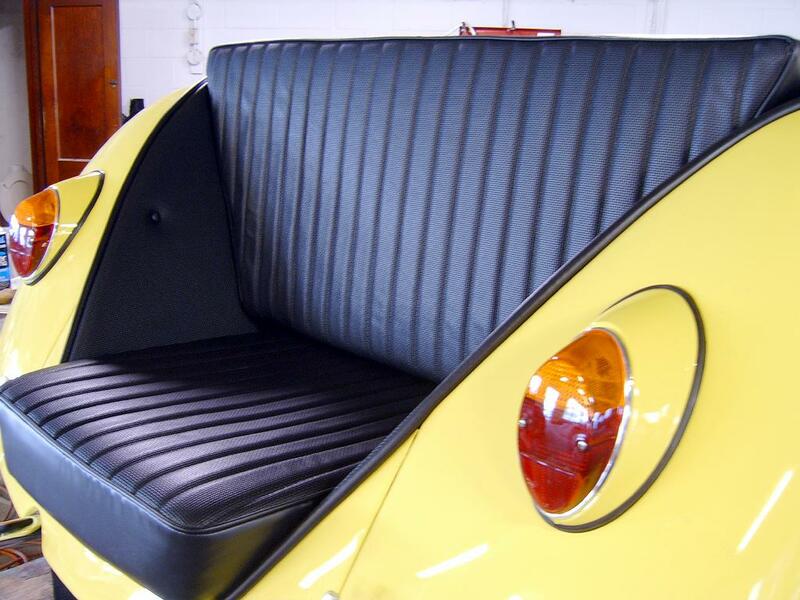 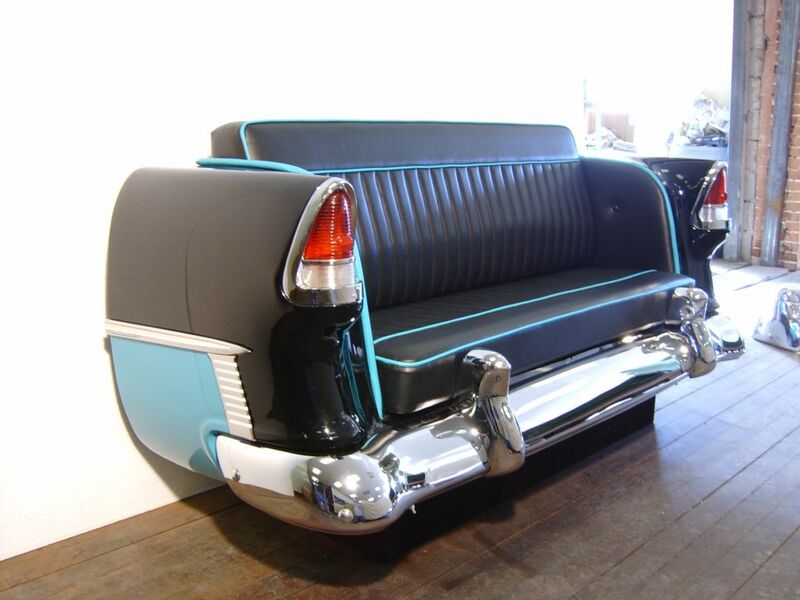 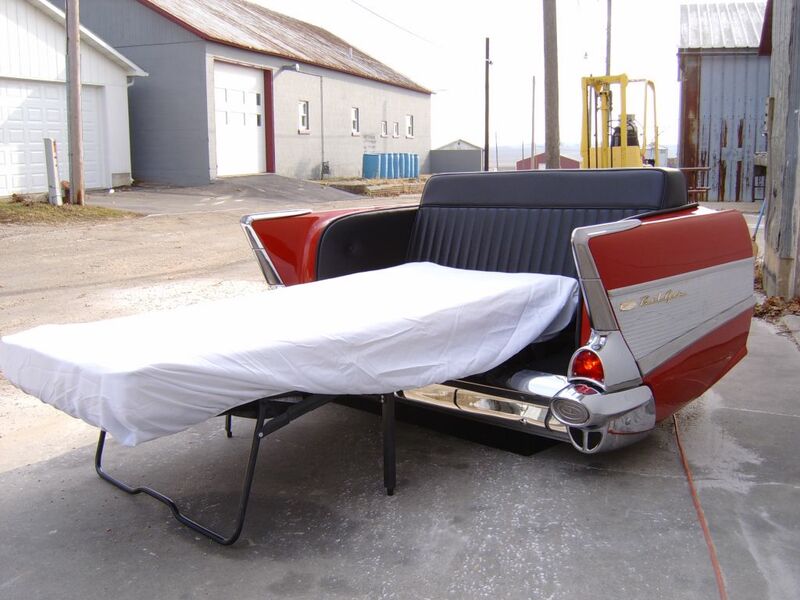 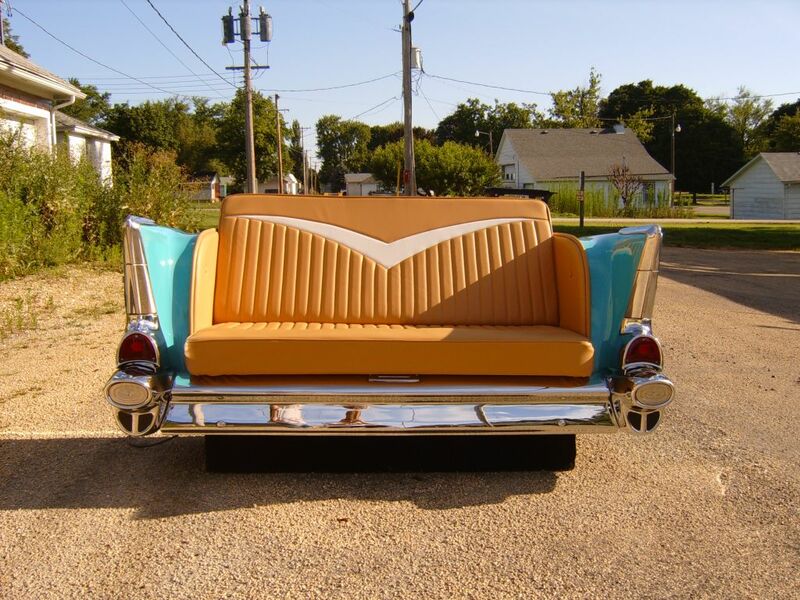 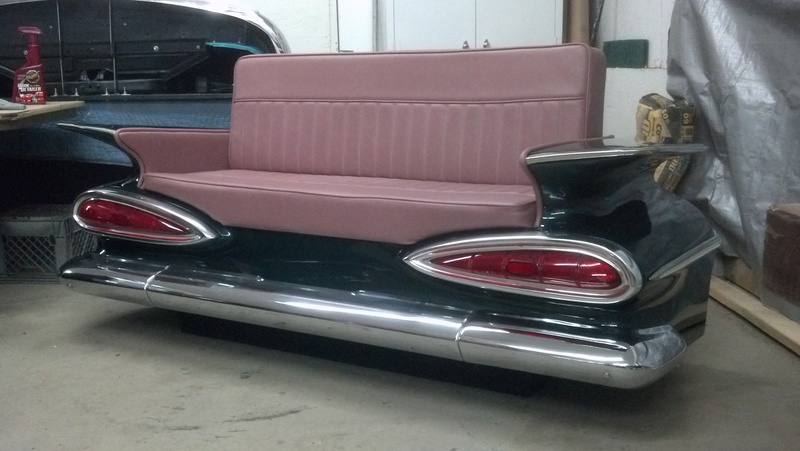 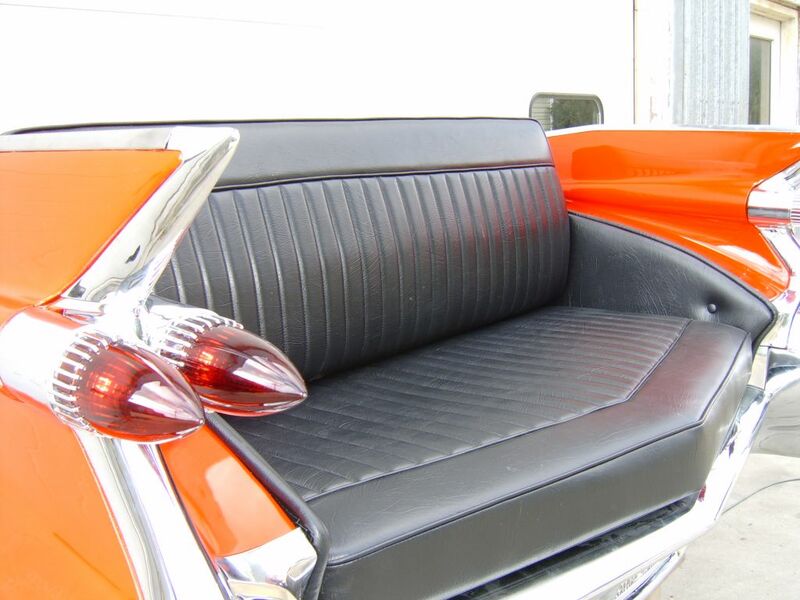 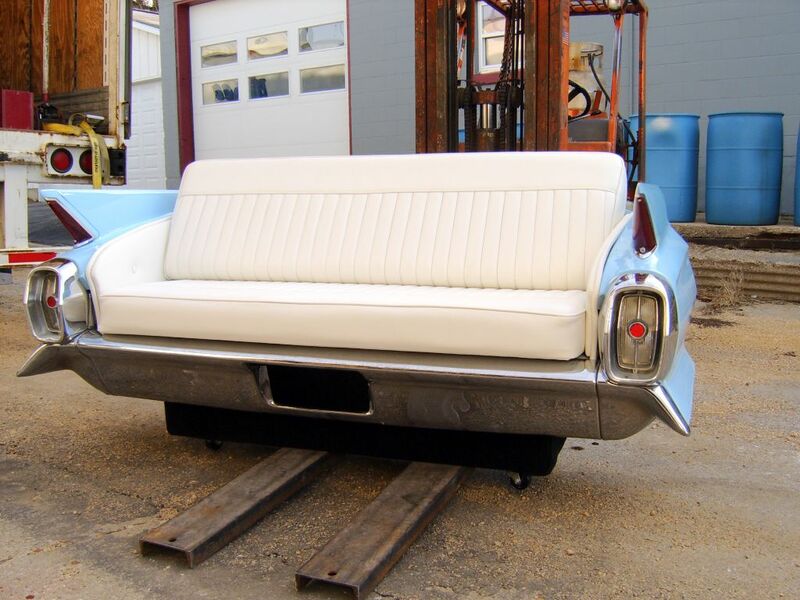 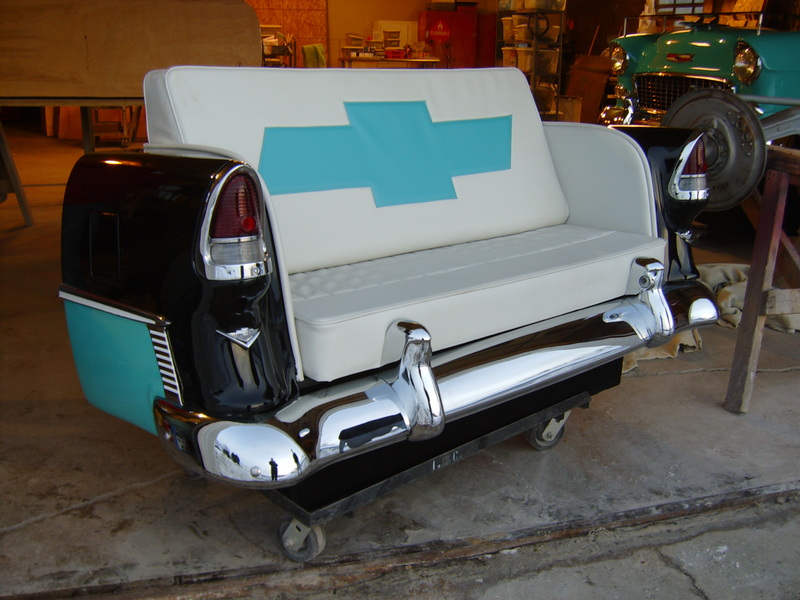 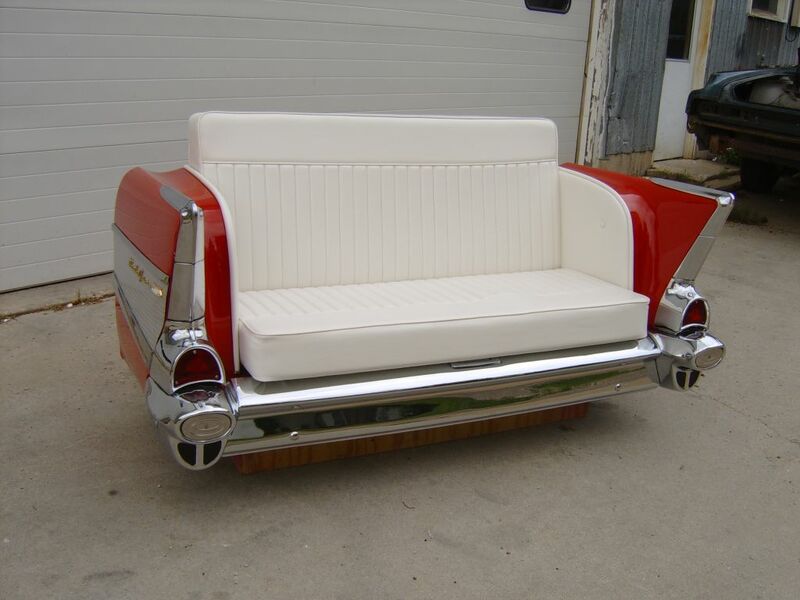 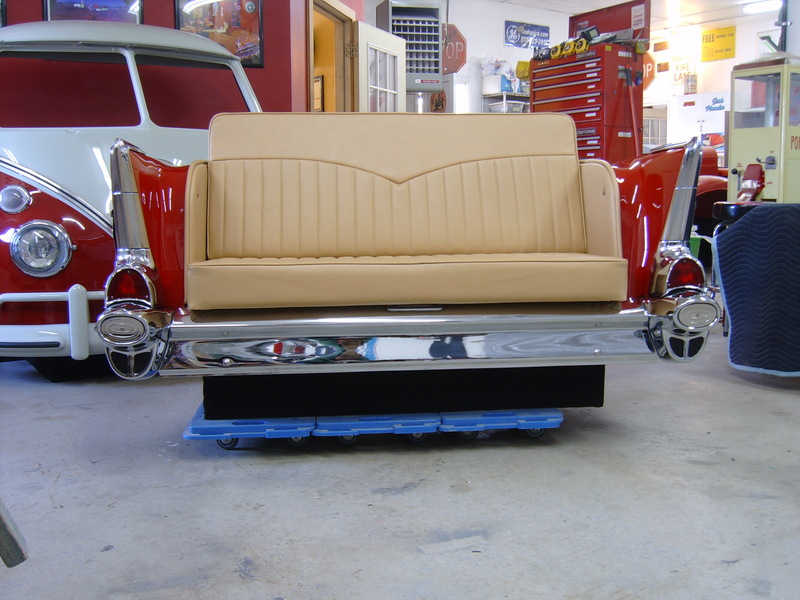 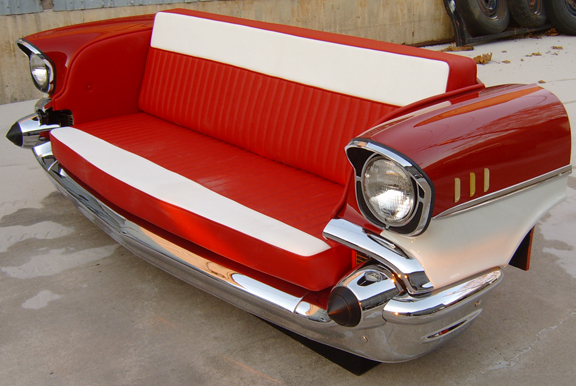 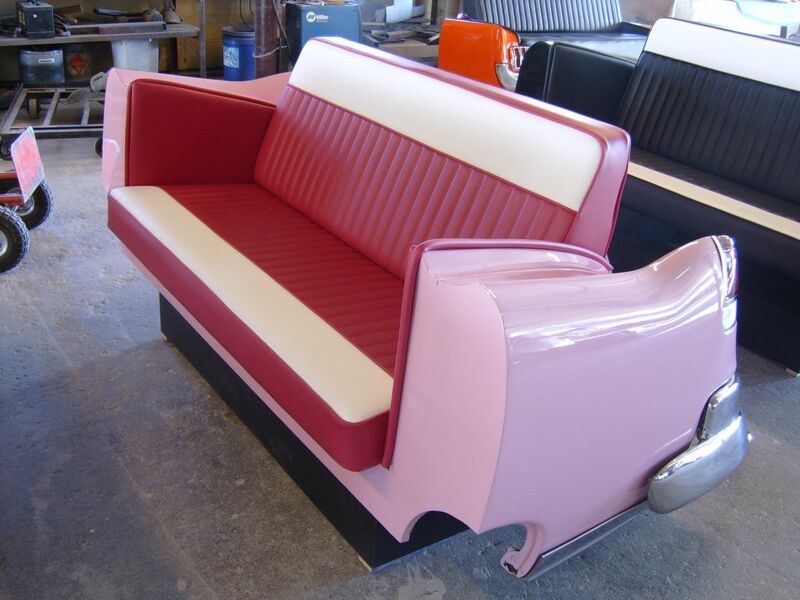 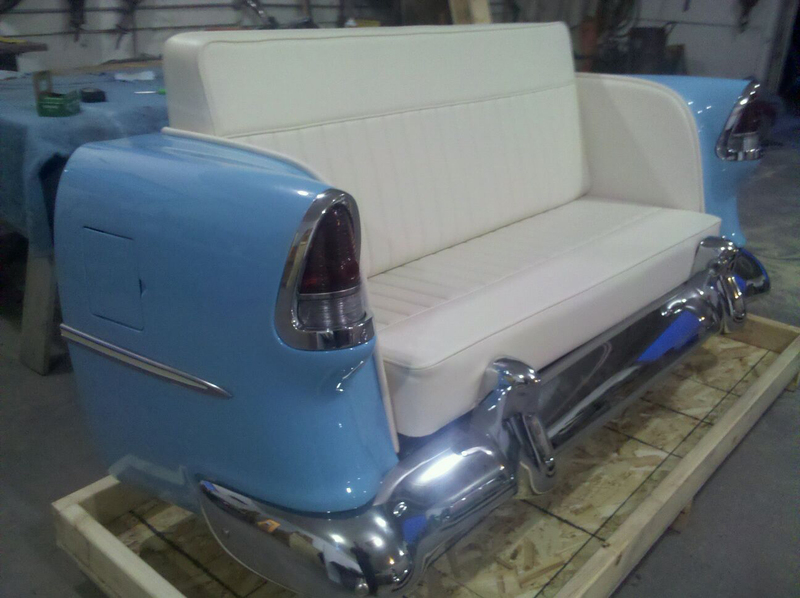 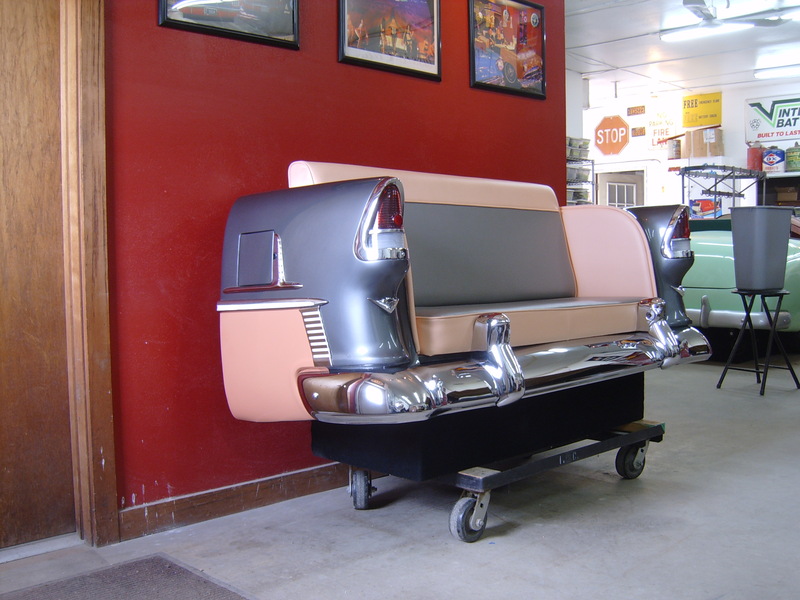 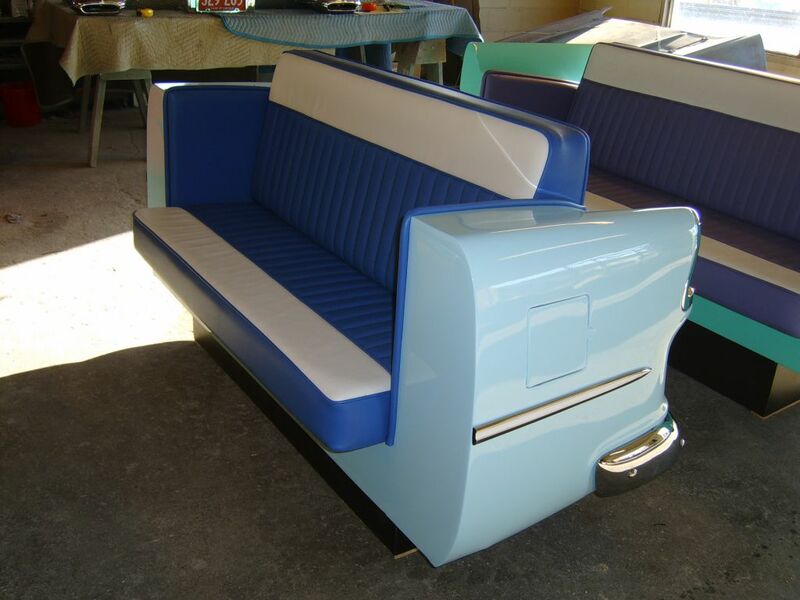 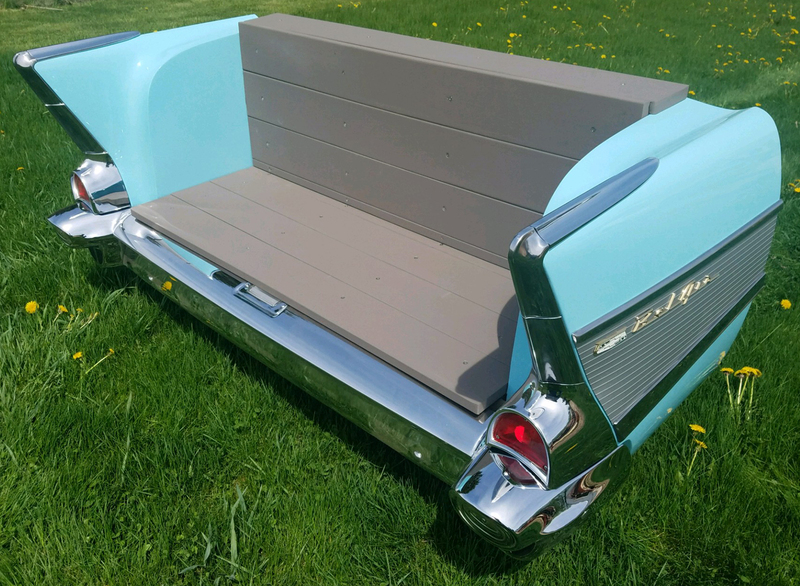 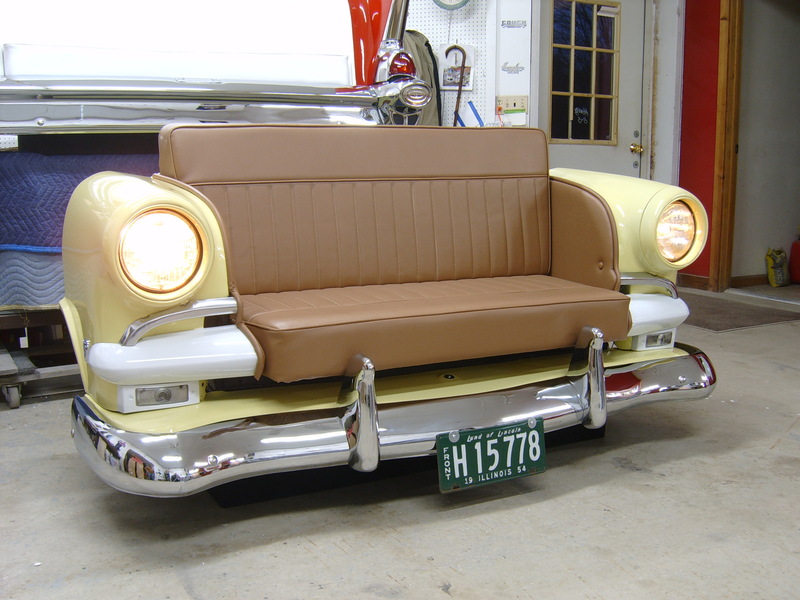 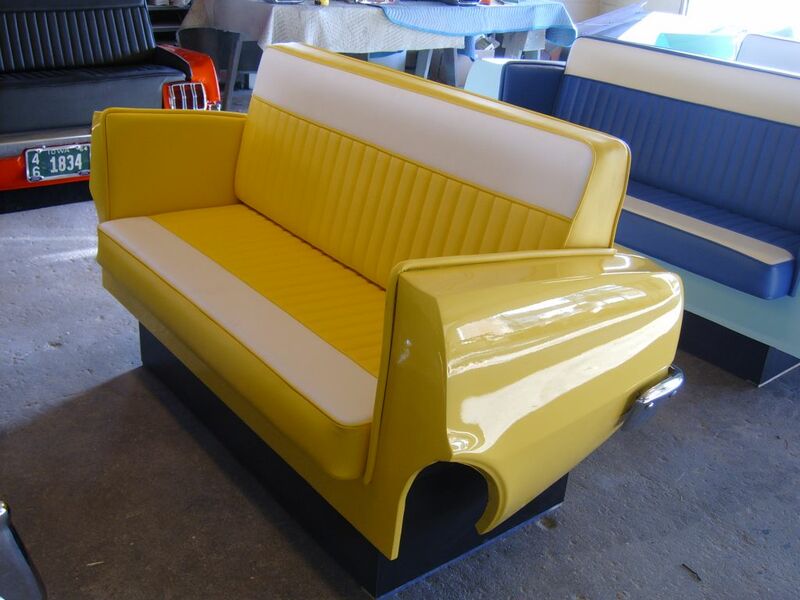 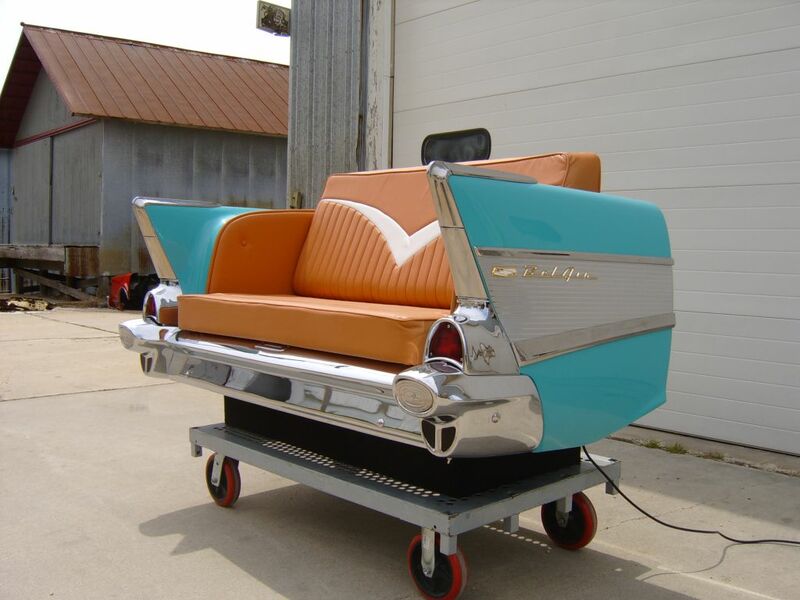 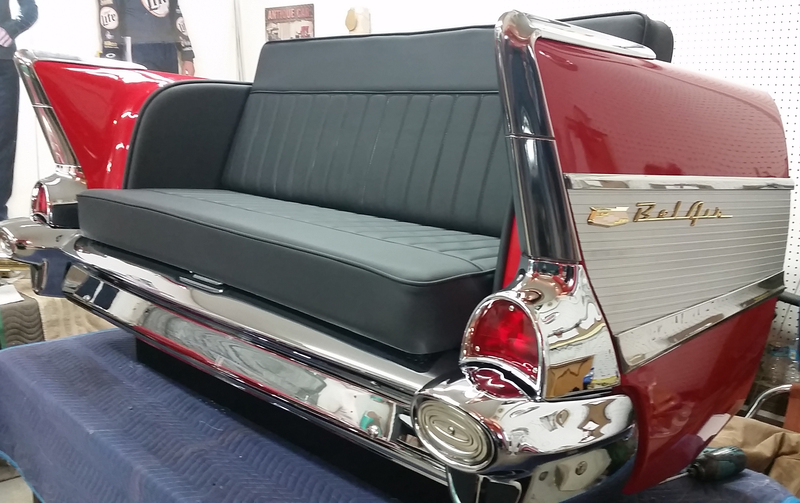 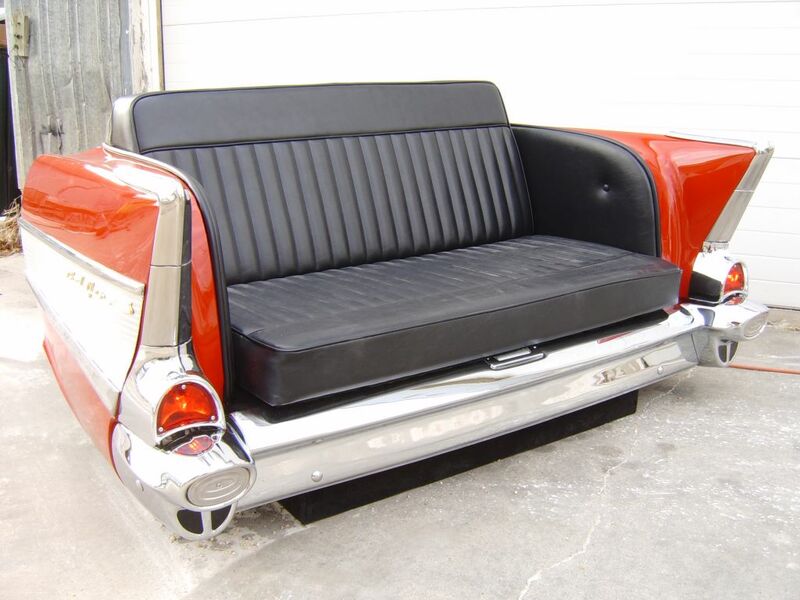 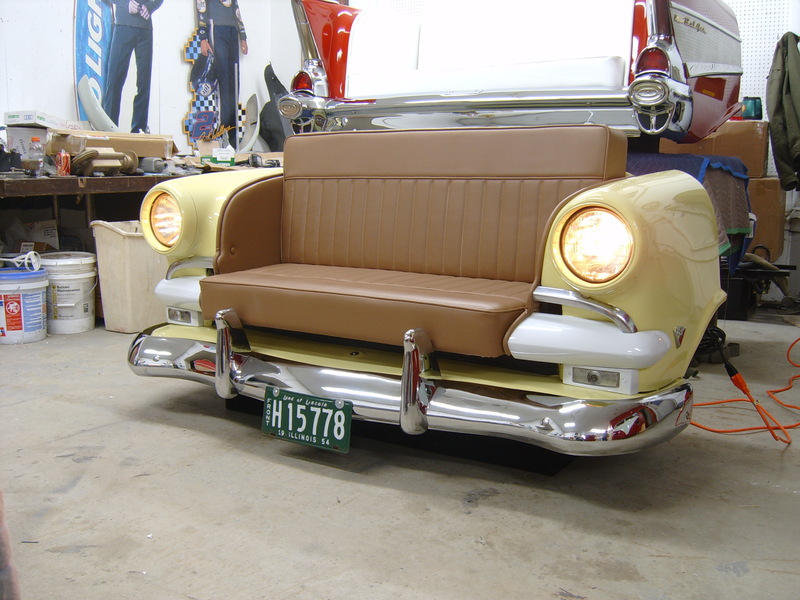 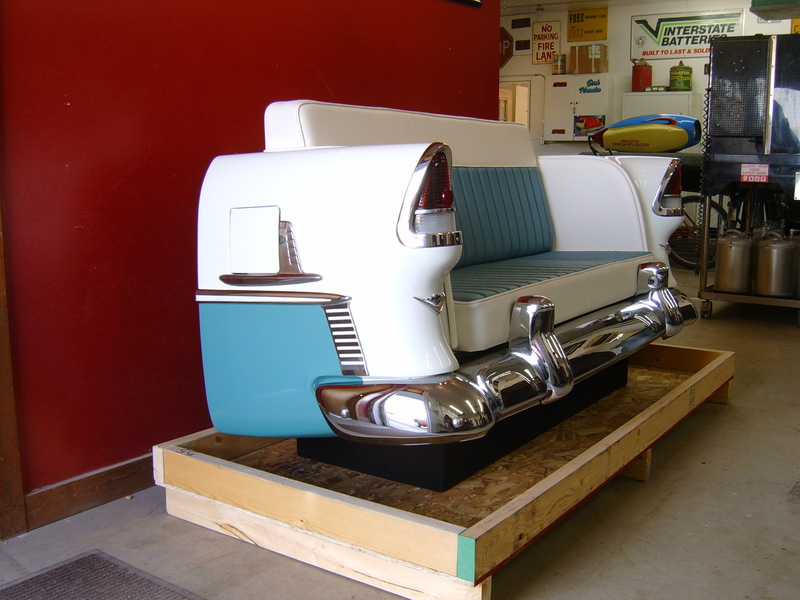 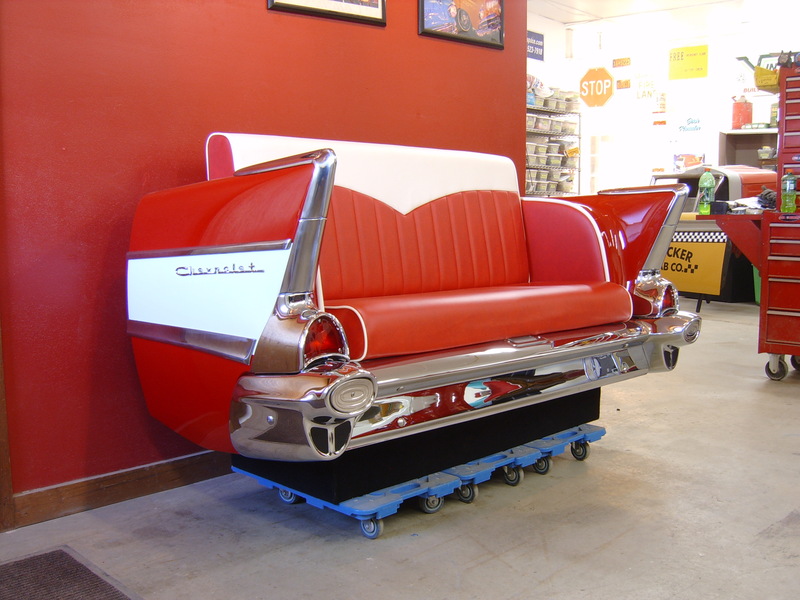 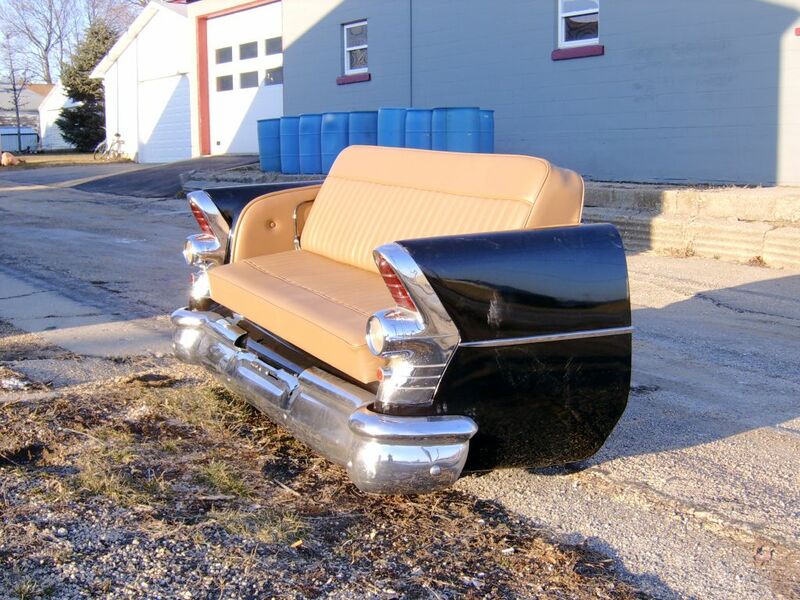 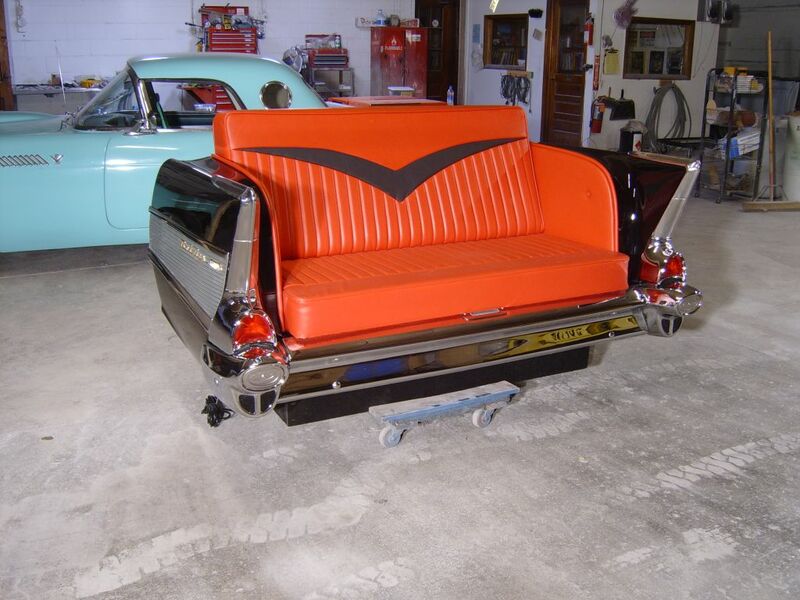 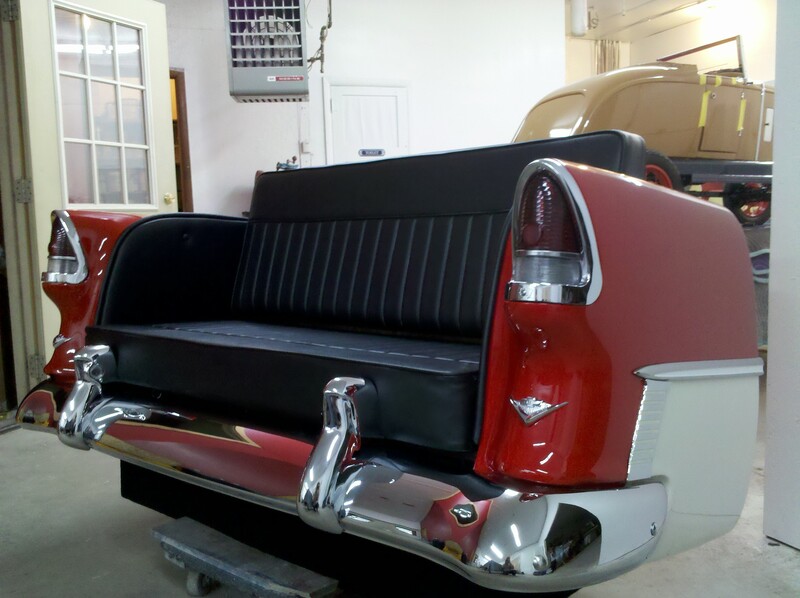 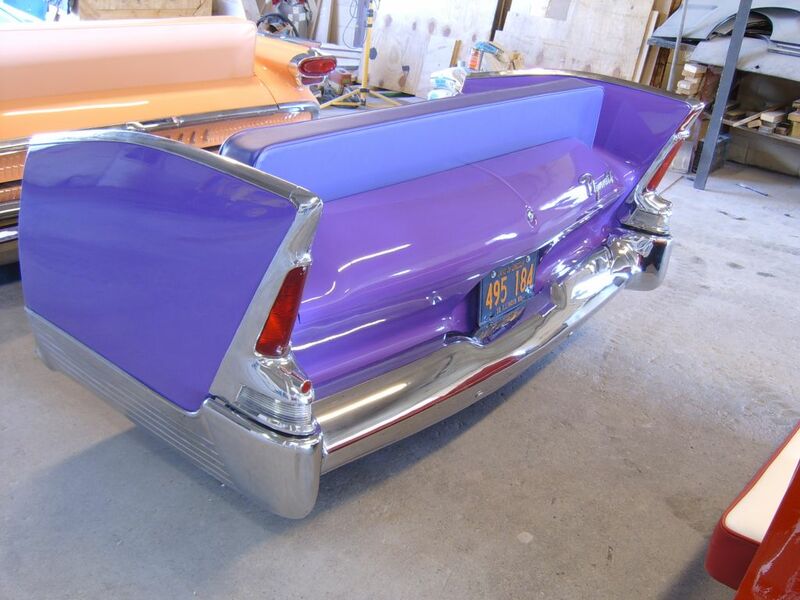 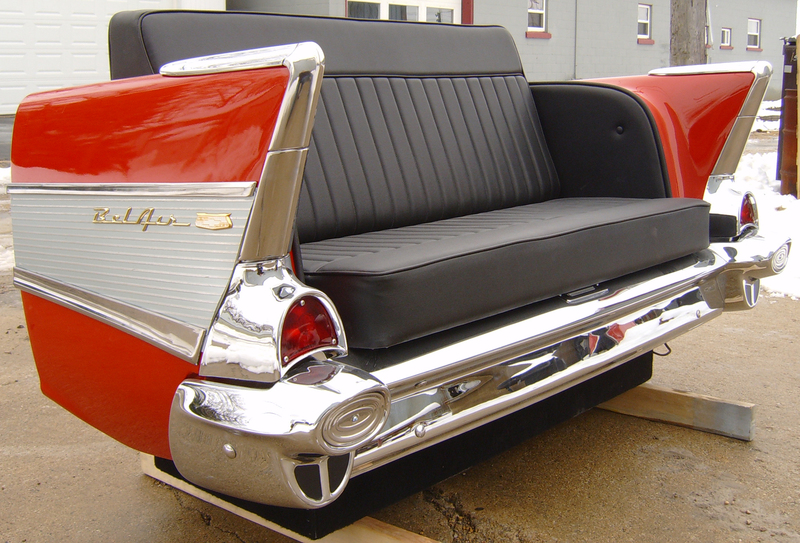 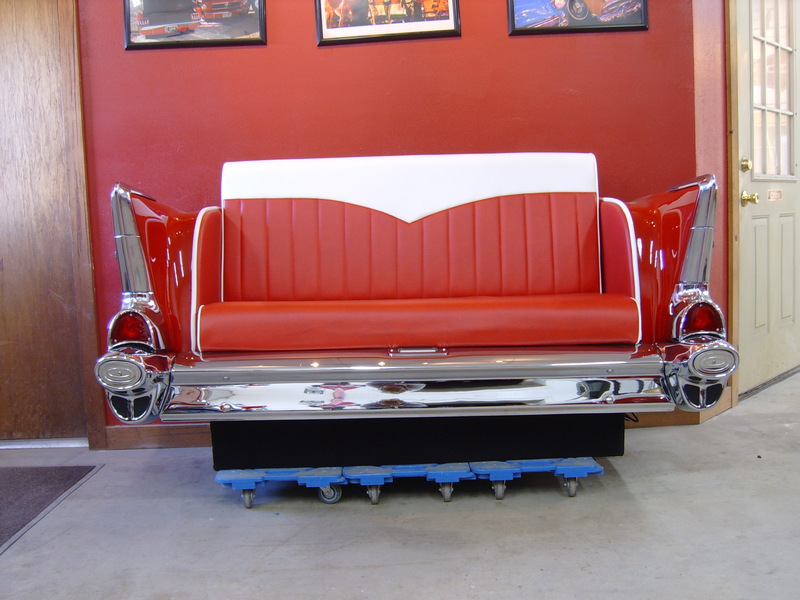 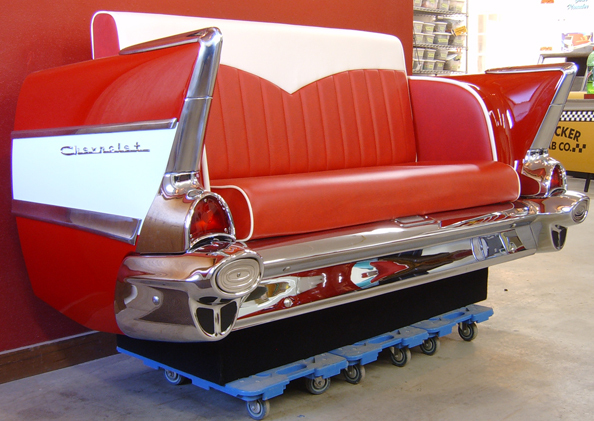 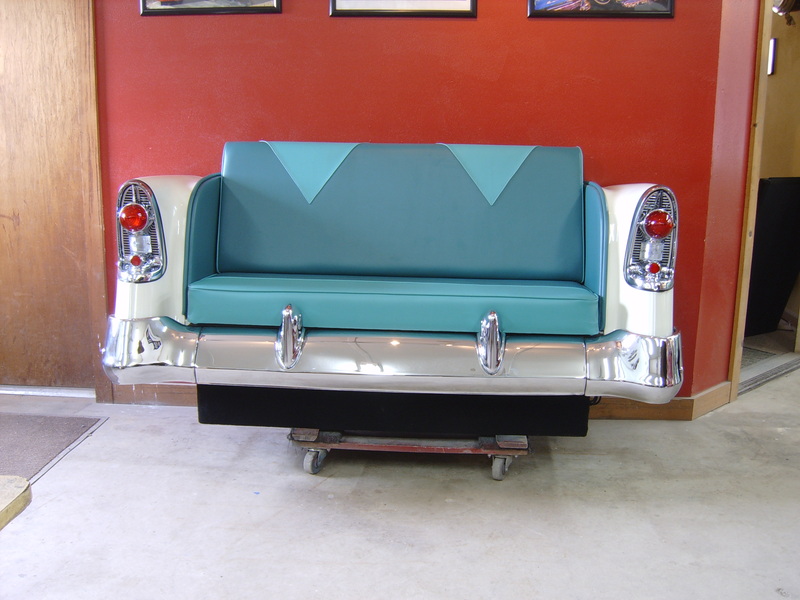 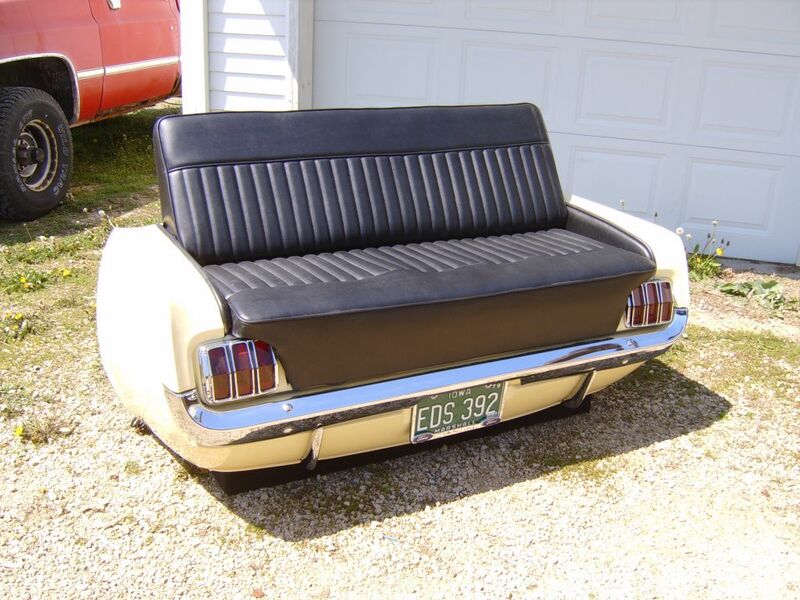 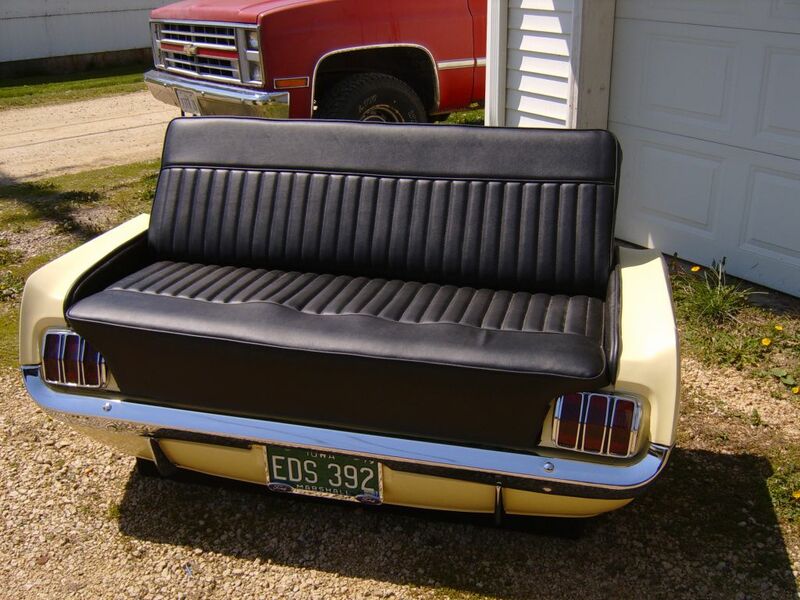 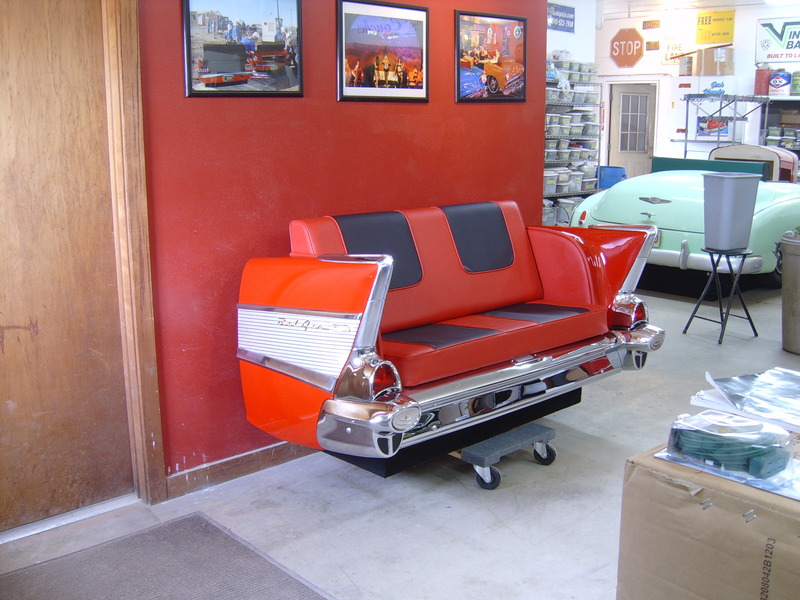 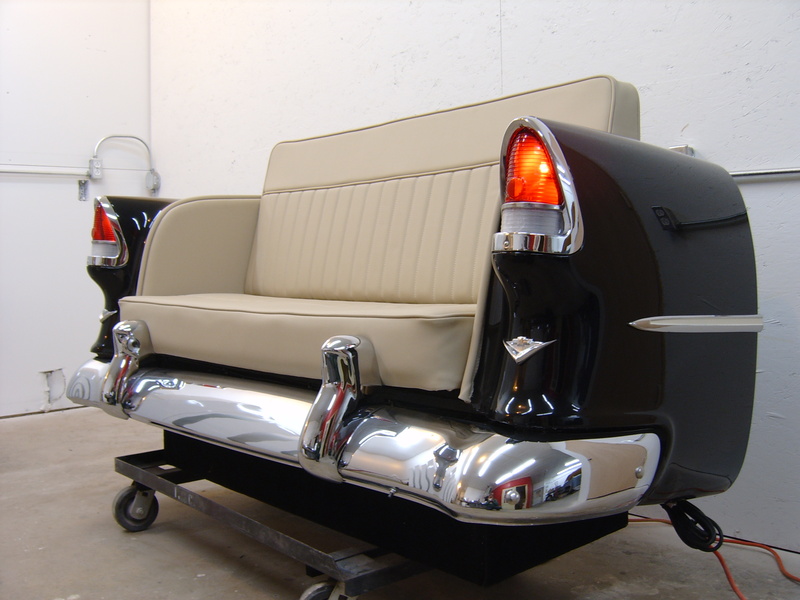 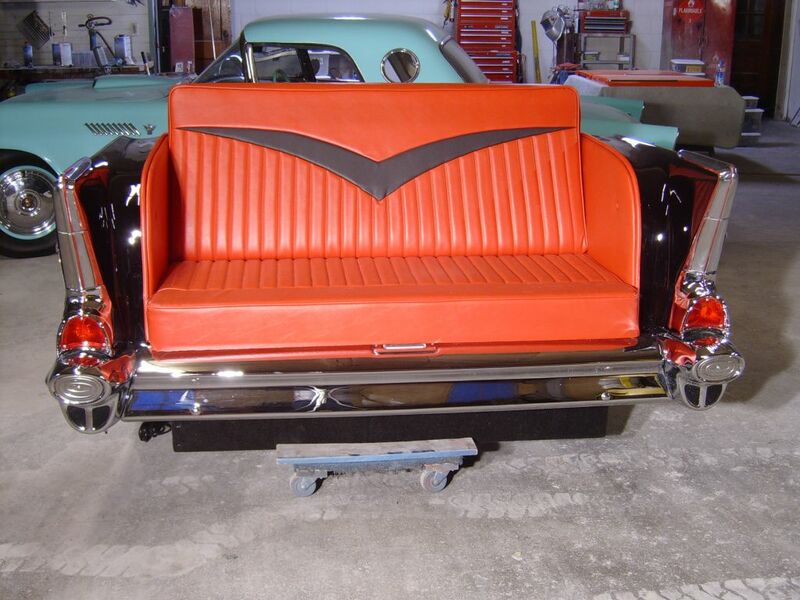 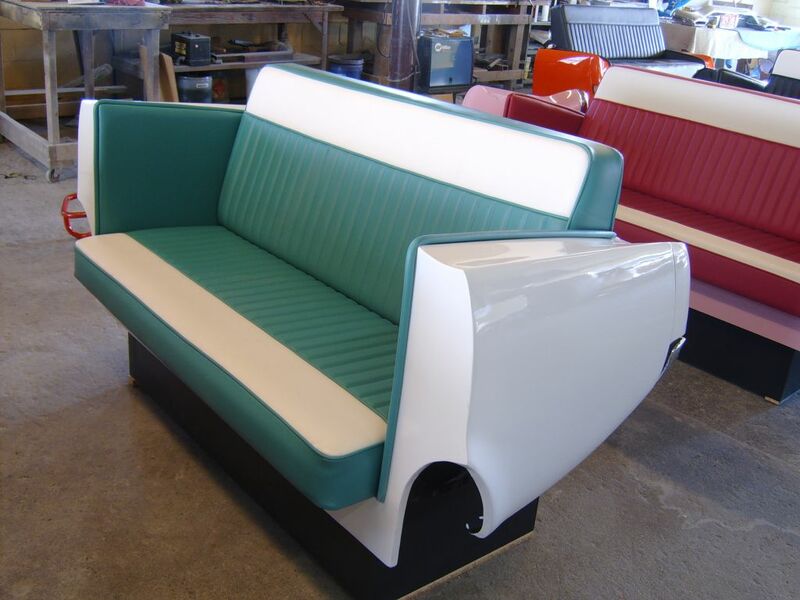 We can offer this beautiful 1957 Chevy 210 Rear End Car Couch ready to go in 4-6 weeks. 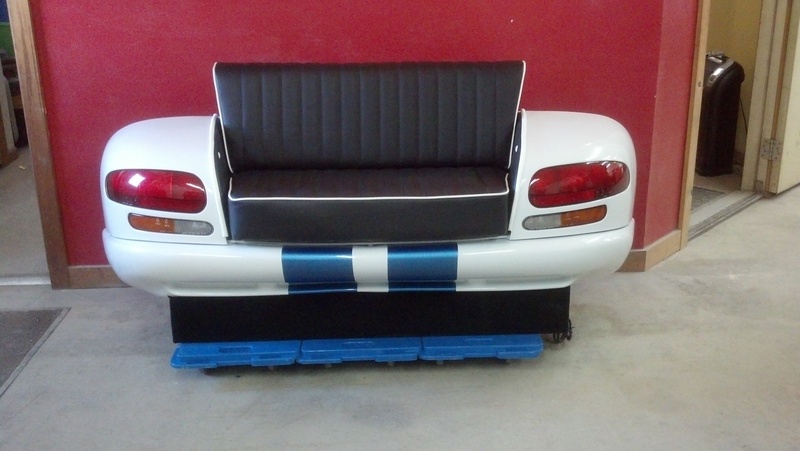 This being for sold for a discounted price of only $7,810.00 USD plus shipping. 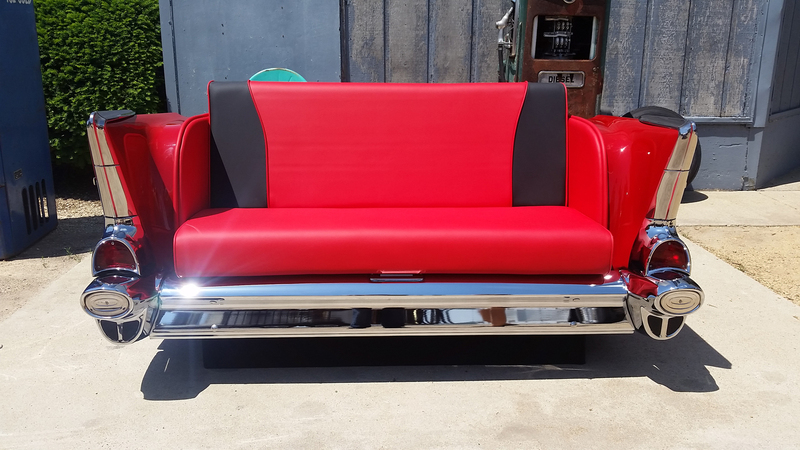 Please call today to order one of these couches. 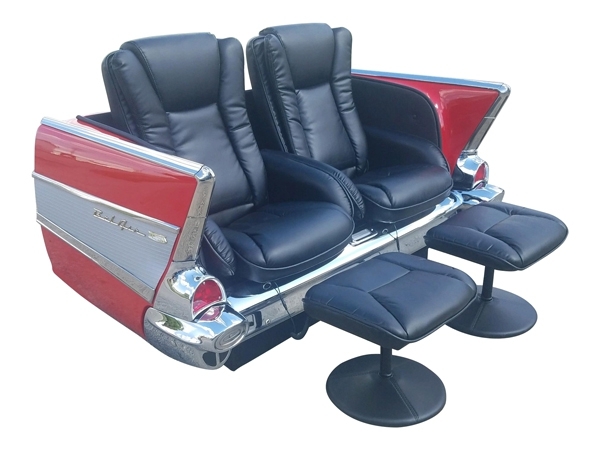 This functional work-of-art is available at an amazing price to the first (4) lucky customers!